An island nation in the middle of the Irish Sea. This is part two of a series of three galleries, from a multi-part holiday taking in three completely unrelated destinations. Part 1 (Lake District) and part 3 (Chester Zoo) can be viewed separately. Except that it isn't. Rather than being an independent nation, Mann is a Crown Dependency; a country that relies on the United Kingdom for some things. Like Wales, Scotland and Northern Ireland, except without being directly governed by the British government. The British monarch is also the Manx monarch, similar to commonwealth countries like Australia and Canada. But Mann is a very small country with a population of under 85'000 at the time of writing. With such a small population, it cannot provide an effective military, so this is provided by the United Kingdom. It does not manage its own international representation; it is represented by the British government. As such it has never been a part of the European Union, and residents have never been elligible for EU freedom of movement unless they are also resident (past or present) of the United Kingdom. Many British laws are adopted, which in turn means that EU laws also make their way into Manx law. On Mann, you may hear the view that the British government would not want to grant them full independence for various reasons. I will stay out of that political quagmire. 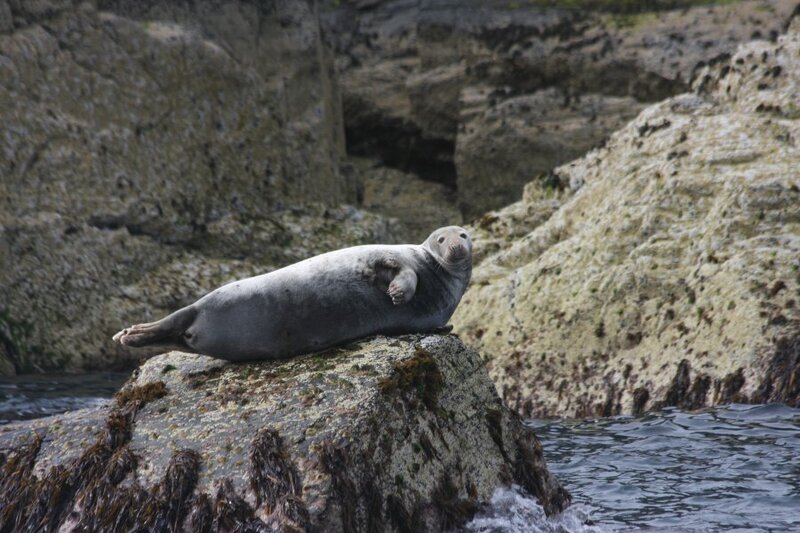 The island is quite small, just 52 km long, and a maximum of 22 km wide, 85% of the size of Ynys Môn (Anglesey island). You could drive around it in less than an hour. In terms of heritage, it was settled by Gaelic Celts, the same family as those of Ireland and Scotland, and they have their own Gaelic language; Manx (though you may struggle to find someone who actually speaks it - only 2% of the population have a passing knowledge, with even fewer fluent speakers). However, due to its location, the English and southern Irish accents seem to dominate. 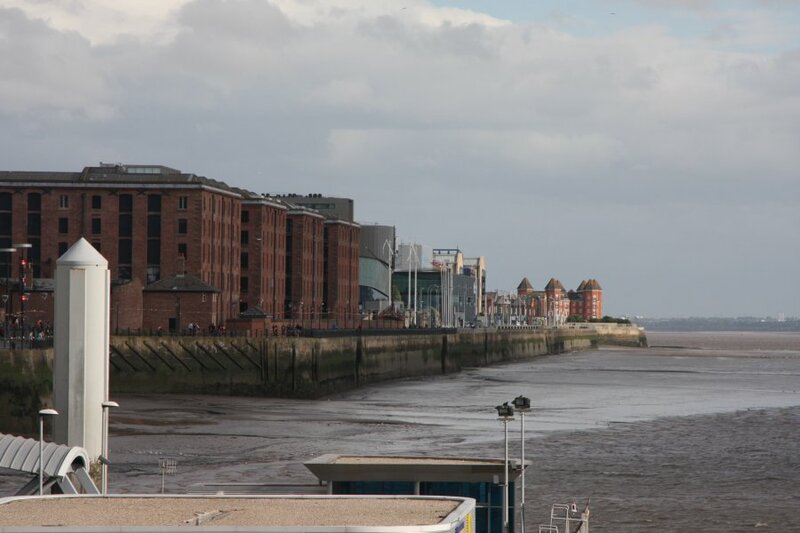 In particular, the most common accent is Scouse, due to the island's history of shipping ties with Liverpool. 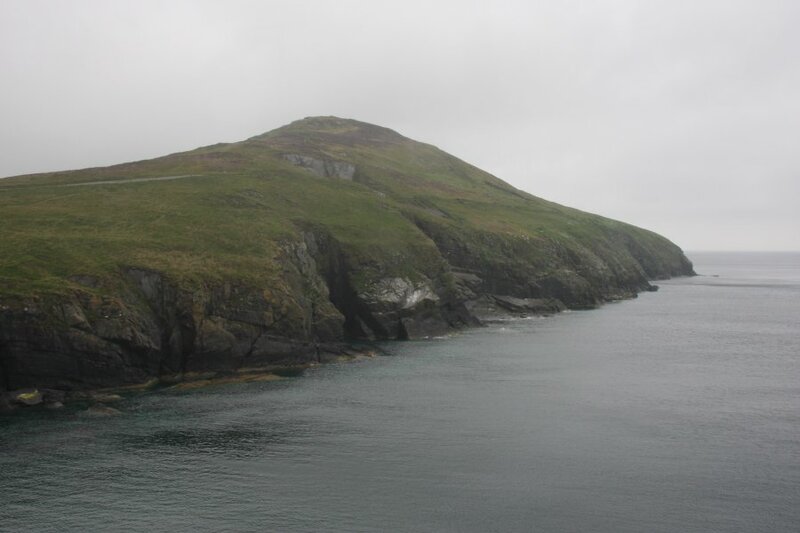 The island's name originates in Manx as older versions of the word "mannin", and is not related to the English word "man". Long regarded as having everything that you might wish to find on the "Mainland" (referring to Great Britain, itself an island), all packed neatly into a tiny space, it became a popular Victorian tourist destination. This remains a major source of income, with the various road races being large draws. As a tax haven with extremely low tax rates, it also makes its money from providing offshore banking. This tax status means that on the island, social benefits and securities are kept to a minimum (and as we were told, this is how they like it). However, unlike the Channel Islands, it shares import revenue with the United Kingdom, so importation taxes are as high as in the UK. The pictures here are presented out of sequence, since the tiny size of the island meant that we drove around it several times, visiting random sites in random orders. Hopefuly, the orderly progression of the gallery makes more sense. 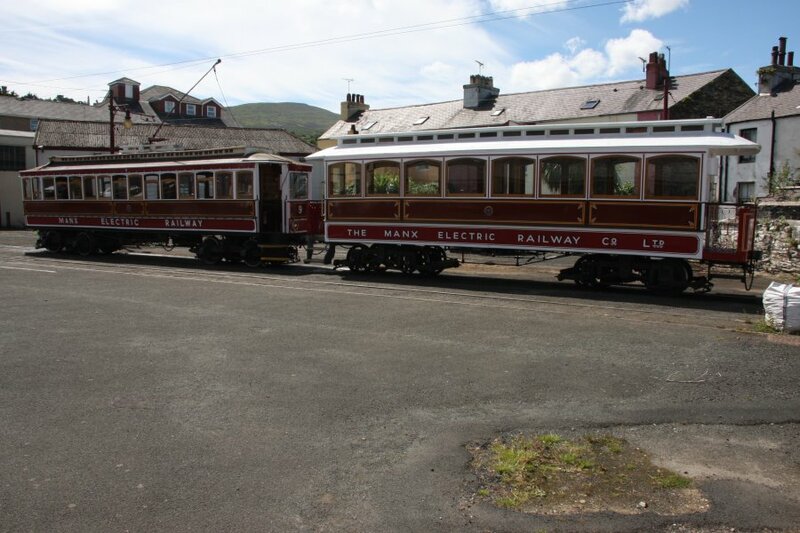 If you are interested, the actual order was: Douglas, Port St. Mary and Port Erin, Snaefell, mountain railway, Ramsey, electric railway, Ballaglass Glen, Dhoon Glen, Glen Mooar, magnetic hill, steam railway, Mull Hill, Calf of Man, Douglas, Laxey Wheel, Peel Castle, Douglas horse trams, electric railway, Groudle Glen, Laxey, Douglas and Old Kirk Braddan. Take a deep breath, it's going to be a big gallery. 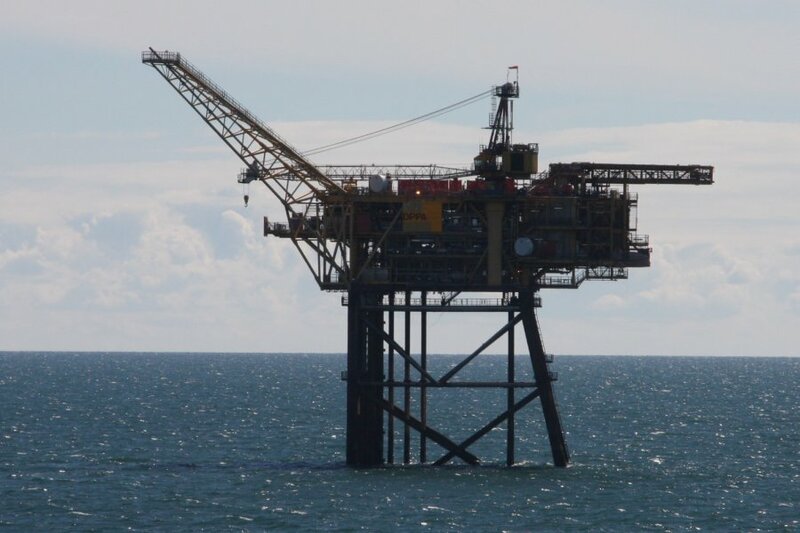 Oil rig in the Irish Sea. 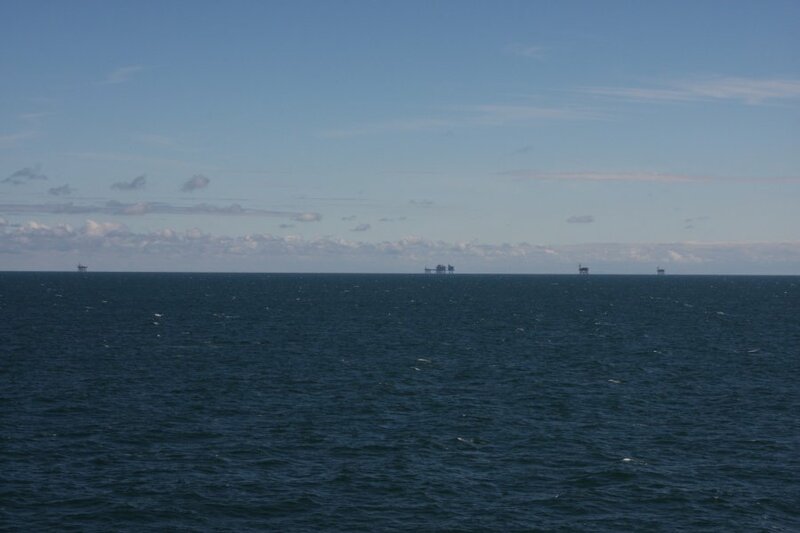 A swarm of oil rigs. 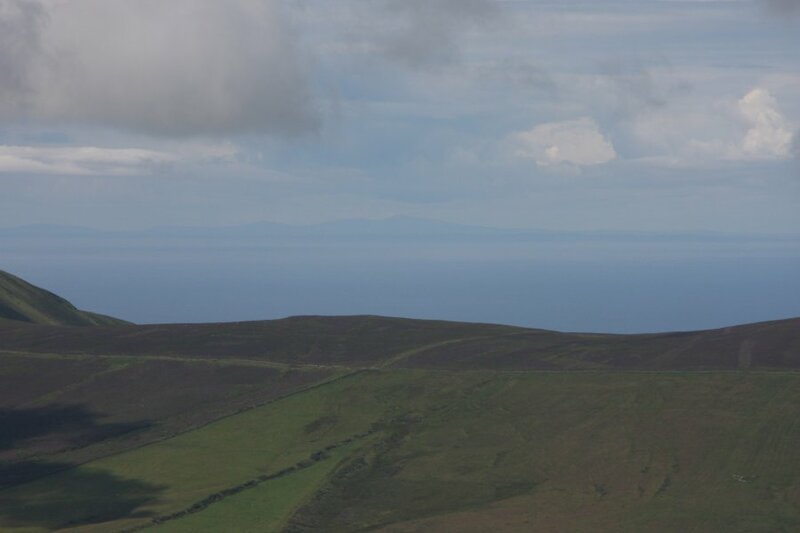 The complete East coast of the Isle of Man, with the mountains and northern flatlands on the right, Douglas at the low part in the middle, and a raincloud almost covering the lower hills and southern flatlands on the left. 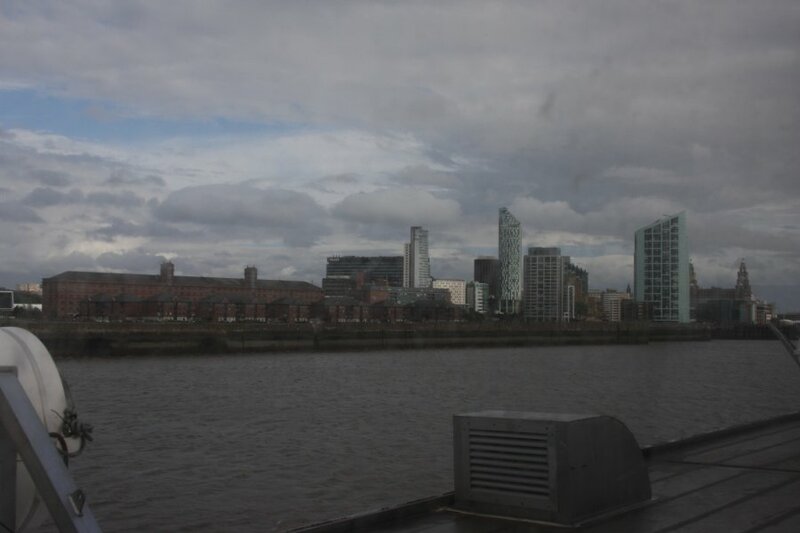 This panorama of 11 pictures was taken through a small window in a ferry that was moving up and down with the waves, making it difficult to get the pictures to line up nicely. The centre of the picture was therefore automatically stitched using Microsoft ICE, so it could correct all of the rotation and distortion. The left side of the picture confused it too much (causing it to misalign and mis-scale the images) because of the haze and rainclouds, so it had to be manually stitched into the panorama. The right side needed to be manually re-stitched after it got the alignment of a stitch wrong. 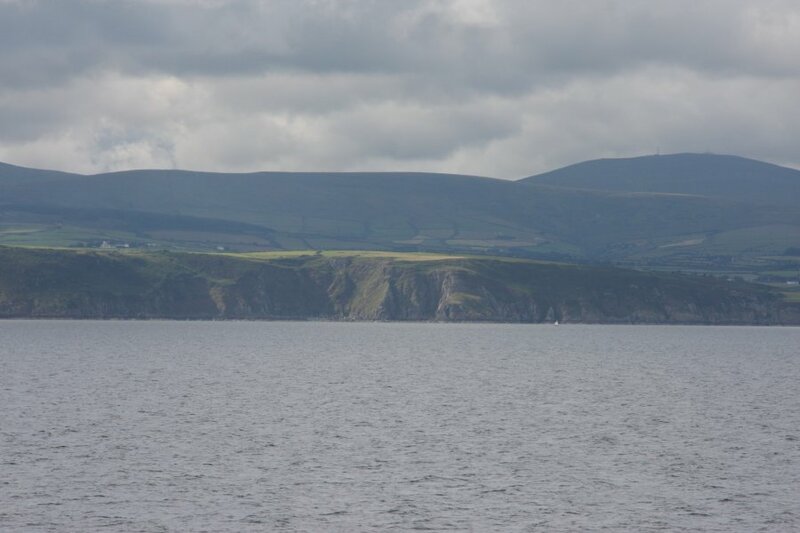 100 metre cliffs at The Clett and Clay Head, with Snaefell in the background. With so few resources on the island, and only a token few tree plantations, it seems building supplies have to come from the mainland. 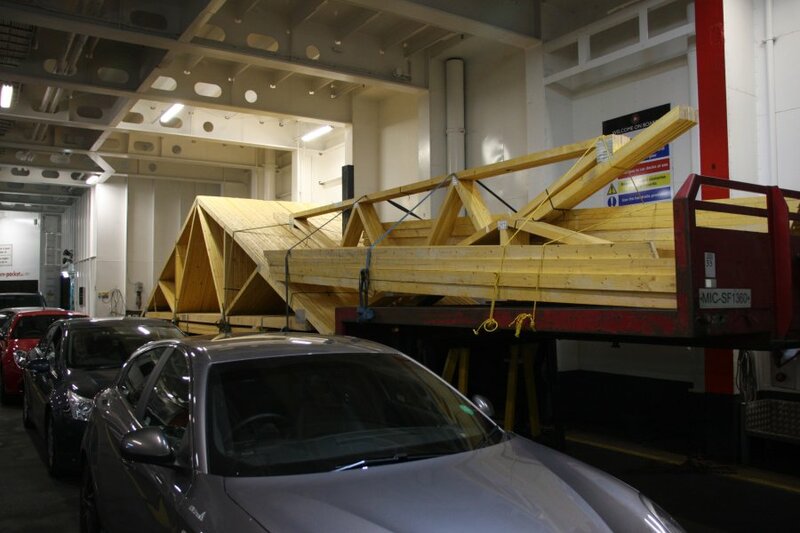 These roofing timbers are being shipped over on the ferry. 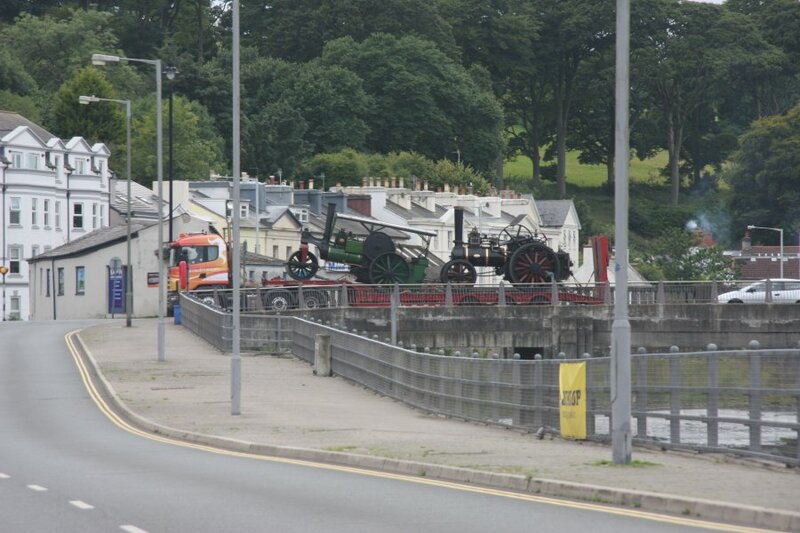 Our arrival coincided with a steam rally of some kind, and several sets of traction engines were blocking the flow of traffic around the island - at least they were on the back of lorries rather than on the roads themselves. 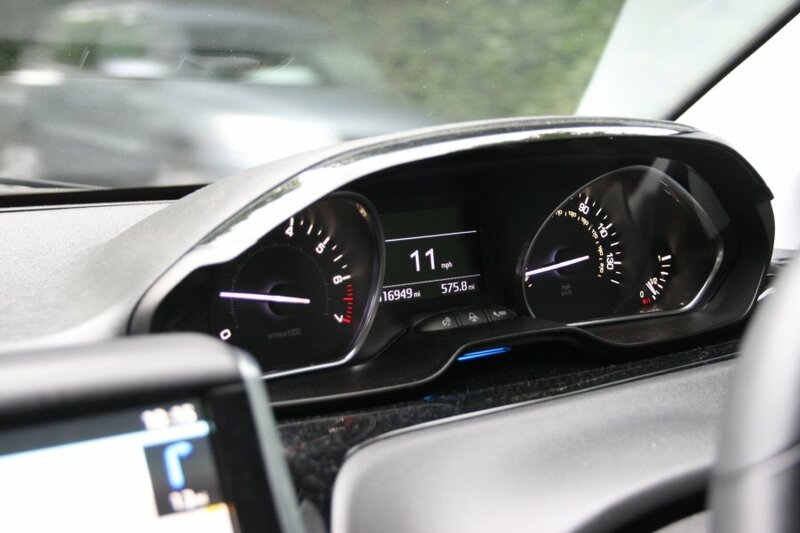 One of the first rules that visiting drivers learn is that there is no national speed limit. Whenever a road is marked as "national speed limit applies", the speed limit is whatever you can safely do in your car. We managed to reach a whopping 11 MPH (18 KPH) behind the traction engines. 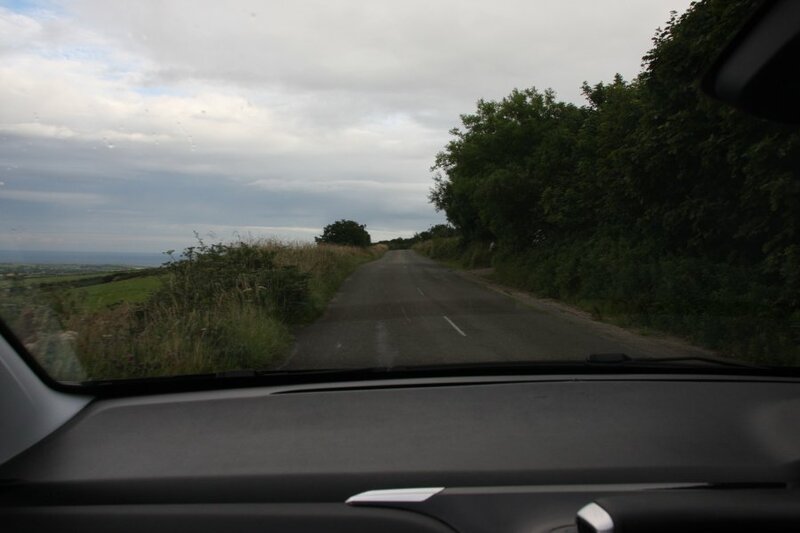 In practice, most drivers use the same speeds as they would on the same type of roads in the UK; 60 MPH, and that was as fast as we got for the entire holiday. 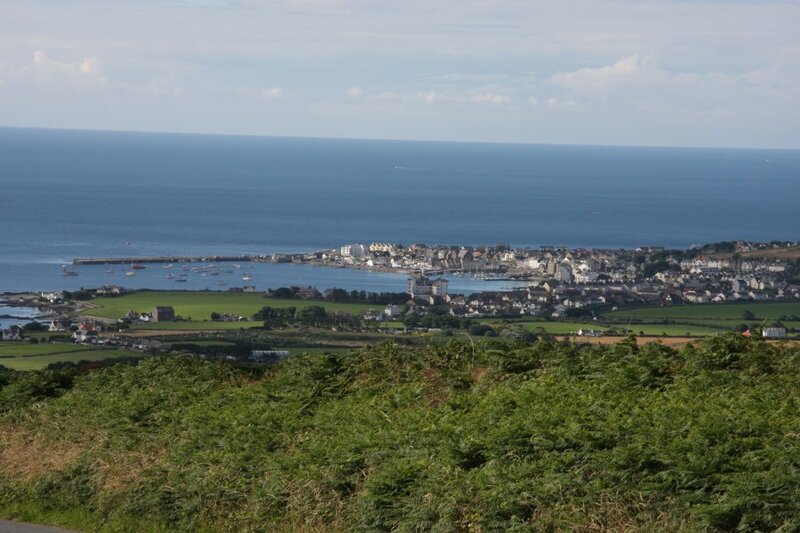 Several parts of the island are used for internationally famous racing events, particularly the Isle of Man TT motorcycle race, Manx Grand Prix and Southern 100. 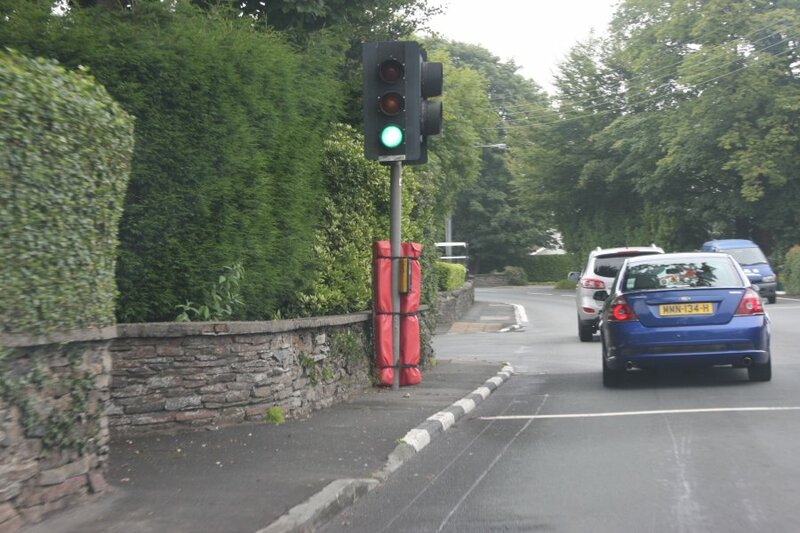 These crash mats line parts of the TT route at Braddan in Douglas, to catch bikers who decide to try riding this part of the route without being connected to their bikes. In theory they might remove these when not in use. But they also might not. The kerbs are painted for much of the race routes at all times of year. The current fastest lap was done at average speeds of 134 MPH on a motorbike, with a sole ralley car averaging 129 MPH. Token crash mat at a traffic light in Glen Vine. The wall right next to it, on the other hand, apparently does not need protecting. During our visit, we saw a number of bikers trying the routes for fun, keeping to the speed limits in the towns, and letting it rip on the countryside sections. The ferries, particularly the return ferry, were loaded with motorbikes and superbikes from those eager to have a try at the routes. 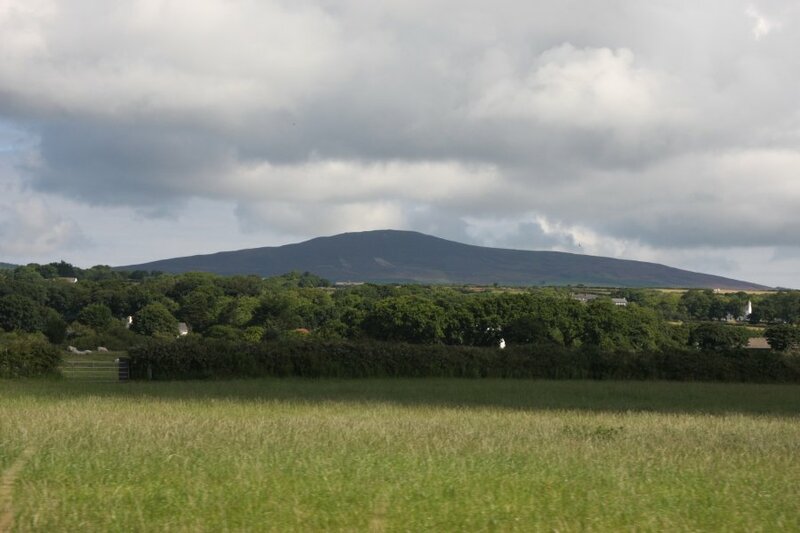 Cronk ny Arrey Laa (443 metres) and South Barrule (483 metres) from Newtown. Cronk ny Arrey Laa from Ballasalla. 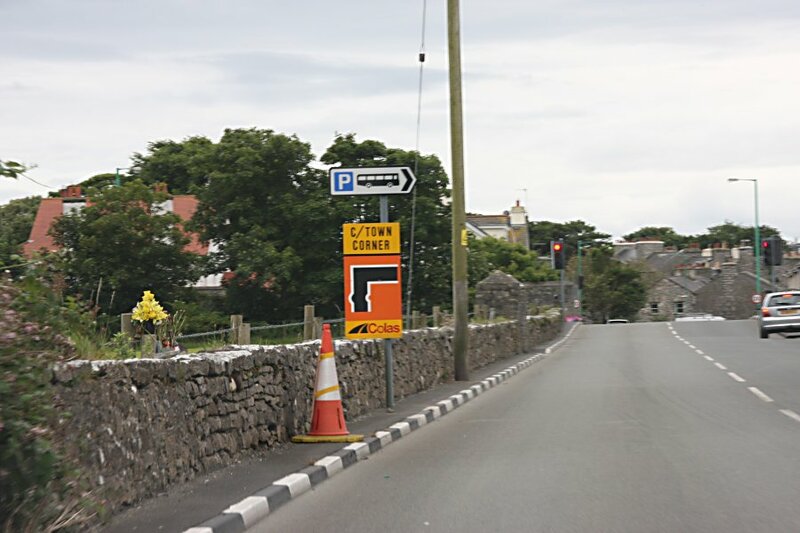 Bridge and corner marker for the bike races, at Castletown. There is another obvious sign of being on a racing route; the roads are well maintained, and well surfaced. Leave a race route, and the potholes start to appear. Balla Keighan corner. This is the sort of road where you can expect a biker to hit 186 MPH (300 KPH), or more if their bike is not artificially limited. These are not German autobahns; they are nothing more than a single carriageway A-road or B-road. Southern 100 start/finish in Castletown. 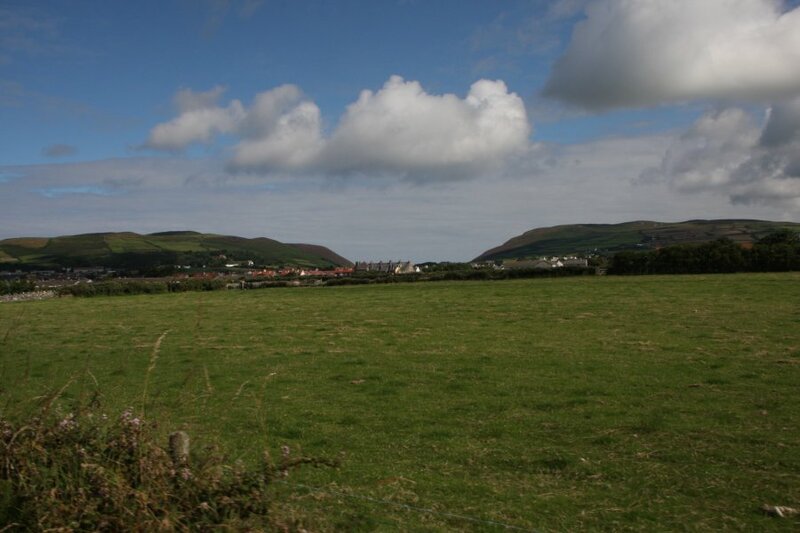 Bradda Hill (234 metres) above Port Erin, seen here from the outskirts of Castletown. 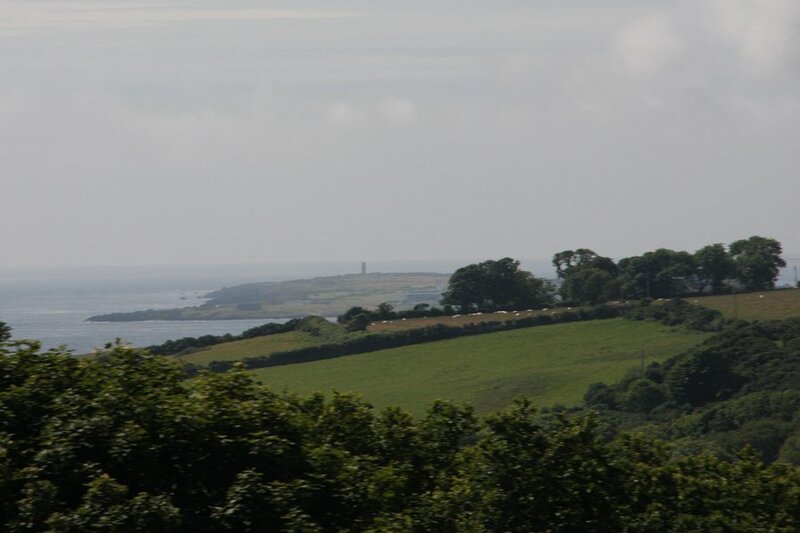 Mull Hill (163 metres), sitting above Port St. Mary. Castletown from the slopes of Lhiattee ny Beinnee. Port St. Mary from Lhiattee ny Beinnee. Cronk ny Arrey Laa from Lhiattee ny Beinnee. 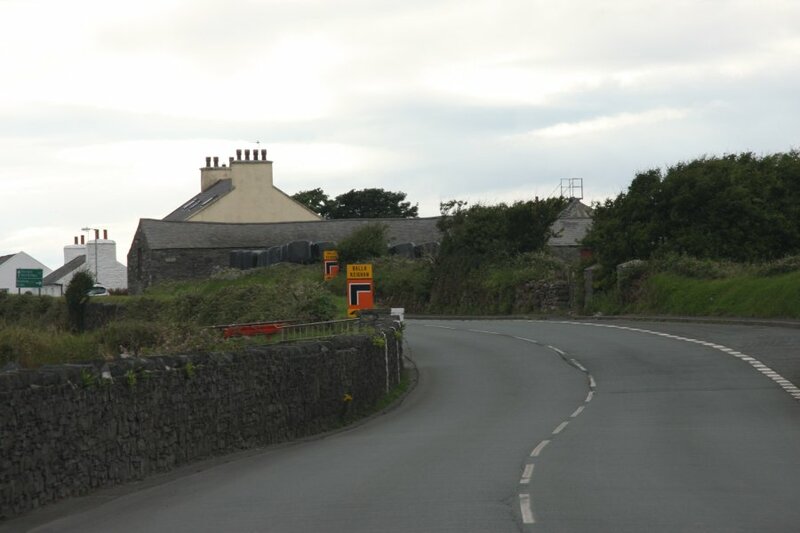 Road winding up Cronk ny Arrey Laa. On the far side of the hill is the highest of the island's coastal slopes, between 300 and 350 metres of the hill's side is a sloping sea cliff. Lhiattee ny Beinnee (301 metres). 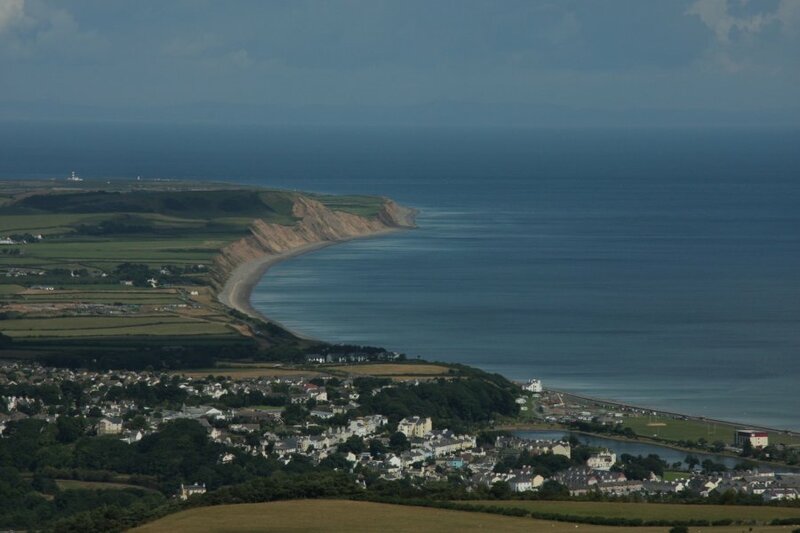 The far side drops very steeply down to the sea, with over 270 metres being cliffs or crags. View from Cronk ny Arrey Laa. 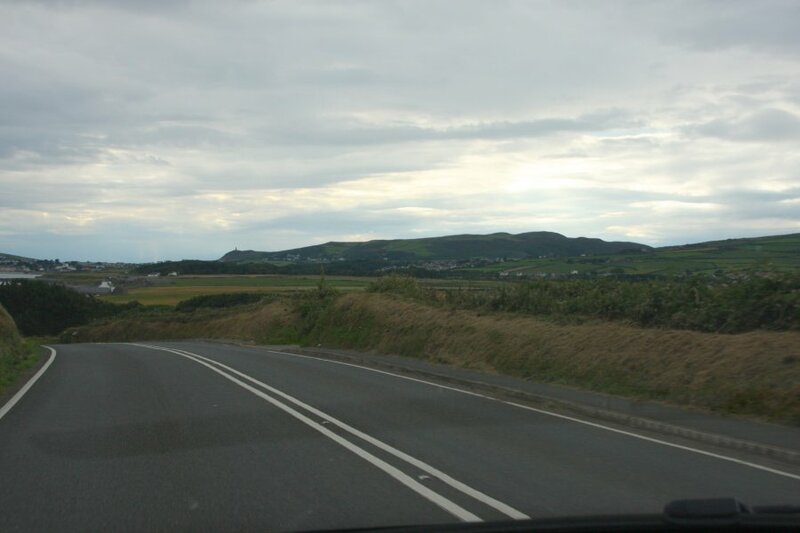 On the left is Corrins Hill (152 metres), followed by the green slopes of Dalby Mountain (280 metres) and Slieau Whallian (333 metres), several mountains in the clouds, the peak of South Barrule, and The Mount (about 230 metres) getting lost in the coastal countryside around Douglas. 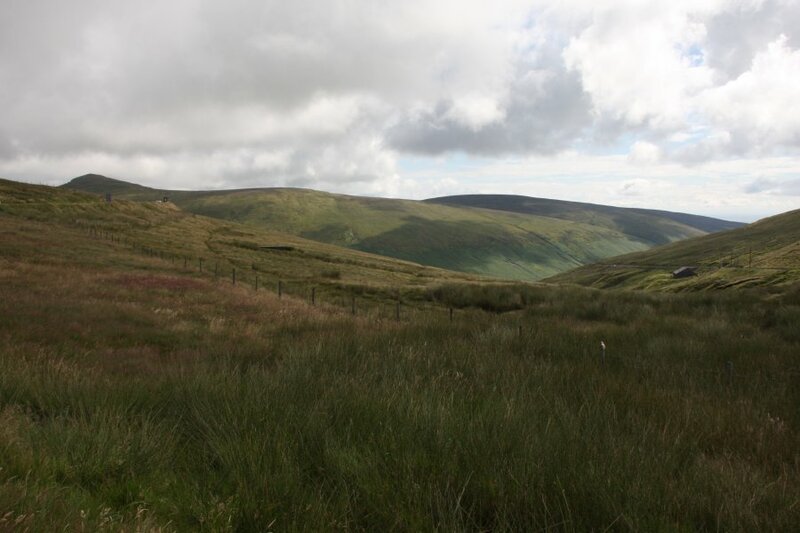 View over Foxdale from South Barrule. On the left is Dalby Mountain followed by the ridge of Carnagrie (about 270 metres) and Slieau Whallian. 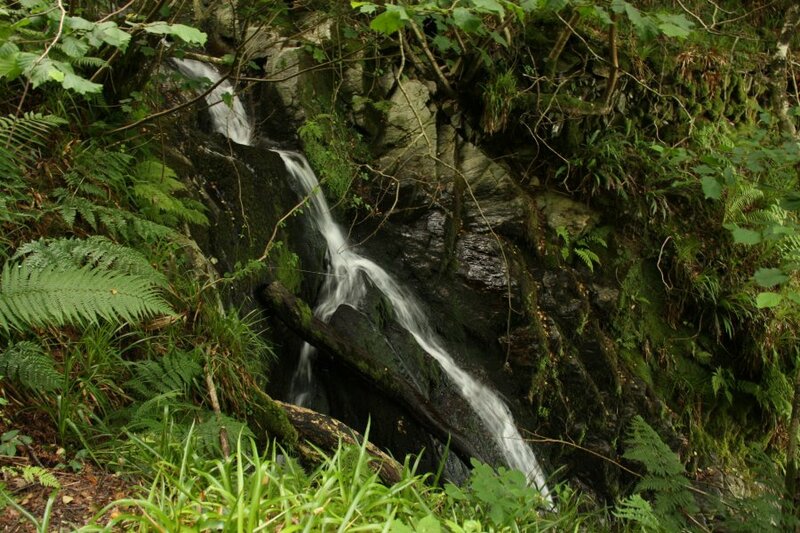 Dalby Mountain and Carnagrie are separated by one of the many Glen Mooar valleys on the island - this is the one that becomes Glen Maye before it reaches the sea. The distant hills are Beary Pairk (about 300 metres), Beary Mountain (311 metre ridge) and Slieau Ruy (479 metres), with the forest of Archallagan Plantation (about 220 metres) on the right. 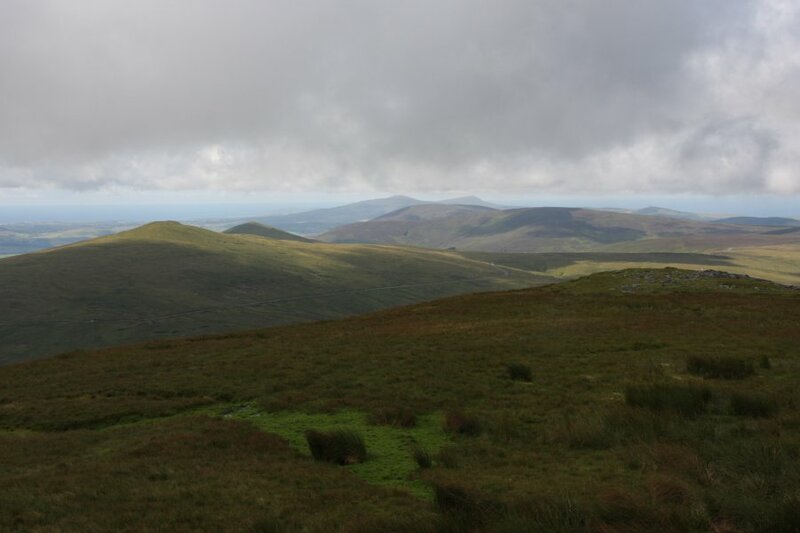 In the distance are Sartfell (454 metres) and Colden (487 metres) on the left, and Mullagh Ouyr (491 metres) and Carn Gerjoil (445 metres) on the right. 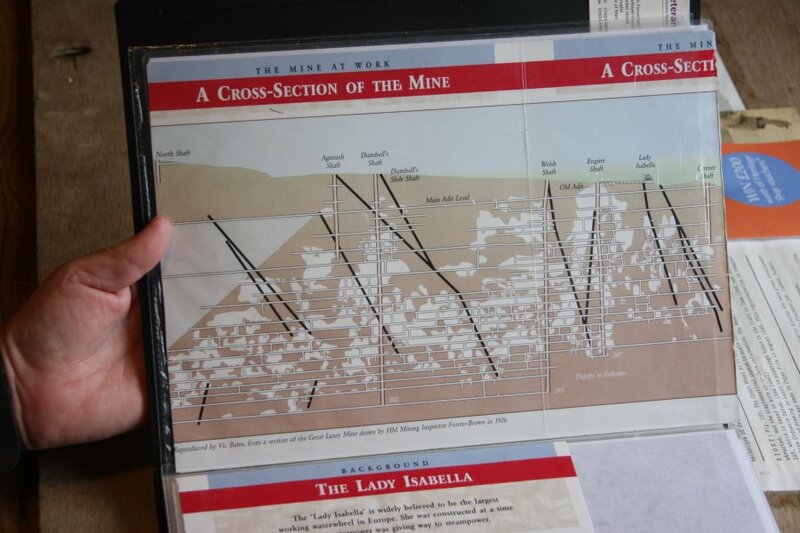 Cross Vein Mine (aka. "Snuff The Wind"), an industrial revolution era lead mine. Sartfell trying to shake off the cloud. 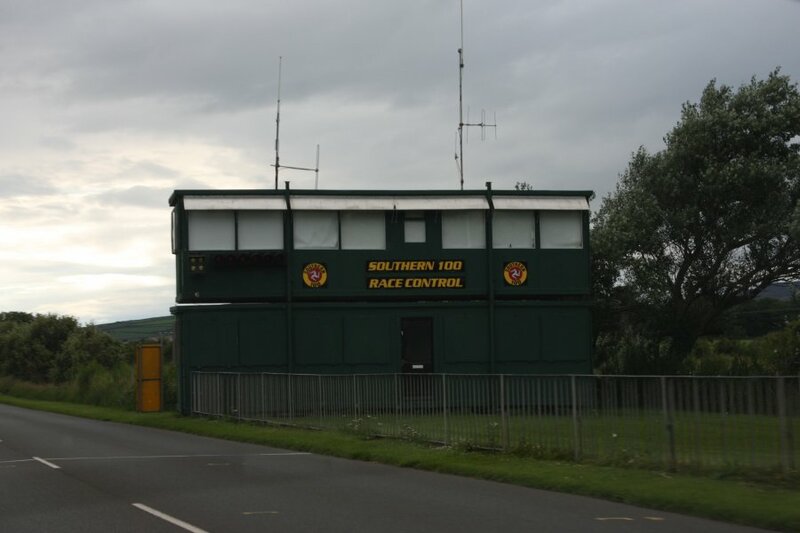 We have now rejoined the 38 mile (61 km) TT/Grand Prix route, called the Snaefell Mountain Course. This is Drinkwater's Bend, named after the first of 4 competitors who crashed and died here over the years. So far there have been over 250 deaths during competitions on this course, 4 of which happened in the month before our visit. These races are a serious undertaking, with between 1 and 9 competitors dying most years since 1938, and every couple of years since 1911 before that (1982 and 2001 are the only exceptions). In some years, race officials or spectators are also killed, so that in 2006, there were a total of 11 deaths, 9 of which were competitors. During World Wars I and II the races were not held, so these are the only long periods where there were no fatalities. Crazy statistics from the World's most dangerous sporting event. 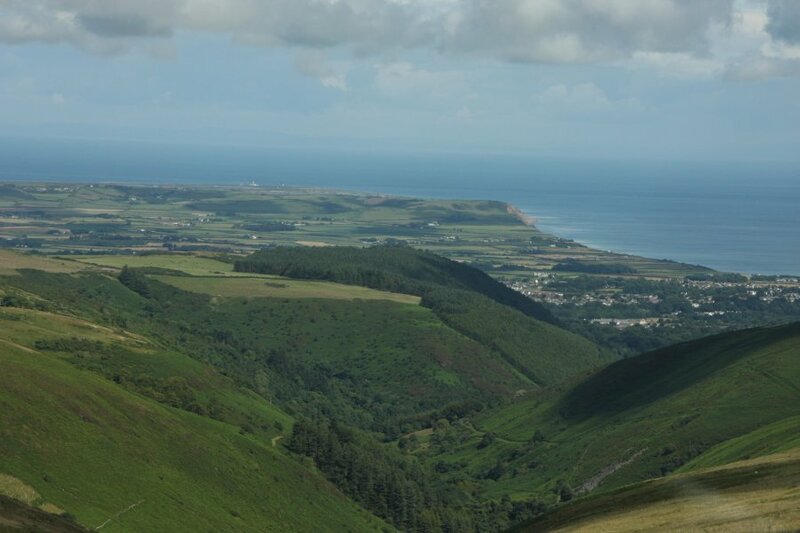 View over Druidale into Sulby Glen from Slieau Maggle. On the left are Sartfell, Slieau Freoaghane (488 metres), an unnamed bump (400 metres), Slieau Dhoo (424 metres according to the OS map, 428 metres according to OpenStreetMap, and 432 metres according to a Wikipedia article) and Mount Karrin (331 metres). 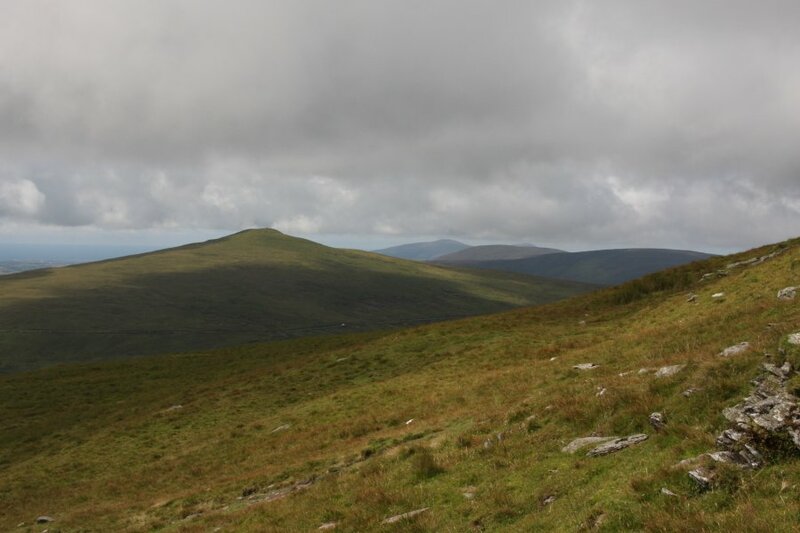 On the right are Slieau Managh (383 metres), the tip of North Barrule (565 metres), Snaefell (621 metres) and Beinn-y-Phott (544 metres). The road on the right climbs Injebreck Hill (about 420 metres). View into the West Baldwin valley, where the River Glass flows through the West Baldwin reservoir to reach Douglas (giving it the second half of its name). 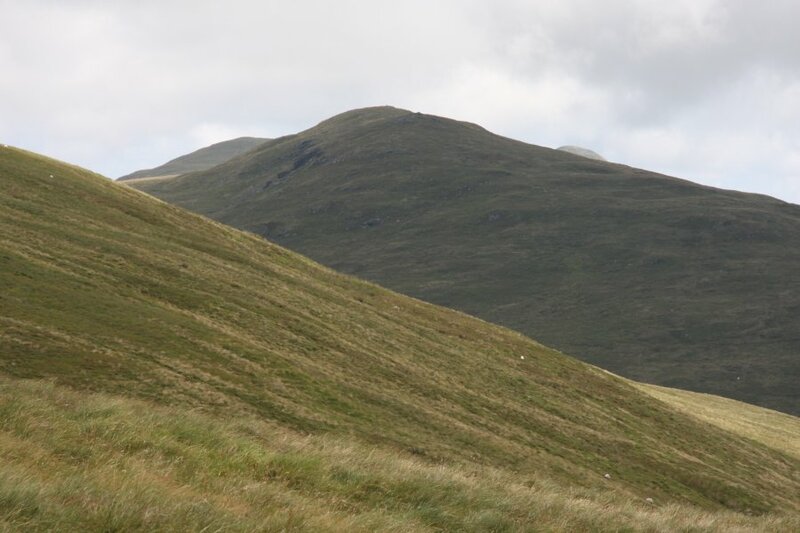 On the left are Beinn-y-Phott and Carraghan (500 metres). 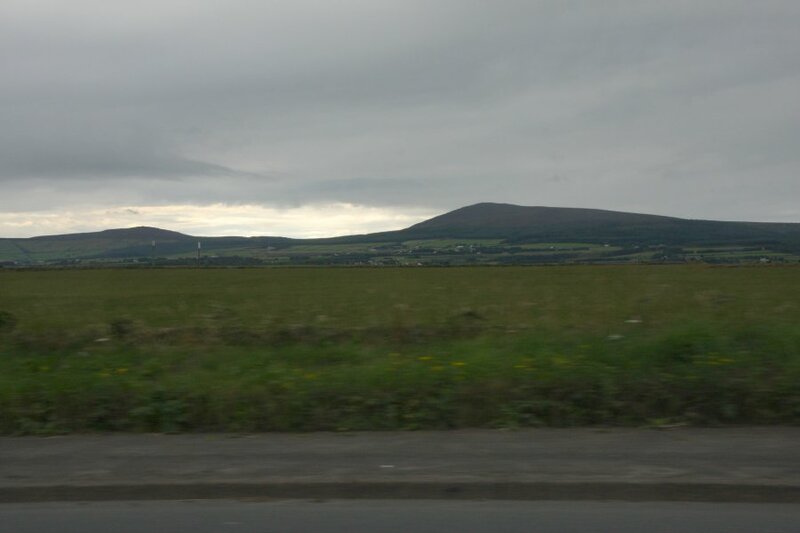 On the right are Colden and Injebreck Hill. 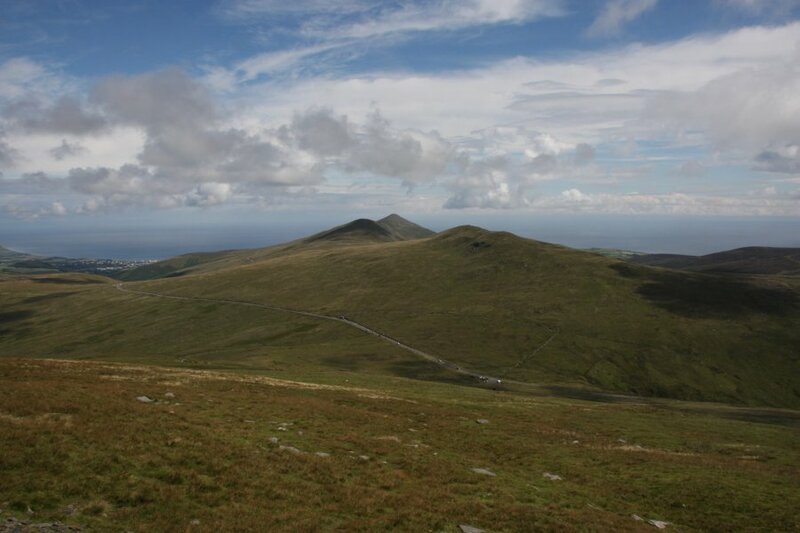 Snaefell's height is normally listed as 620 metres (2034 feet), but according to the OS maps and trig point data, the actual height is 620.9 metres, correctly rounded up to 621 metres (converted correctly as 2037 feet or sometimes incorrectly as 2036 feet). 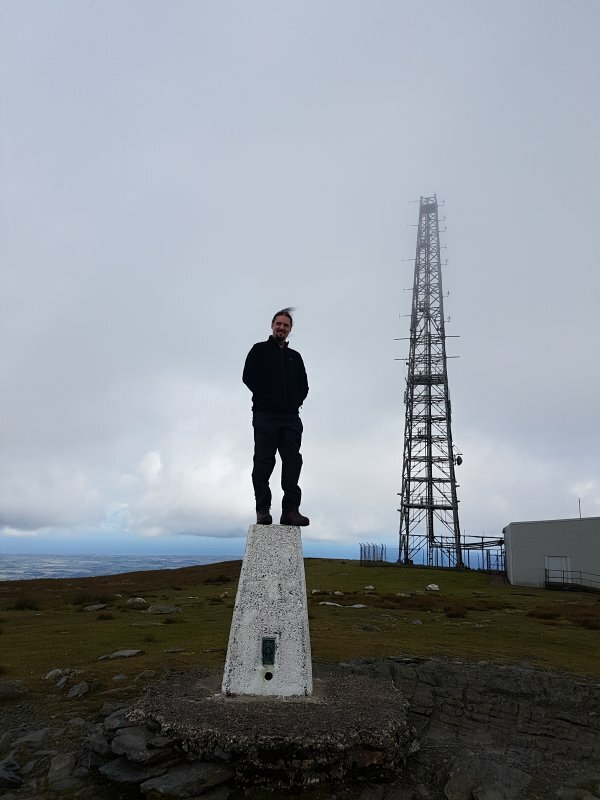 620 metres is either used when people incorrectly subtract the height of the trig point (heights are listed for the reference mark inside the base, at ground level), or when they incorrectly round down instead of rounding to the nearest integer. Being barely tall enough to be called a mountain, in any other mountain range, it might not matter. 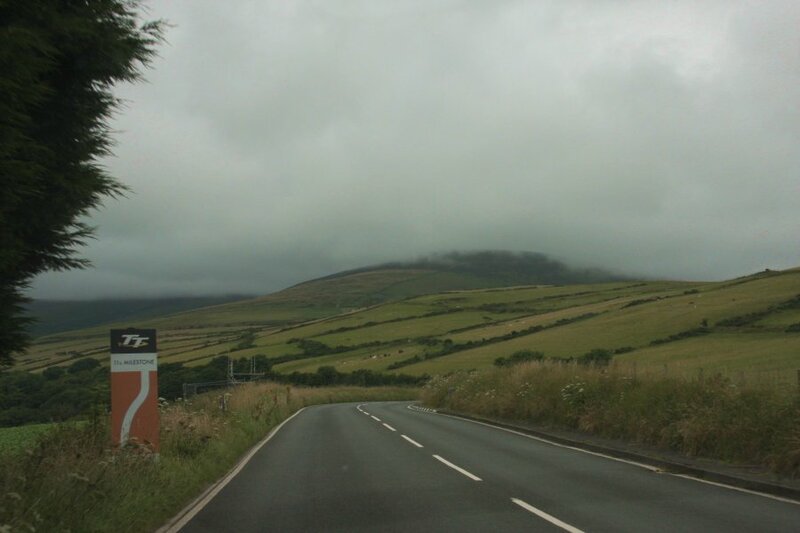 However, as this is the only mountain on the island, it seems a little odd for people not to take pride in that metre. 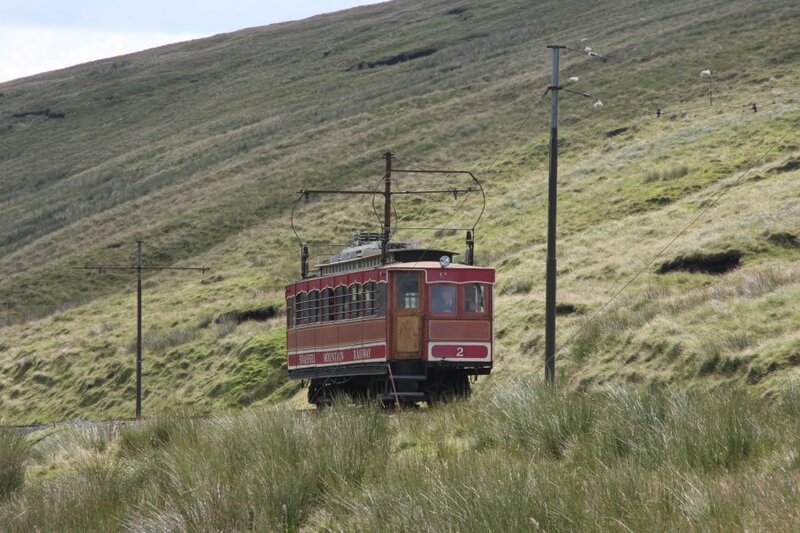 The Snaefell Mountain Railway, which runs from Laxey to a height of about 600 metres on the mountain, built in 1895. 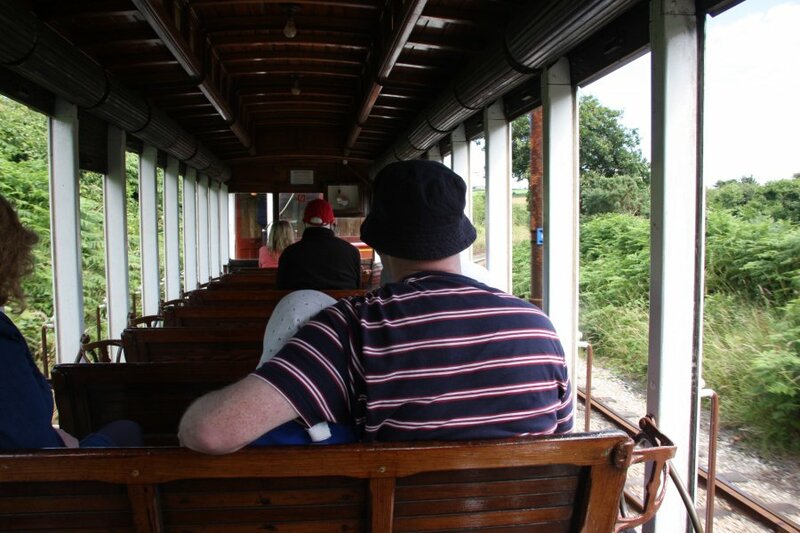 Unusually for a mountain railway, it does not use the centre cog rail to climb, so it can only cope with gentle gradients. It does use the cog rail as a brake when descending. Much though I despise the defacing of national icons with mountain railways, it is a feature that fits in with the spirit of the island. Crossing the road. No barriers, just some lights 150 metres before the level crossing. 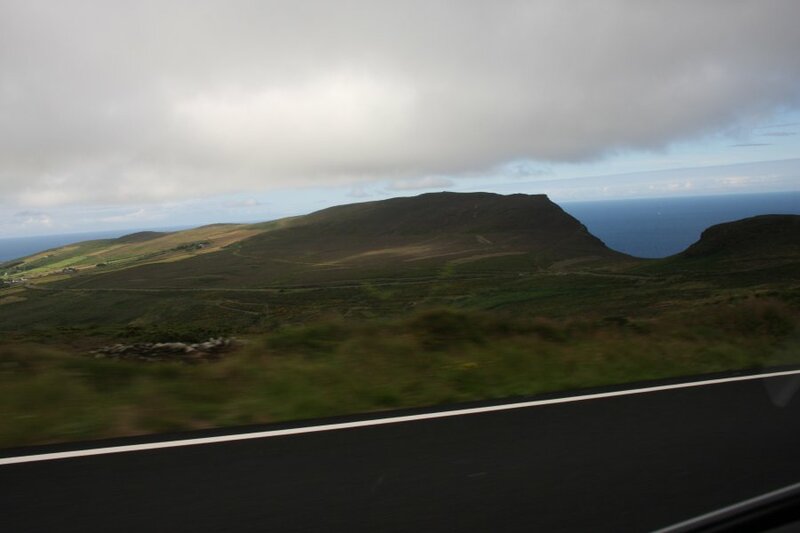 This is part of the Snaefell Mountain Course, where bikers try their hand at the racing course, flying through here at well over 100 MPH. Would they really have enough time to stop? 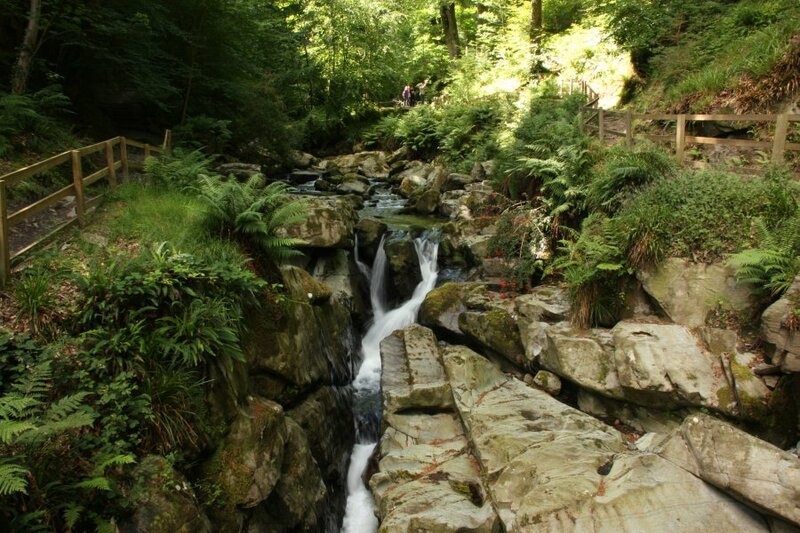 Looking down Laxey Glen towards Claghr Ouyr (551 metres) and Slieau Lhean (469 metres). View towards Bungalow. We were entertained on our walk by the bikers racing down the road into the distance. The fastest we saw competed with a powerful sports car, with the car appearing to reach perhaps 150 MPH (241 KPH) and the bike going so much faster that it left the car to eat its dust. 186 MPH (300 KPH) is a rough estimate - certainly it took only about 15 seconds to get up to speed and disappear over the horizon 1.125 km away. During the TT races, the maximum speed recorded was 206 MPH. The mountains are Mullagh Ouyr, Beinn-y-Phott, Slieau Maggle (427 metres), Sartfell and Slieau Freoaghane. 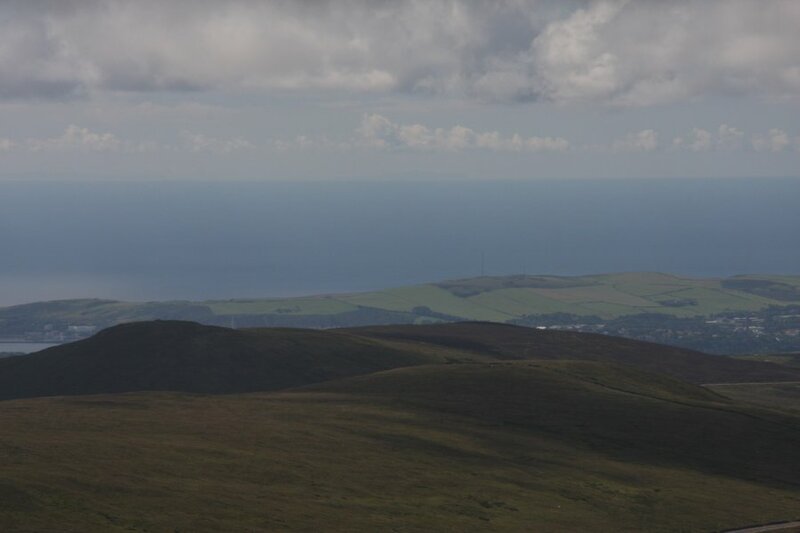 The summit of Snaefell with its two radio towers, Claghr Ouyr, the tip of North Barrule (565 metres), Slieau Lhean, Mullagh Ouyr, The Mount in the distance, Beinn-y-Phott and Colden. 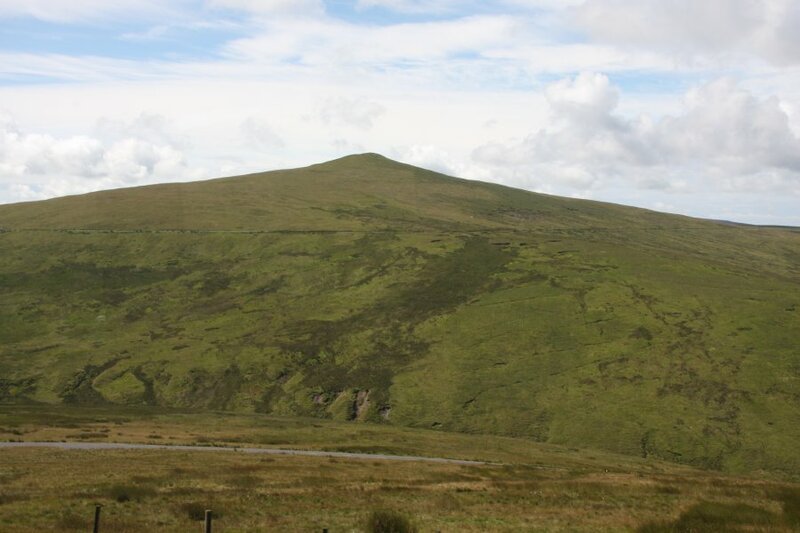 Claghr Ouyr and the multiple peaks of North Barrule (the 550 metre and 533 metre peaks are on the left). Mountains to the south: Beinn-y-Phott, South Barrule, Slieau Ruy, Cronk ny Arrey Laa and Colden. 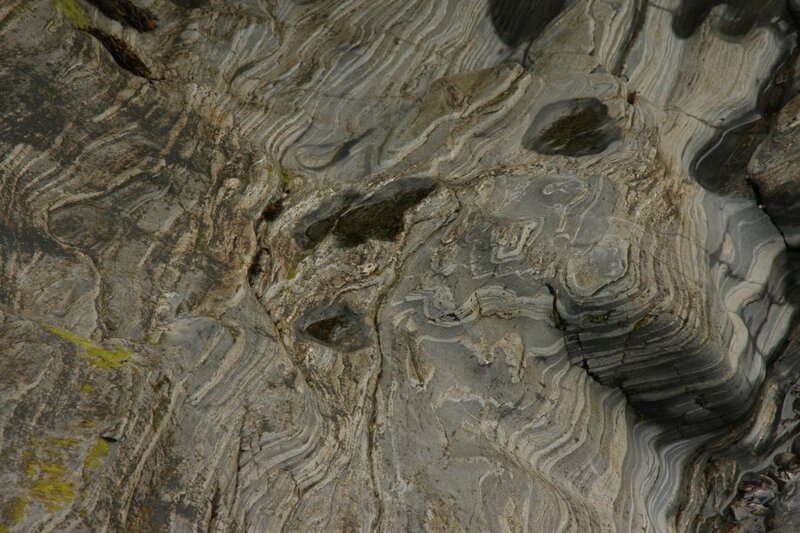 Snaefell is made from mudstones and quartz. The northern and eastern parts of the island, with the northern lowlands on the left and Ramsey at their right side. 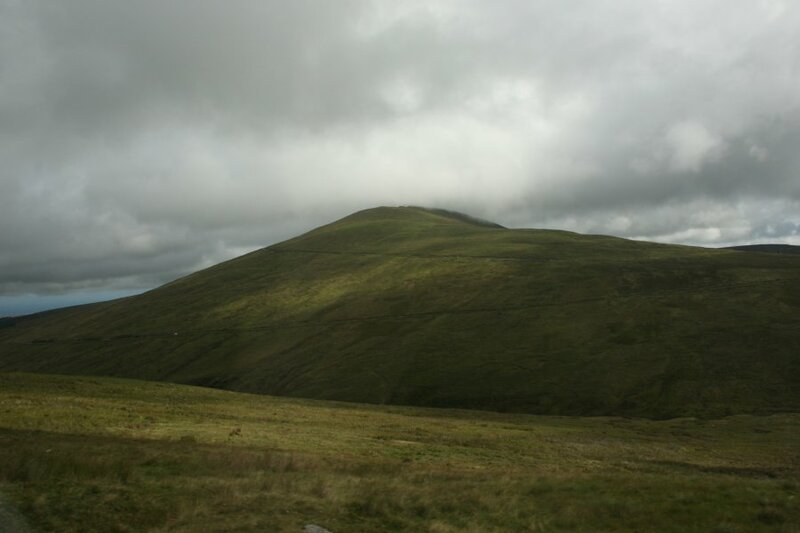 The mountains are an unnamed bump (336 metres) in the direction of the northern point, North Barrule, Claghr Ouyr, Slieau Ouyr (452 metres), Slieau Lhean. The eastern, southern and western parts of the island. 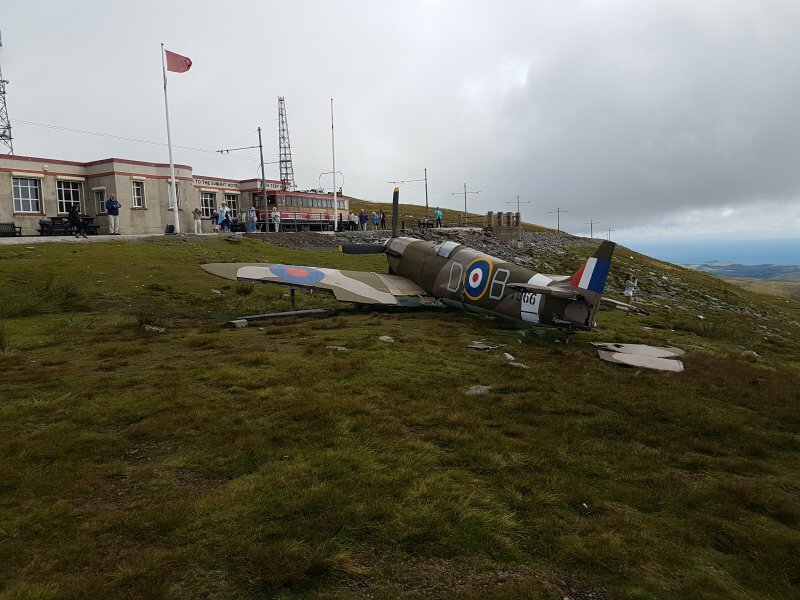 The World War II era spitfire was added as an ornament in 2016, a rather dramatic welcome to the summit area. The mountains are Slieau Ouyr, Slieau Lhean, Mullagh Ouyr, Carn Gerjoil, The Mount in the distance, Beinn-y-Phott, Carraghan, South Barrule, Slieau Ruy, Cronk ny Arrey Laa, Lhargee Ruy (436 metres) appearing as only a ridge, Colden, Slieau Whallian, Beary Pairk, Injebreck Hill, Slieau Maggle, an unnamed bump (about 260 metres), Sartfell, Slieau Freoaghane, the 400 metre unnamed bump, Slieau Dhoo, Slieau Curn (351 metres). One of the few places where you can see every mountain and almost every hill in a country at the same time. The eastern hills with Ramsey on their left. In theory, England should be visible in that direction, but the low clouds block the view. The Sulby Reservoir surrounded by the western hills. This is the largest lake on the island, but it is completely artificial. 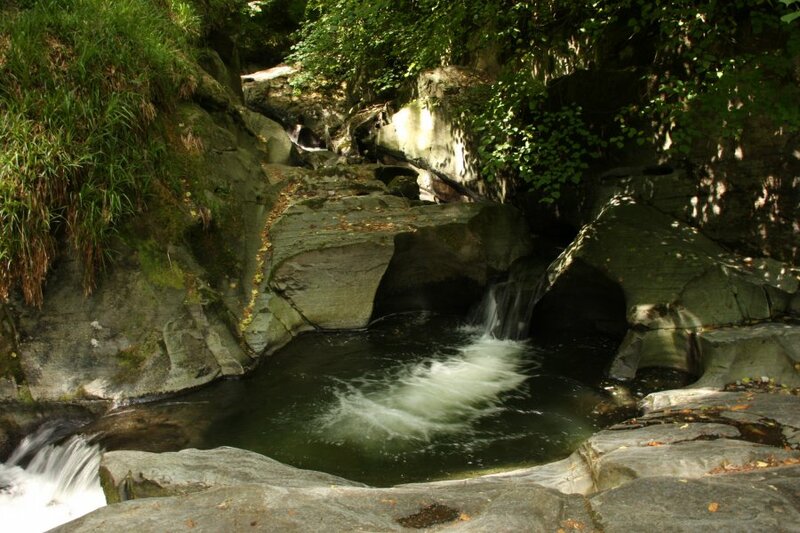 There are no natural freshwater lakes of any size on the island, though there are a few natural ponds. On the summit. 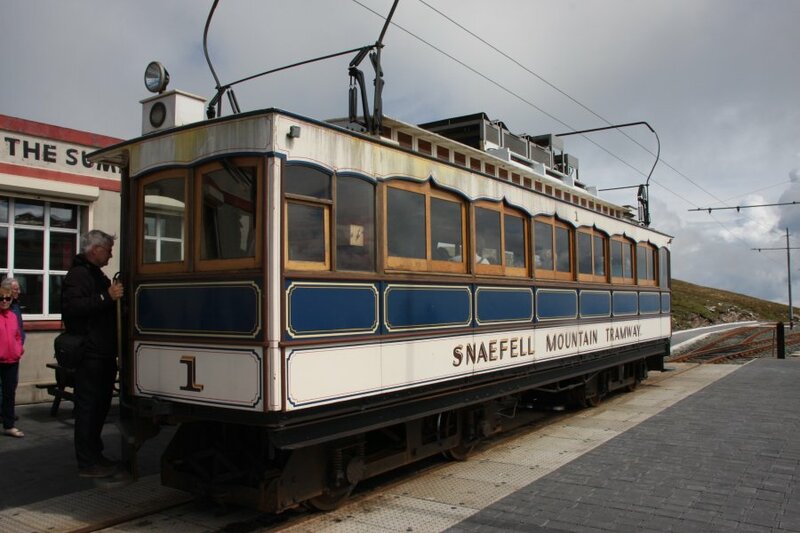 In English, Snaefell rhymes with Stay Fell, but you may also hear the "ae" pronounced like the "a" in cat (like it would in modern Norwegian) or as the word "eye" (like it would in Latin or Welsh). However, the name is originally from old Norse, where it would have sounded like a longer version of the "e" in bed (similar to the word "air" in Received Pronunciation English - posh British - or "ehh" in most accents), so to speakers of Received Pronunciation English, it would have originally sounded like Snare Fell. With such a cultural mix on the island, it is hardly surprising that a traditional name may be mispronounced. 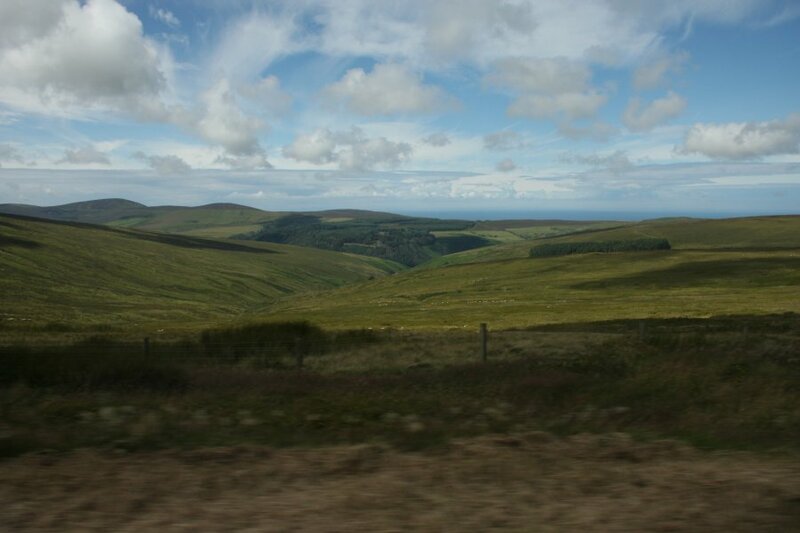 View of Wales 100 km to the south. 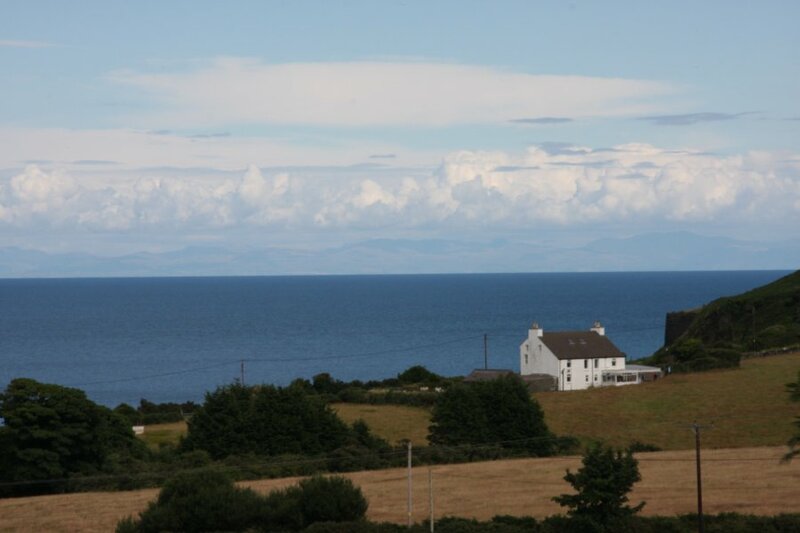 The larger shadow in the middle of the picture is Holy Island in Ynys Môn (Anglesey). The faint hazy shadow on the left is the main island of Ynys Môn. 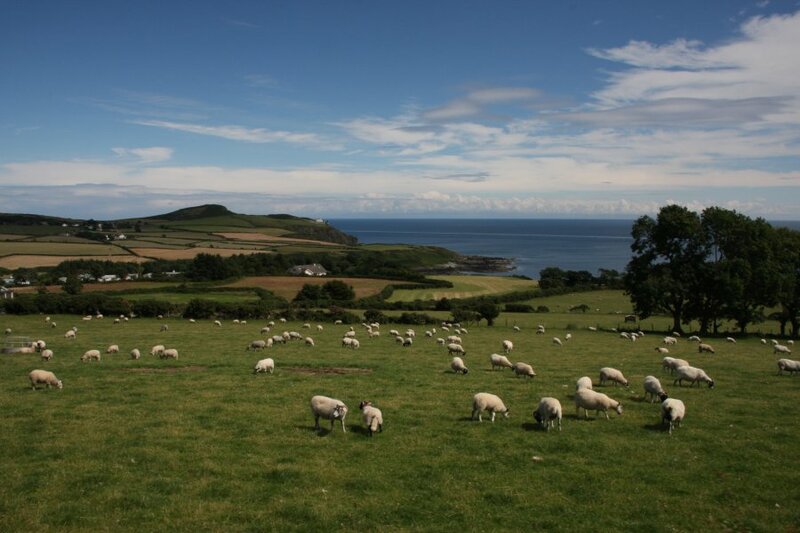 Although the exact meanings of Manx "mannin" and Welsh "môn" are not known, the names of the two islands probably mean the same thing, originating as the same word in older celtic languages. Possible meanings are "mountain", "isolated" and "beside water". 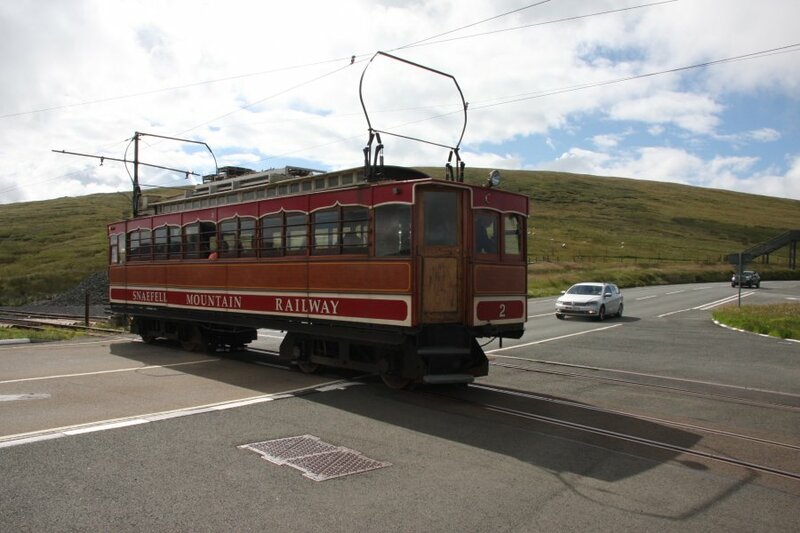 Tram at the Snaefell Summit station. Location of the station. The summit is further up, between the two radio masts. View over the northern flatlands to Machars peninsula in Galloway, Scotland, just over 45 km away. 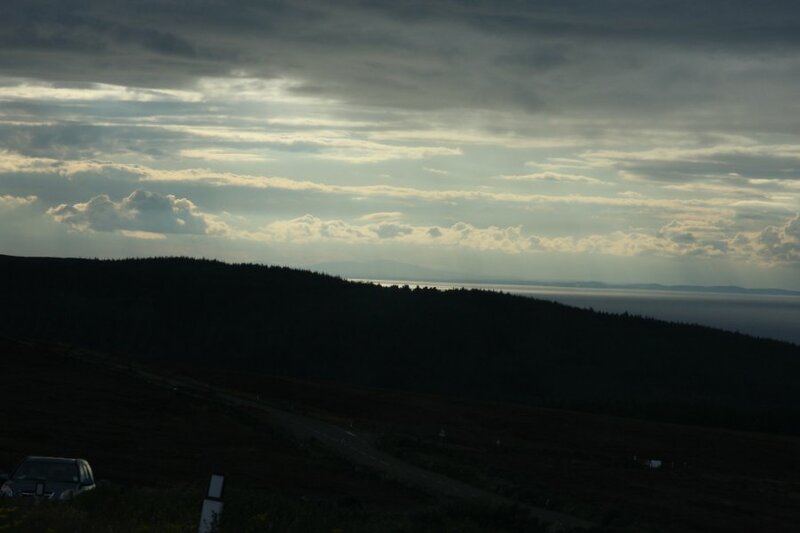 View over Mount Karrin to the Mull of Galloway in Scotland, 50 km away. The white tower appears to be just a house. 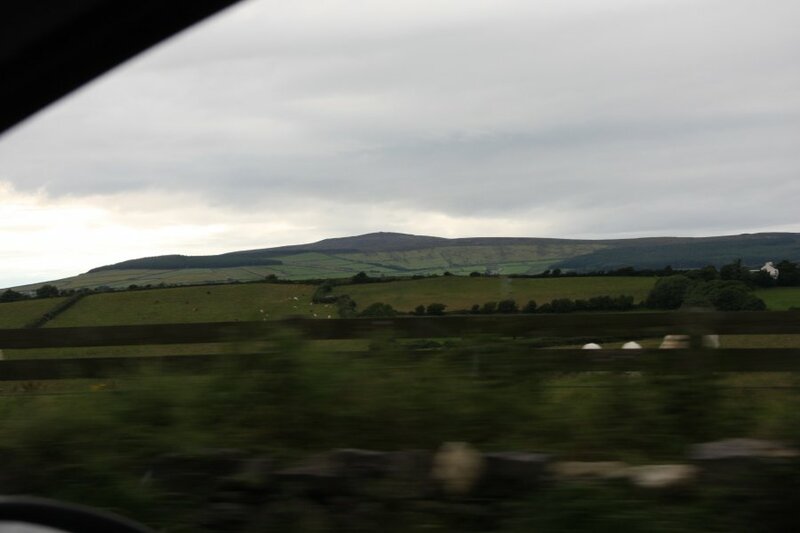 View of the 100 km distant Belfast Hills in Northern Ireland over Slieau Curn. 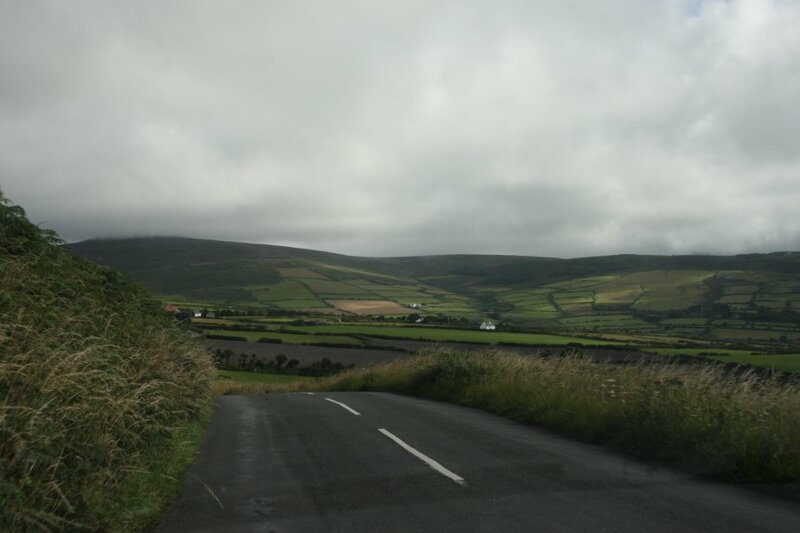 The hills lie on the far side of Belfast, but even though the coast is only 60 km distant, it cannot be distinguished. Looking over the 400 metre unnamed bump to Slieve Croob (534 metres) in Northern Ireland, also about 100 km away. 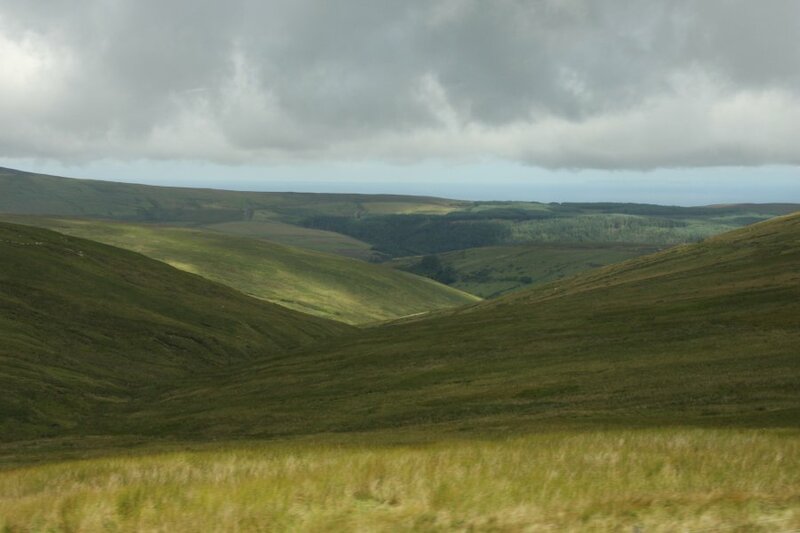 Looking down Block Eary into Sulby Glen, with Slieau Freoaghane, the 400 metre unnamed bump, Slieau Dhoo, Slieau Curn, Mount Karrin and the slopes of Slieau Managh. Looking down Glen Auldyn towards Ramsey. 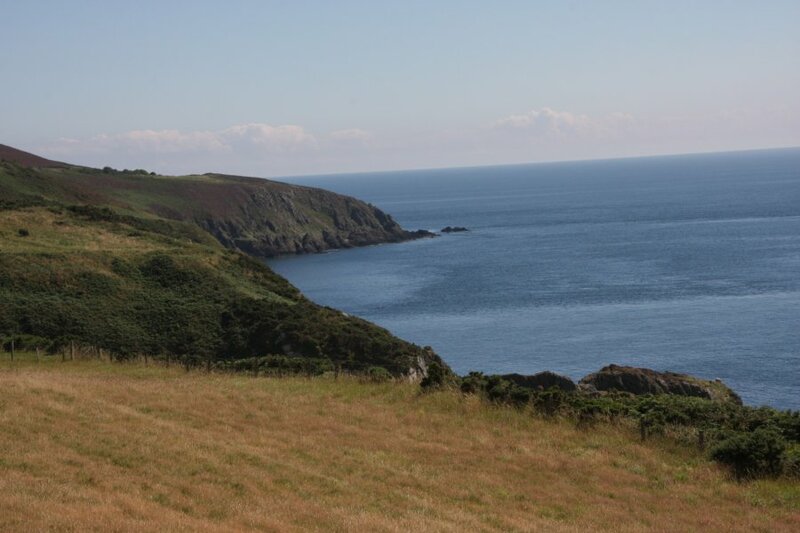 The Point of Ayre Lighthouse can be seen on the Point of Ayre - the northern most point of the Isle of Man. 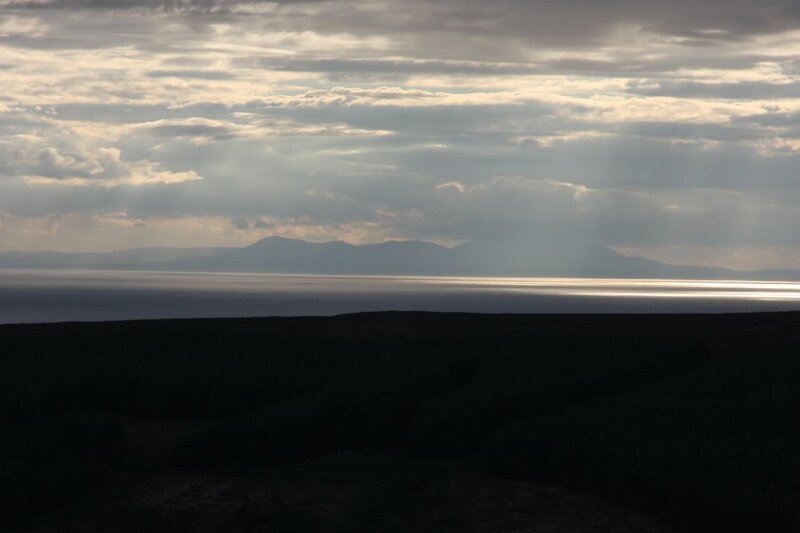 Beyond that is Galloway in Scotland, 60 km away on the horizon. Ramsey Bay and the Point of Ayre Lighthouse. The red cliffs are at Shellag Point, and the tiny 80 metre hill is confusingly called Cronk ny Arrey Laa, just line the one at the opposite end of the island. The 500 metre long lake in Ramsey is the Mooragh Park lake, but once again, it is artificial. 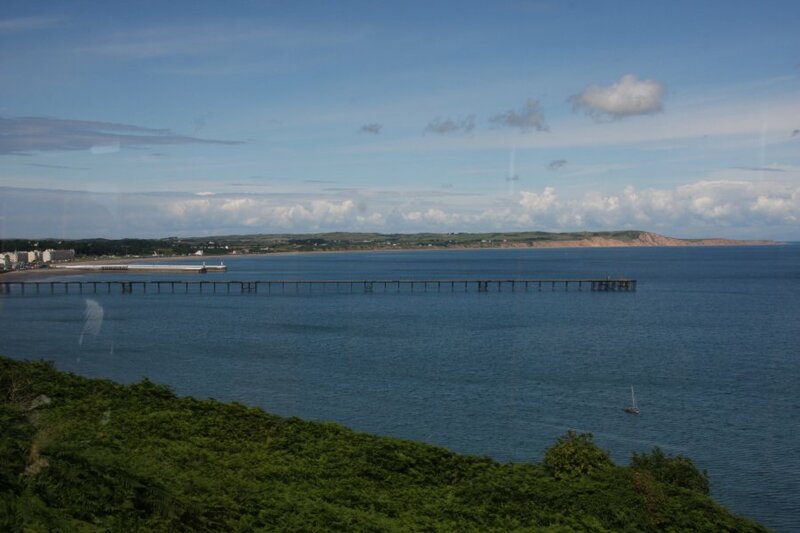 Two railways used to head from Ramsey to Douglas during the industrial revolution - one down each side of the island. 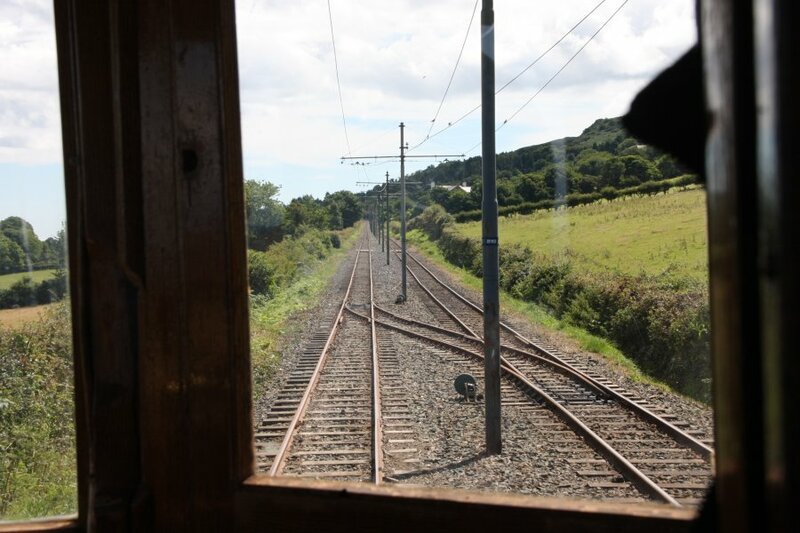 Only the Manx Electric Railway still exists. Created in 1893, it still feels like it belongs there, with old electric cars that offer none of the modern comforts. 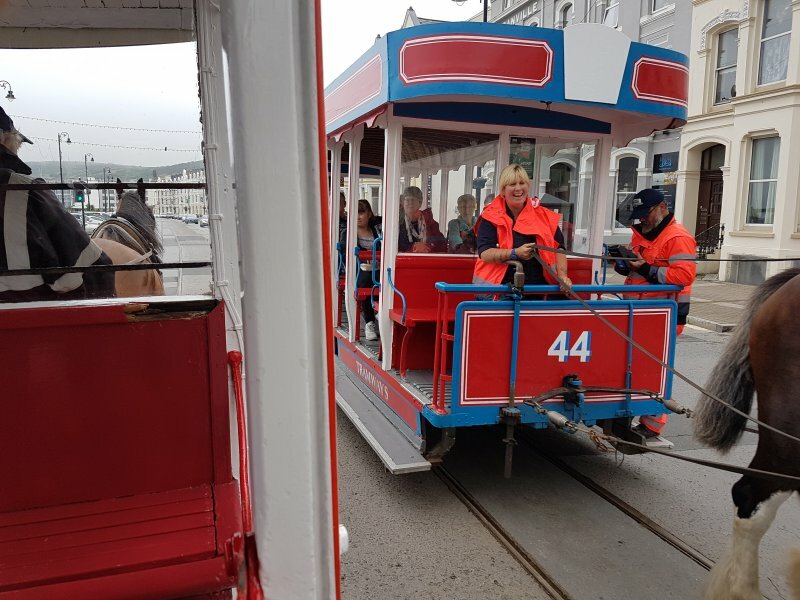 Where the Snaefell Mountain Railway uses bow collectors, the electric trams of the Manx Electric Railway use a trolley pole, requiring a manual pull on a rope to make it choose the right wire at a set of points, and to swing it around to change directions. Most of the trains have one covered car and one open car (some have two of one type), like this one at Bellevue Halt. The covered car fills up very fast, so seats are often available only in the open car. No chains, no barriers to stop you falling out, just you and an open wall of a moving train. Open cars are cold. They have roller shutters that you can pull down to keep the wind out, but they are made of wood, and then you can't see, so it is like travelling inside a large coffin. So they are always open. The electric tracks. Every road level crossing is a request stop, with some that have shelters. If there is no shelter, the train stops on the road, blocking the traffic. Looking over Port e Vullen to the Lake District in England, about 75 km away. Scafell Pike (987 metres), the tallest mountain in England, can be seen on the right. 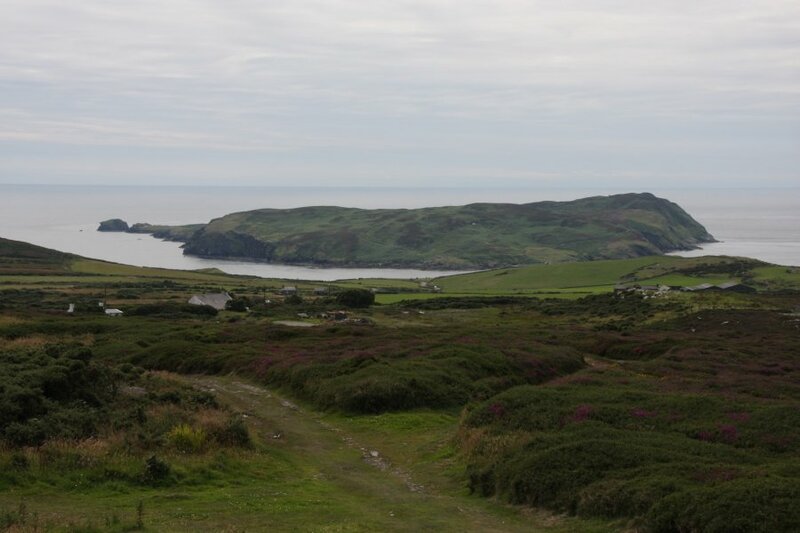 Port Mooar and the Maughold Head Lighthouse (just to the right of the white building on the headland). 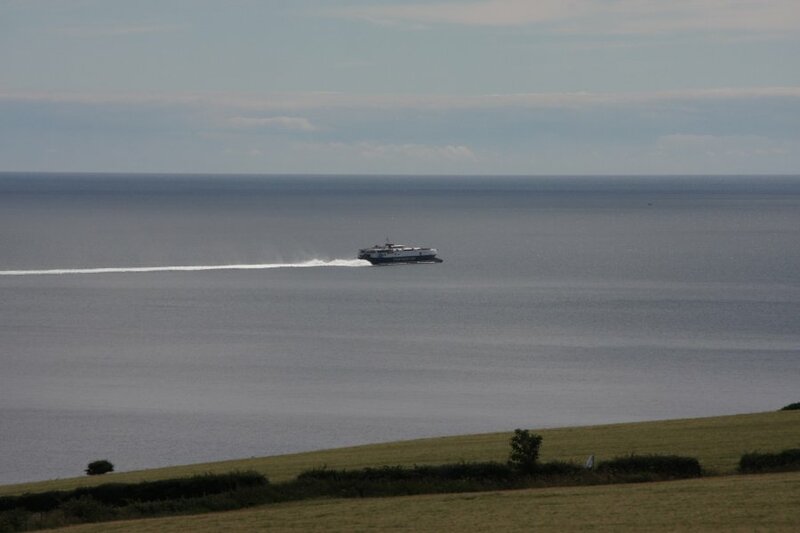 High speed catamaran ferry. 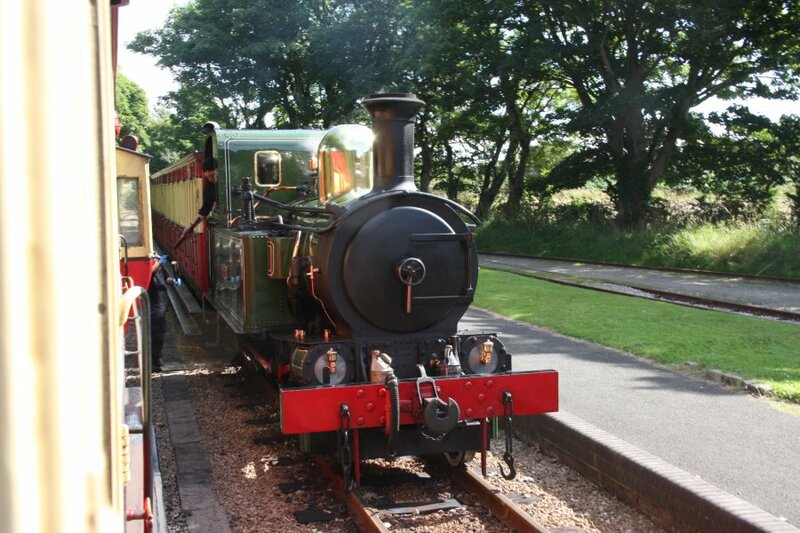 This is the one running the Belfast-to-Douglas route, but is the same as the one we would use to return home. These are run by the Isle of Man Steam Packet Company - the name is a leftover from when they used to be steam powered ships, and the company is the oldest continuously operating passenger shipping company in the World, 186 years old at the time of writing. 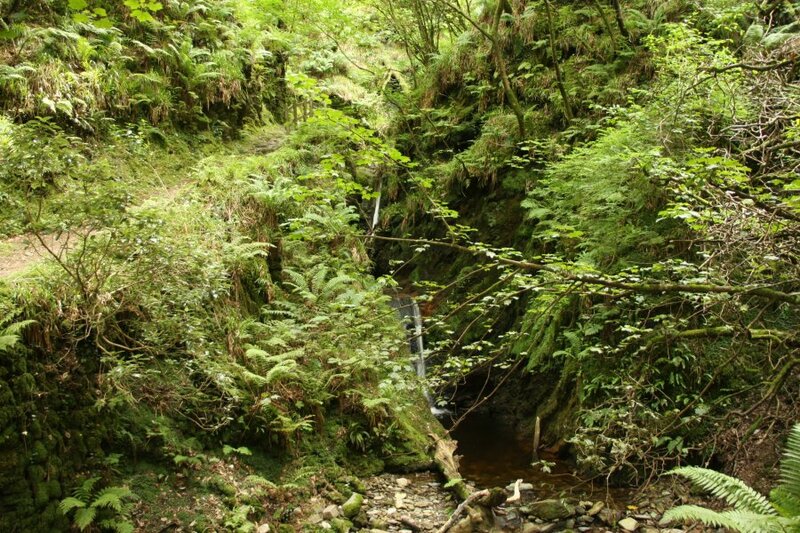 Looking up Ballaglass Glen towards Slieau Ouyr (7 vowels in a row! 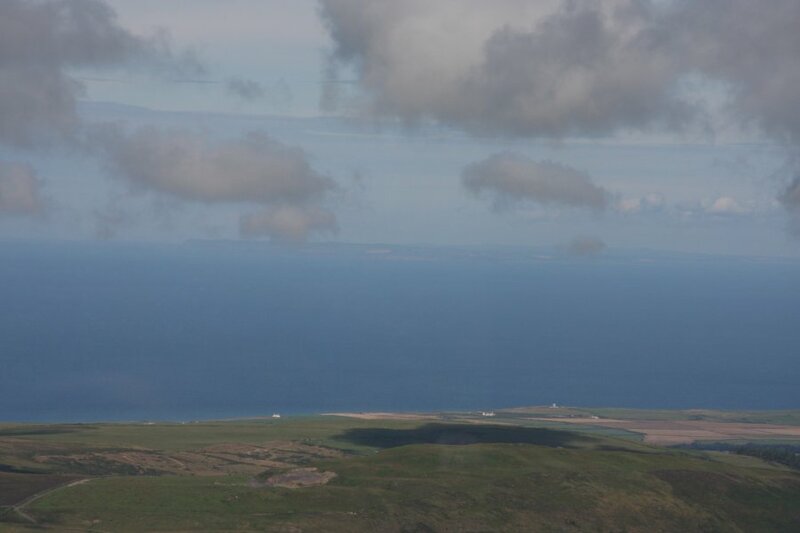 ), the tip of Snaefell barely showing over the green ridge, Glagh Ouyr and North Barrule. This panorama was manually stitched from three photoraphs taken from a moving train - the distance between shots meant that nothing lined up properly, and there are some trees that are duplicated in the different frames (though I modified them to look a little different). Tip; take pictures in the direction of movement in order to avoid duplication. 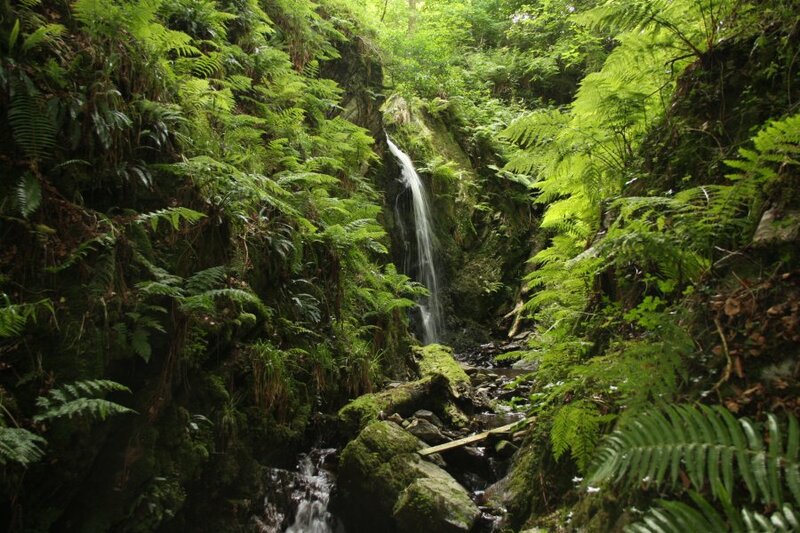 The Isle of Man is too small to have national parks; the whole island is basically a national park anyway. 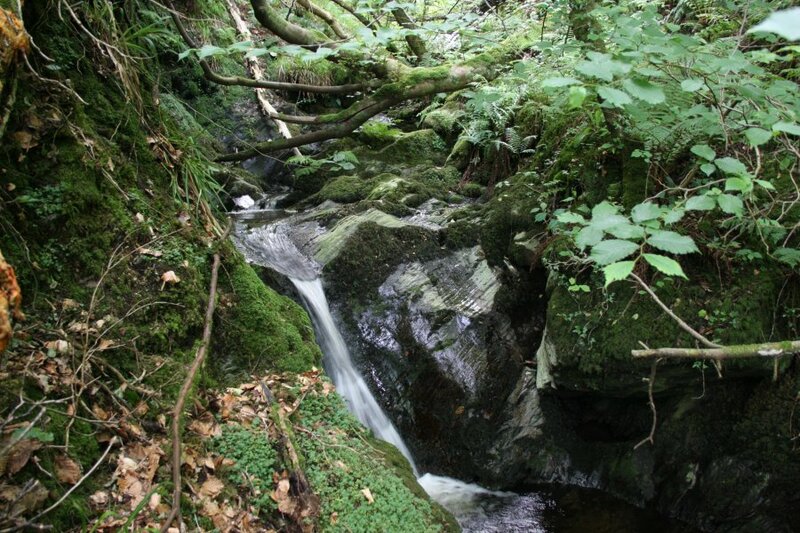 Instead, they have national glens; little valleys that are kept in a semi-natural state, set up with recreational paths. Most are naturally forested. 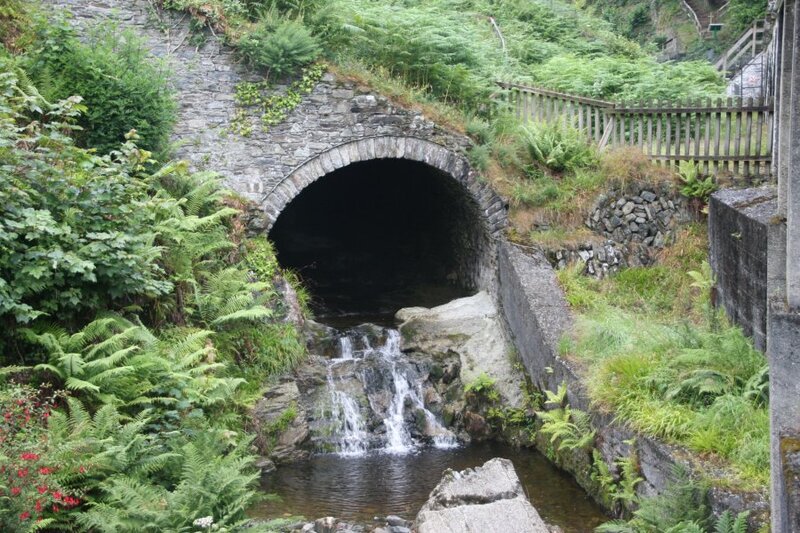 This is the top of Ballaglass Glen, passing under the railway. 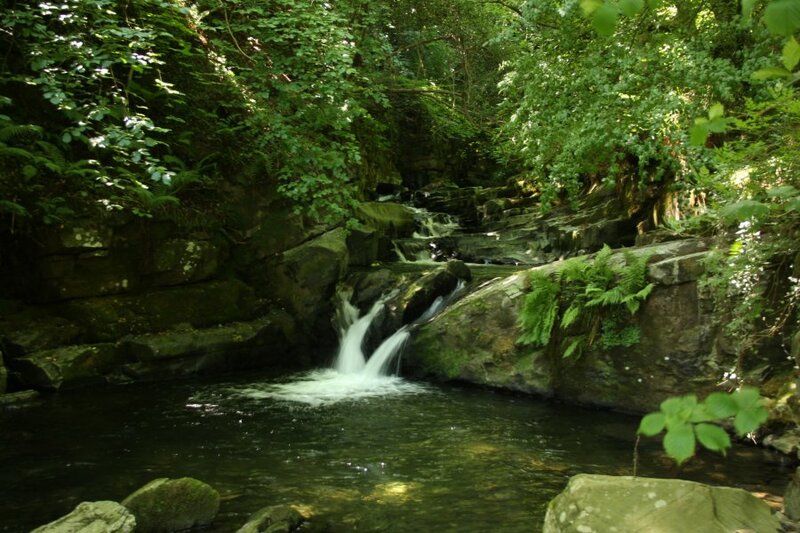 The Ballaglass stream. There are no large rivers on the island, and this is the normal size. 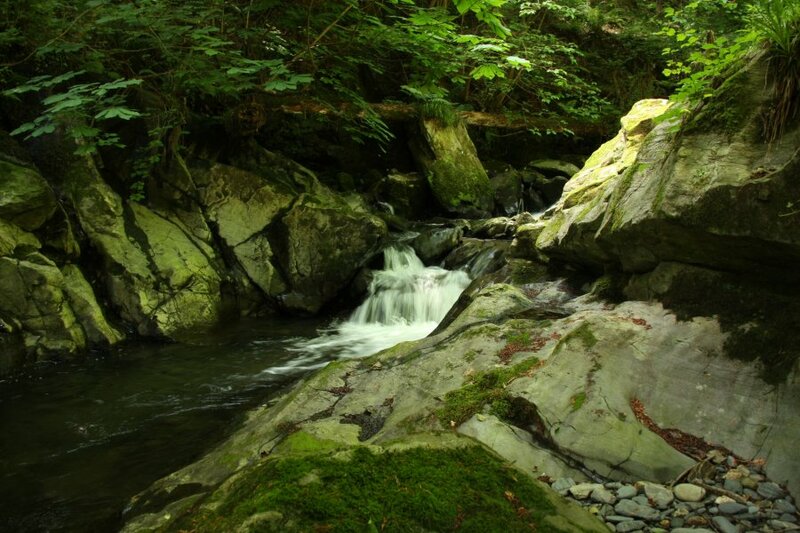 Barely more than a stream. Maybe it turns into a river in winter. 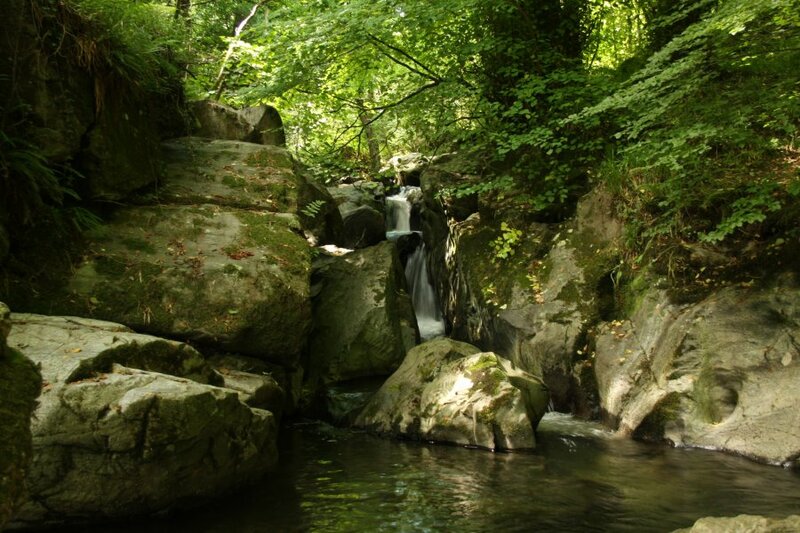 The biggest waterfall, about 2 metres tall. 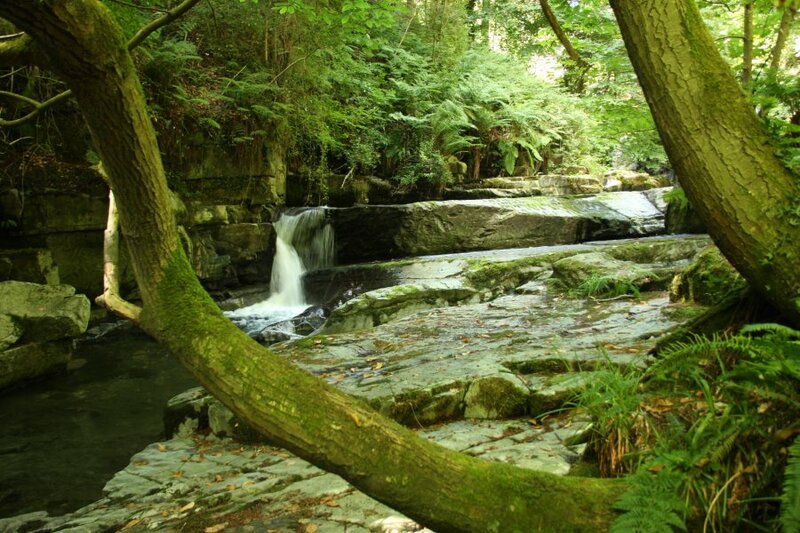 The last of the cascades, just after the main path ends. Test drift mine on the banks of the stream. Picture stitched by Microsoft ICE from two images - the entrance was only big enough for the camera, so these pictures were taken completely blind, pointing the camera and hoping. A little further down the coast is Dhoon Glen. 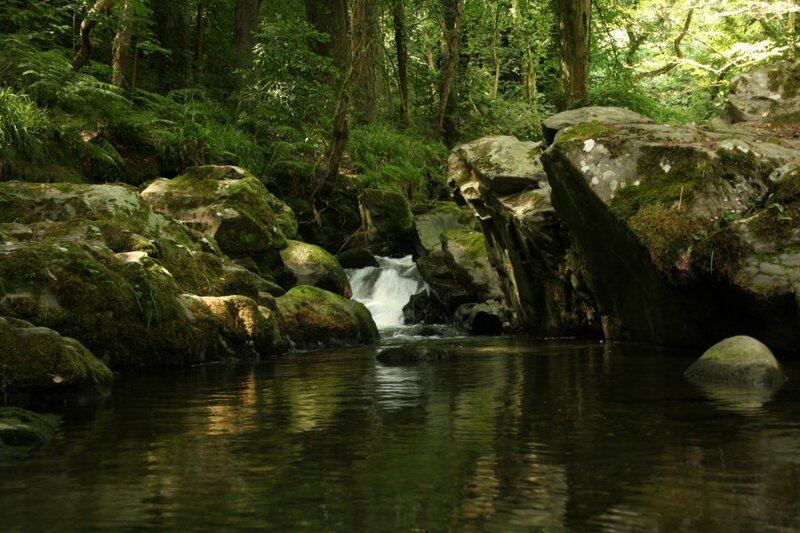 This is its upstream end, leading up to Rhennie Farm, and is not normally seen by visitors. Most only see the odd little cafe and garden, followed by all the signs saying that the glen path is closed - it is not closed, but part of it has a diversion. 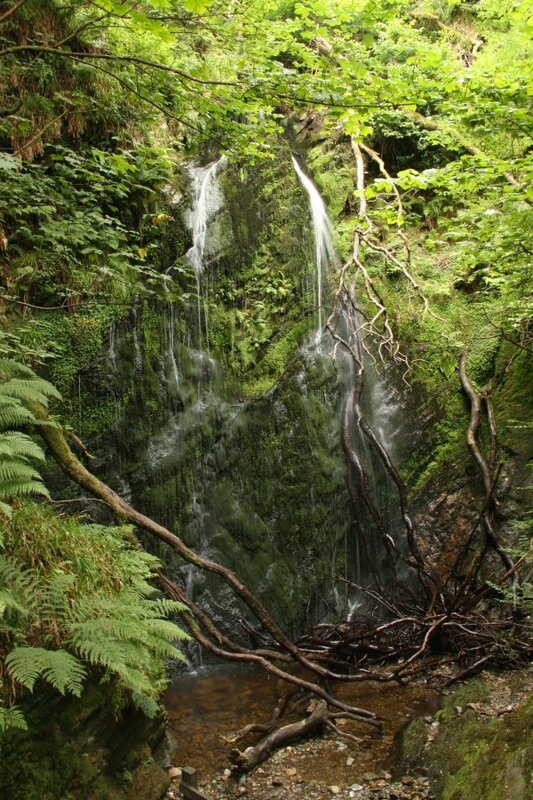 The main path starts down the glen from the station, passing under the road then over this noisy 9 metre waterfall. Almost nobody sees it, since it is obscured from above, and requires a scramble up the gorge from downstream to reach it. There was once a giant waterwheel here, mounted in this casing. The tower that carried the water to the top of the wheel. 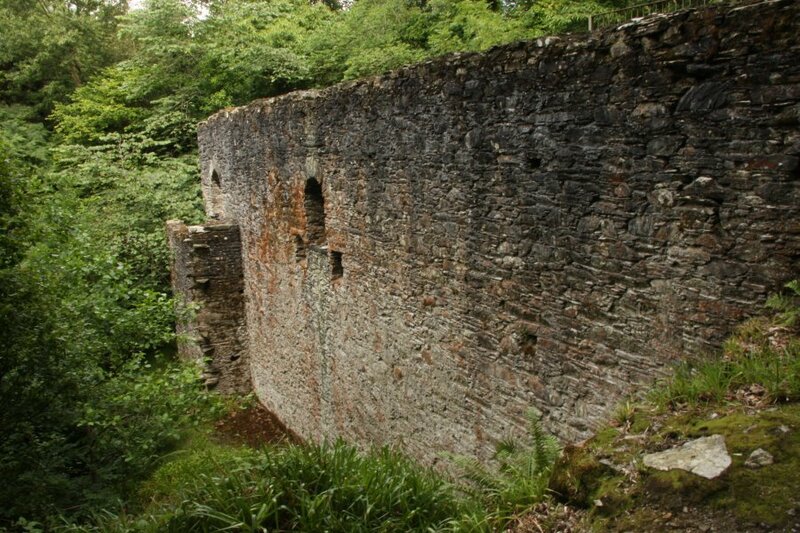 Inside the slot where the waterwheel was fitted. Some little cascades in the Dhoon Glen. 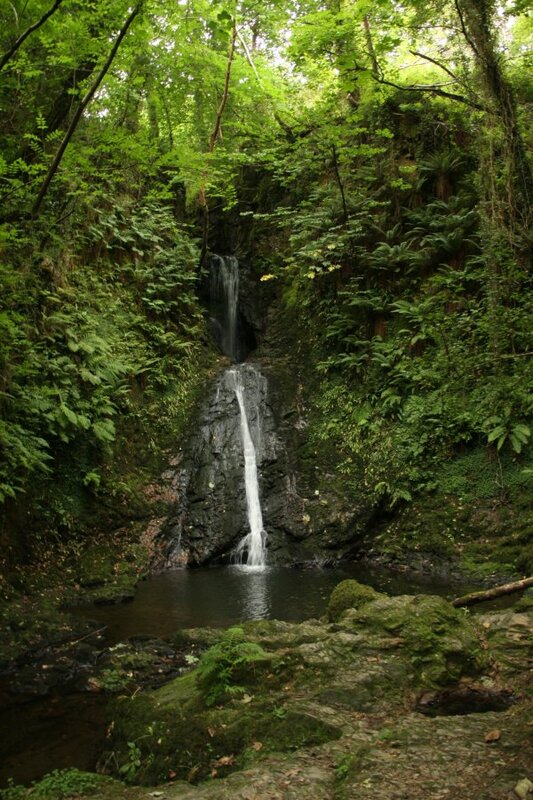 The top of Dhoon Glen's Inneen Vooar, the tallest waterfall on the island at 40 metres in total height - the government Glen pages refer to it diplomatically as "one of the tallest", just in case they might be wrong, and might have missed one. These drops are a metre or two tall each. Inneen Vooar's upper big section, 12 metres tall. This was not a good place to take pictures from, scrambing through undergrowth on poor ground, 30 metres above the bottom of the cliffs. But it was obscured by trees otherwise, so here we are. 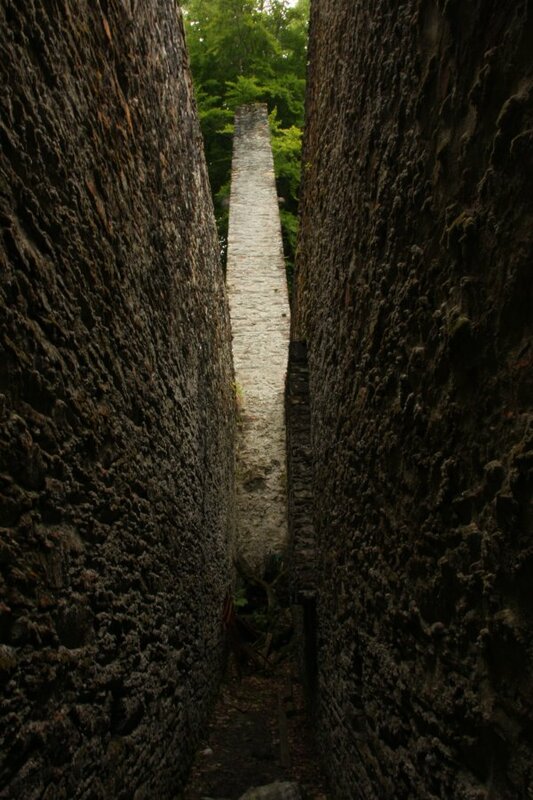 The lower big section that everyone sees, 12 metres tall. The name Inneen Vooar means "oversized daughter" or "big girl". It is usually translated as the latter. 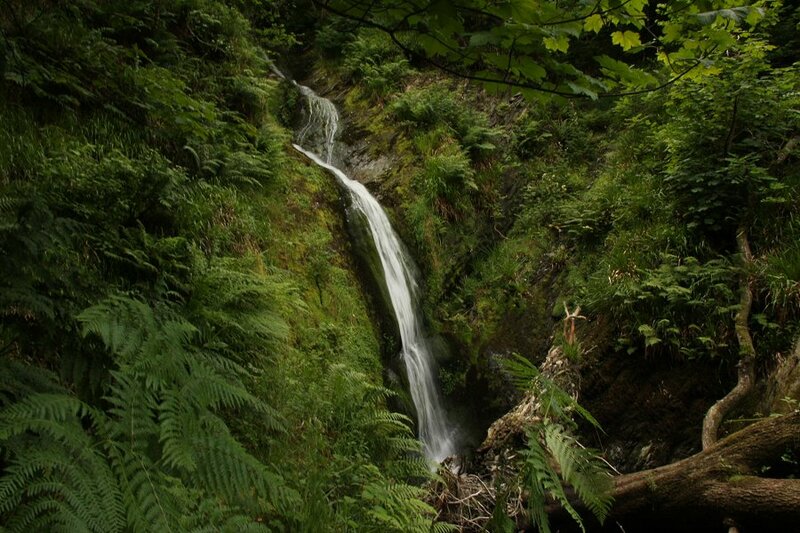 It is better known simply as Dhoon Glen, without realising that the waterfall has its own name. I could not find any details of any taller single drop waterfalls on the island, so this probably holds the records for both tallest single drop, and tallest total height. Two little drops adding up to 3 metres, marking the bottom of the waterfall. 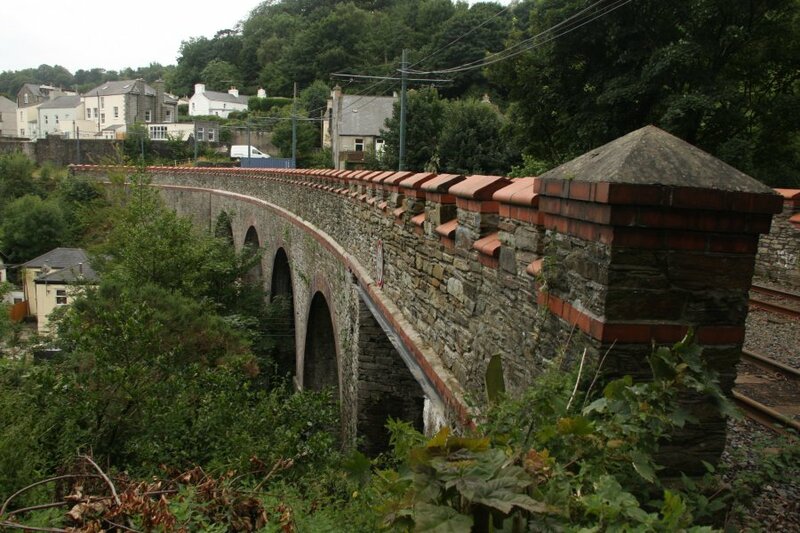 Viaduct at Laxey, where the Snaefell Mountain Railway starts. 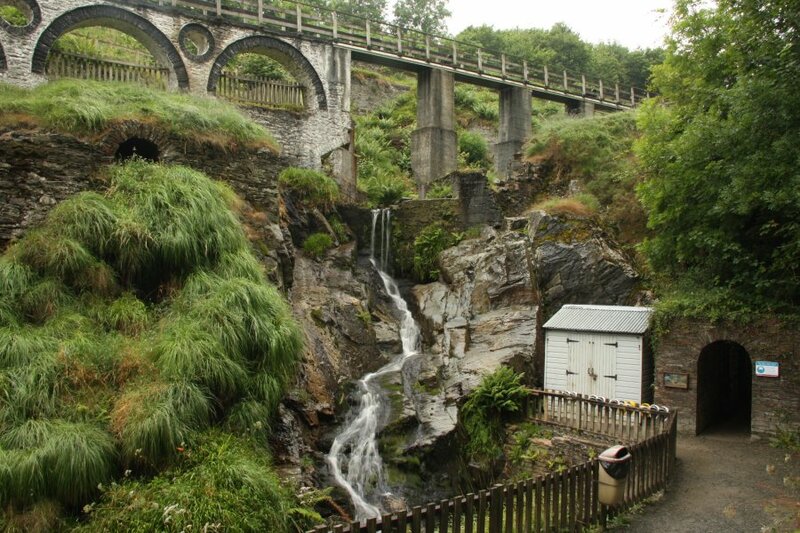 Laxey is famous for the Laxey Wheel (aka. "Lady Isabella"), which towers over the town. 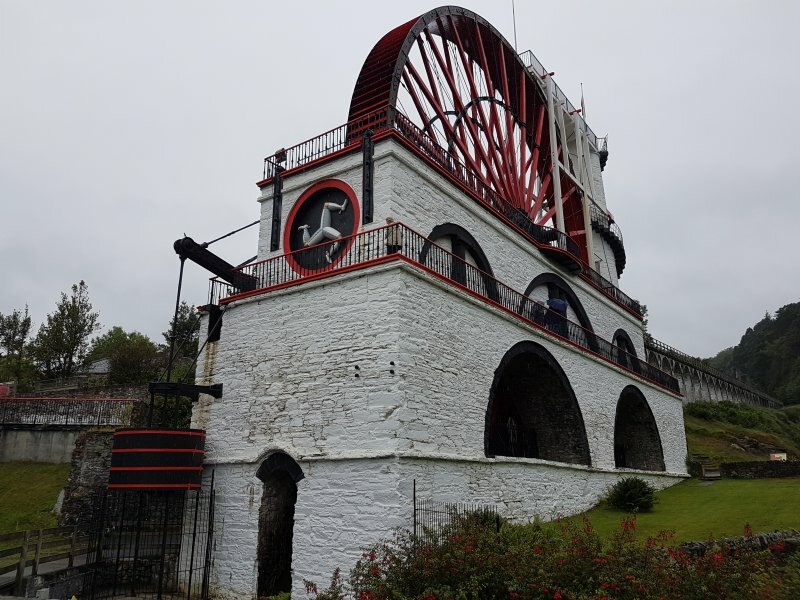 What I didn't realise was that if I had turned the camera to the right, I would have seen the equally impressive 15 metre Snaefell Wheel and the Great Laxey Mine Railway. Fail. 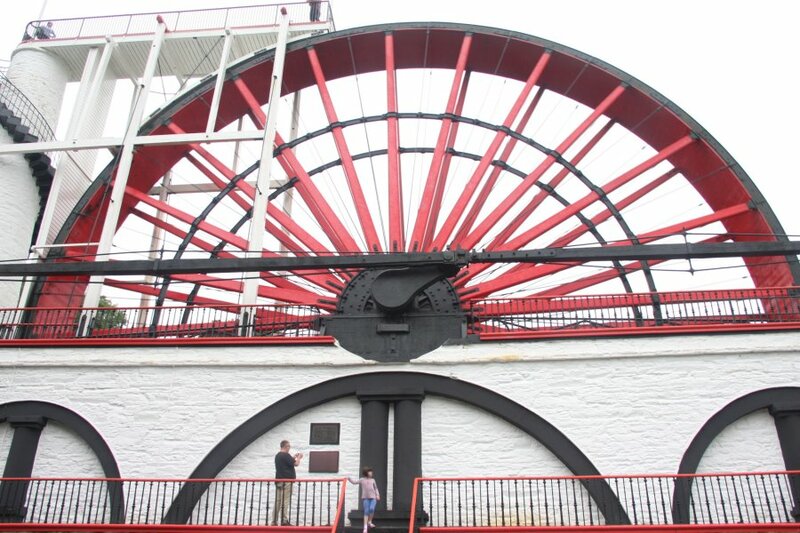 The Laxey Wheel is the largest working waterwheel in the World, at 22.1 metres in diameter, bult in 1854; see the people on the walkways for scale. 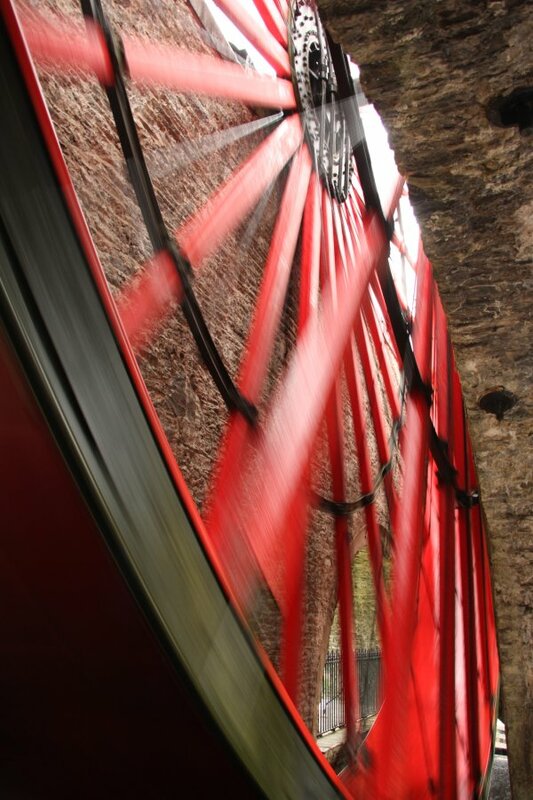 The wheel's counterweight is at the front, looking like a barrel. The Three Legs of Mann symbol is an icon of the Isle of Man, and is on all tourist merchandise as well as the national flag and money. I did not intentionally take any pictures of it because it is already everywhere. Leats and tunnels collect water from the hillsides, flowing into this cistern. 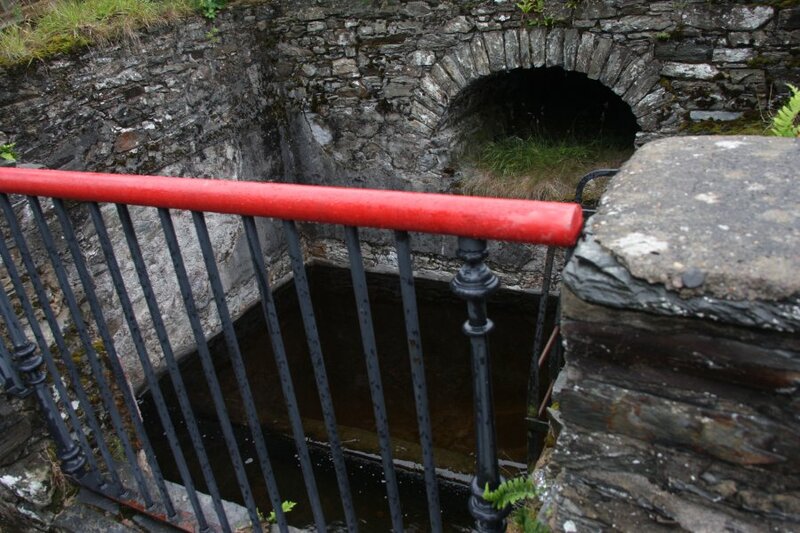 Rather than have an aquaduct carrying the water to the wheel, there is a strong pipe from here down to the ground, under the ground, up the pillar above the wheel, along the upper walkway, where the water is dropped onto the wheel, rotating it. Gravity pulls the water through the pipe as an inverted syphon without needing any pumps. The cistern only needs to be slightly higher than the top of the wheel. The wheel turns backwards, moving downwards next to the water tower, like an undershot (or breastshot) wheel instead of a normal overshot wheel. This variation is called a backshot wheel, and can use both the undershot outflow (the tail race) as well as the descending water. This particular one only makes use of the descending water, so it could just as easily have been made as an overshot wheel. The wheel crank moves a rod backwards and forwards 2.44 metres per rotation, with the counterweight helping the pull action. 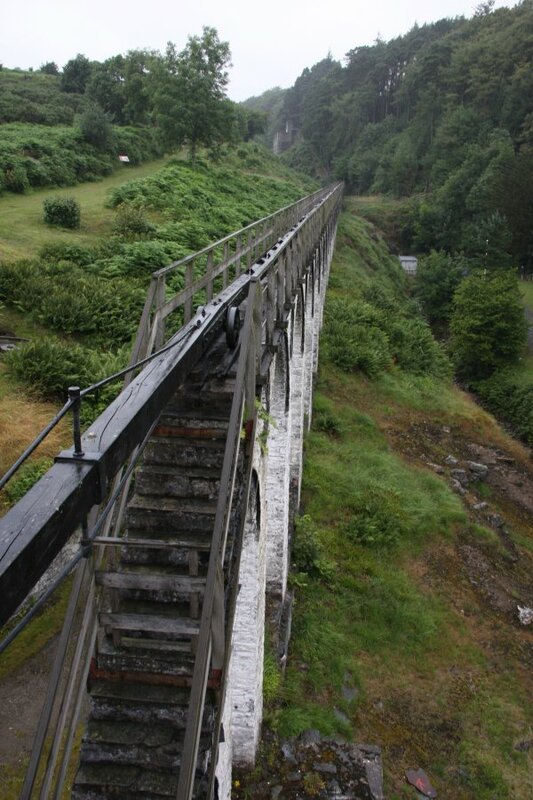 The rod moves backwards and forwards along this lengthy viaduct, up to the site of the mine. The little wheels reduce friction. 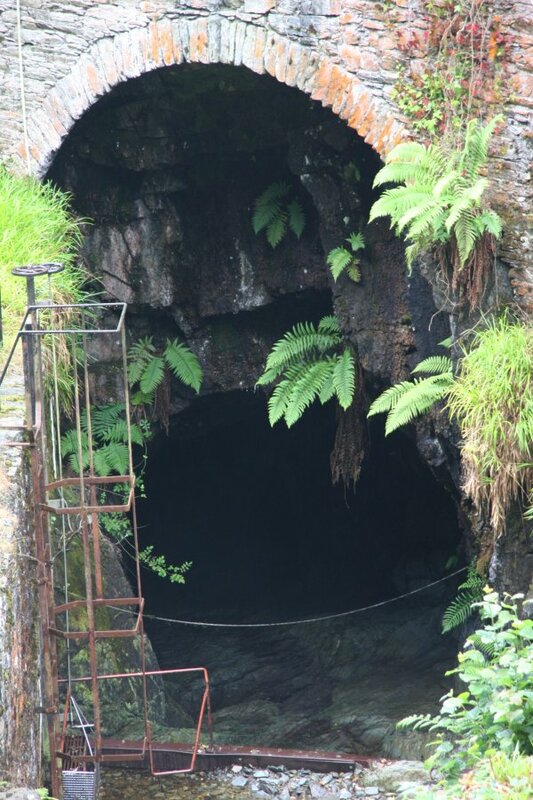 This rocker (and a couple of similar ones underground) converts the horizontal motion into vertical motion, moving a set of vertical piston pumps down the mine shaft beneath the near side of the rocker - the far side has a second counterweight. These pistons lift the water in 7 steps up from 460 metres below ground, to an adit about 430 metres higher, which then brings it to the surface. It drained 1100 litres of water per minute from the mine. Each step puts the water into a little staging reservour, and each reservoir's depth adds to the height that the water has to be lifted. Assuming the water was always lifted from the bottom, that is the equivalent of lifting 1.1 tonnes up 430 metres per minute, after losses and inefficiencies. This equates to a 77.3 kW water pump. In reality, each mine level actually empties into the nearest staging reservoir rather than being allowed to fall all the way to the bottom first, so the average lift is roughly halved. Assuming that the water is evenly distributed into the staging reservoirs, it equates to a 38.65 kW water pump. That is still very powerful even by modern standards, for a single pump engine. 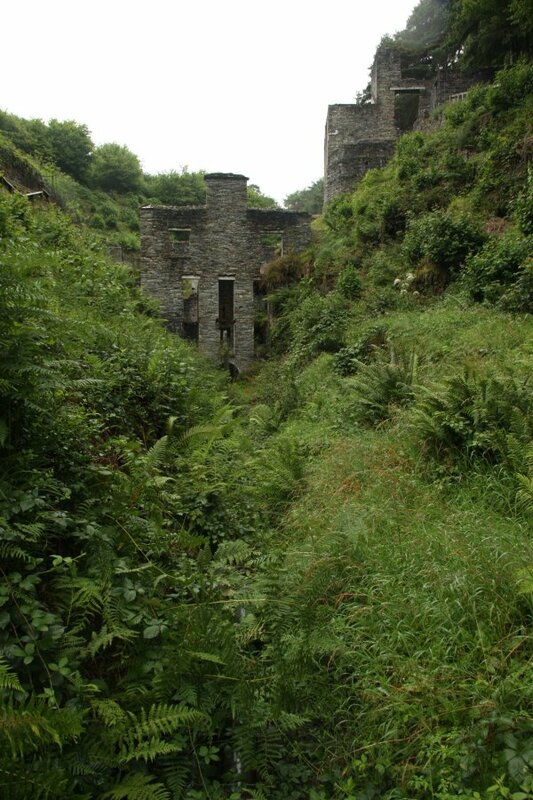 The machine house (lower) and engine house (upper), a little way up the valley from the mine shaft. 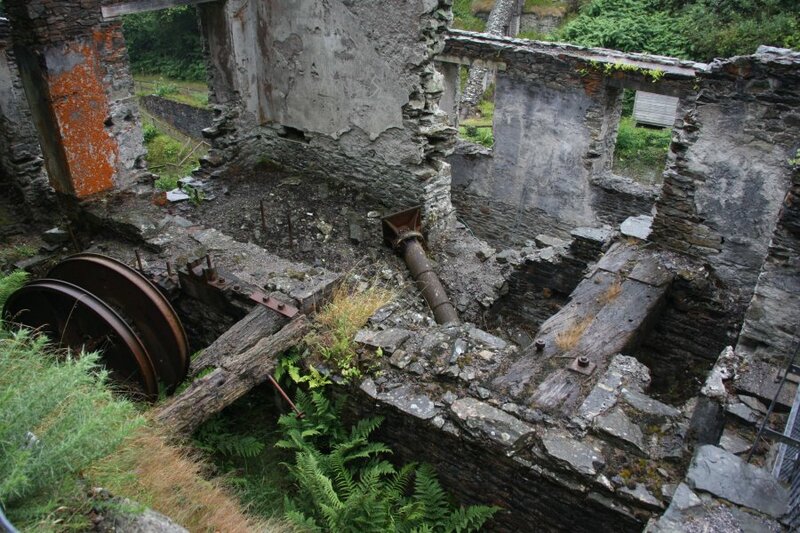 The engine house once held a water wheel (in the long slot near the camera), which turned a shaft and barrel that wound the hoisting cable, pulling the buckets of rock and ore up from the mine. 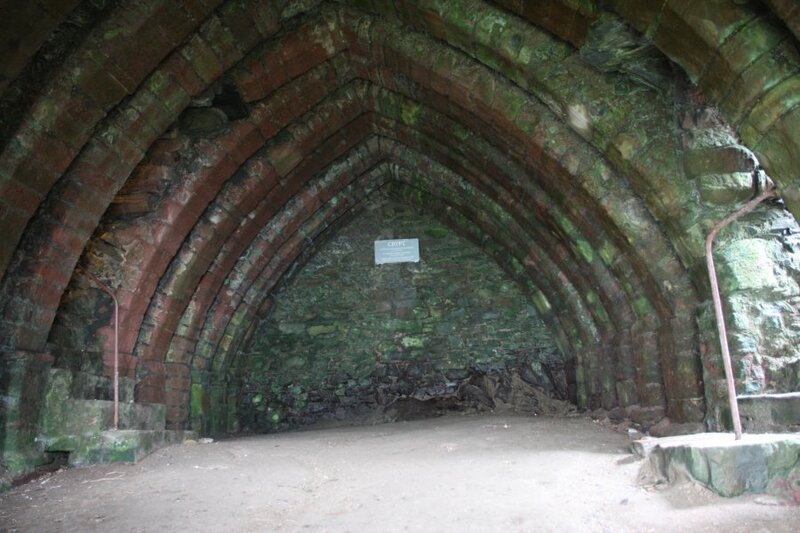 In 1846, this was replaced with a steam beam engine in the room with the fallen metal pillar. The metal barrel is in the waterwheel slot. In 1856, the entire system was replaced (except in dry years) with the machine house. The giant cistern on the far side collected water. When in use, the water would drain rapidly down the pipe into the machine house. In the machine house, the fast moving water turned a Fourneyron turbine, which in turn turned the barrel, winding up the hoisting cable. 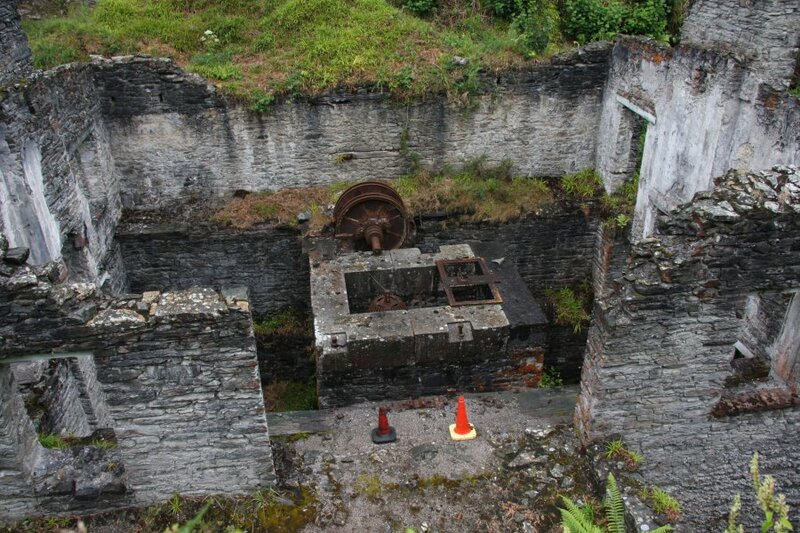 Originally, there were two barrels, one either side of the central turbine, to work the two nearby mine shafts. The two engine houses. 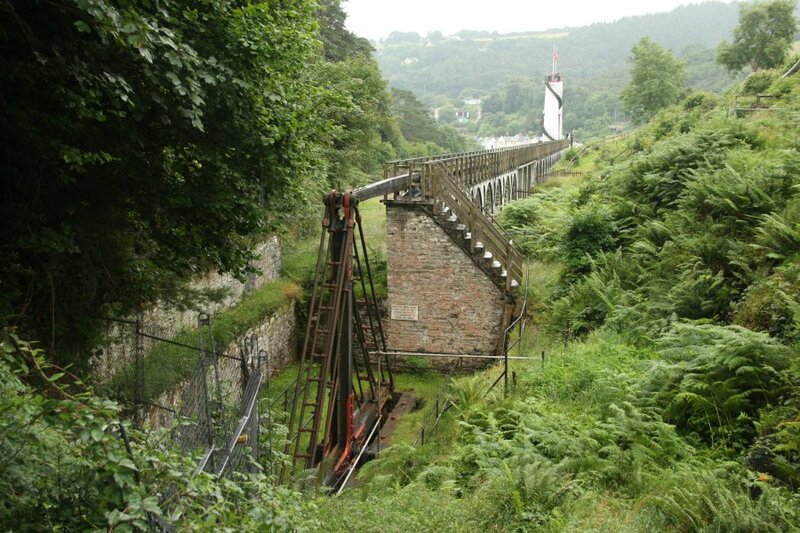 The Engine Shaft (the one with the water pump at the end of the rod viaduct) can be seen on the far side. The other shaft is some distance away behind the camera. Top of the Welsh Shaft. It doesn't look like much from here, but it is 540 metres deep, dropping over 400 metres below sea level. 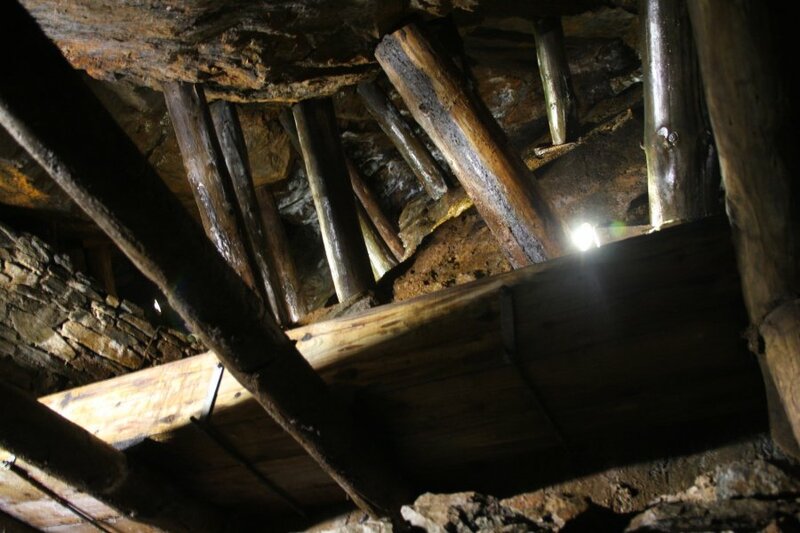 This sloping shaft could not support a standard cage system for lifting miners, so it originally had ladders. 540 metres of ladders, taking an hour to descend (and longer to ascend), wasting valuable time and energy. In 1881, a Man Engine was added, using water pressure to lower and raise a wooden rod up and down by 3.66 metres, extending to the bottom of the shaft. 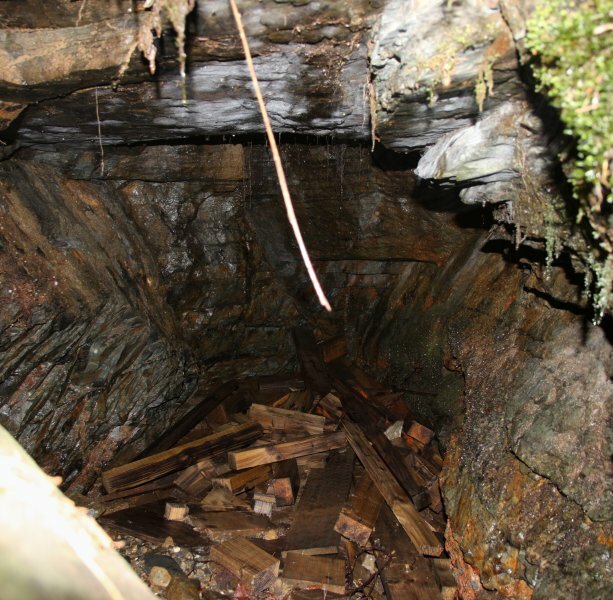 The shaft had solid platforms every 3.66 metres, and the wooden rod had smaller platforms attached to it at the same spacing. A miner stands on the little wooden platform. The rod is lowered 3.66 metres in 6 seconds. The miner steps onto the solid platform. The rod is raised 3.66 metres, bringing the next little wooden platform up to the level of the solid platform after 6 seconds. The miner steps onto it, and is lowered to the next solid platform. Repeat, repeat. The same approach works in reverse to ascend, 25 minutes in either direction. 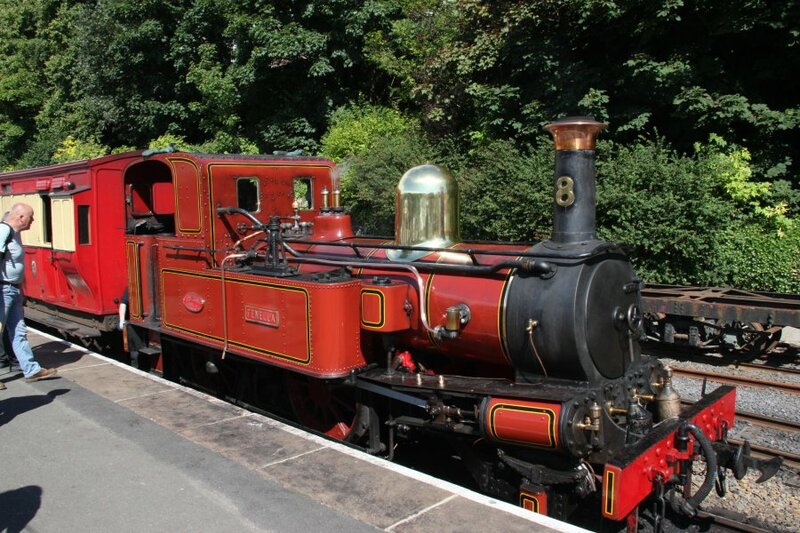 Although similar devices were used in Cornwall, the is the only complete surviving one in the British Isles. Shame you can't see it. 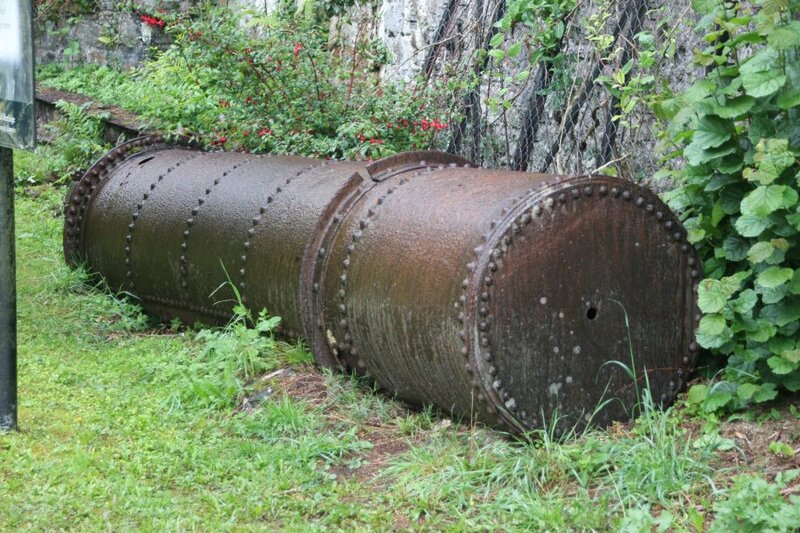 Remains of an old man engine piston or boiler. 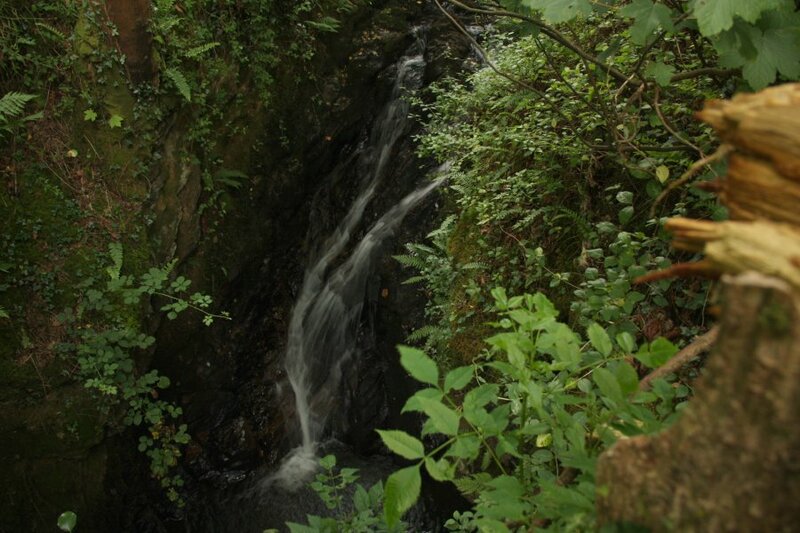 Small waterfall upstream of the shafts. Bridges and conduits controlling natural water flow around the site. Goodbye river. The water seems to be drawn off by a sluice gate on the left. Outflow. The water comes from a pipe above, possibly an overflow from the main wheel's cistern. 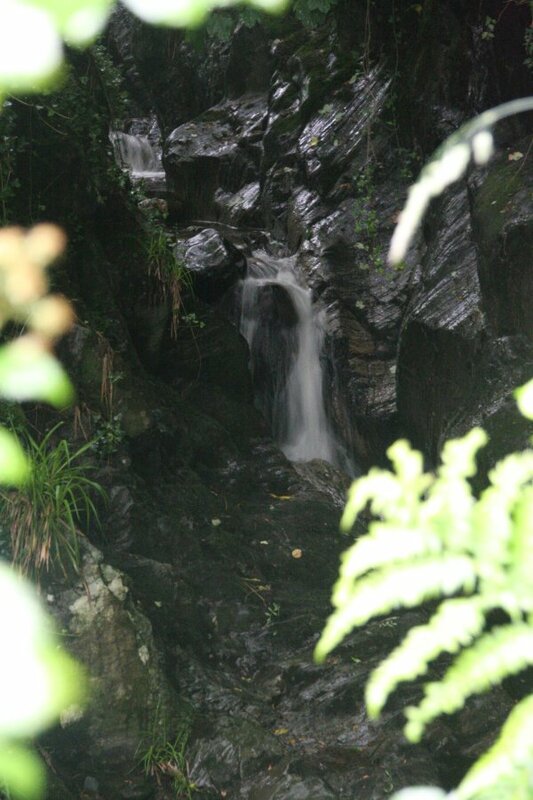 Artificial 7 metre waterfall with a mine entrance. 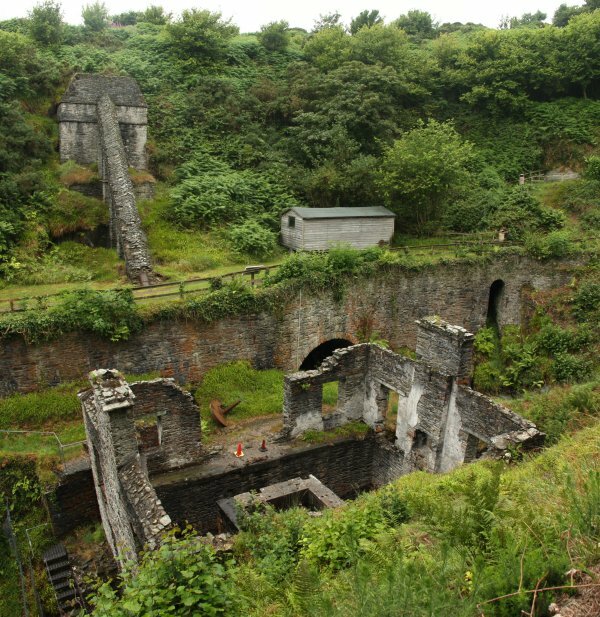 The main mine's adit entrance is a long way down the valley from here, in Laxey itself, near the base of the steep hill up to the wheel. The water was pumped up to the level of the adit rather than all the way to the surface. 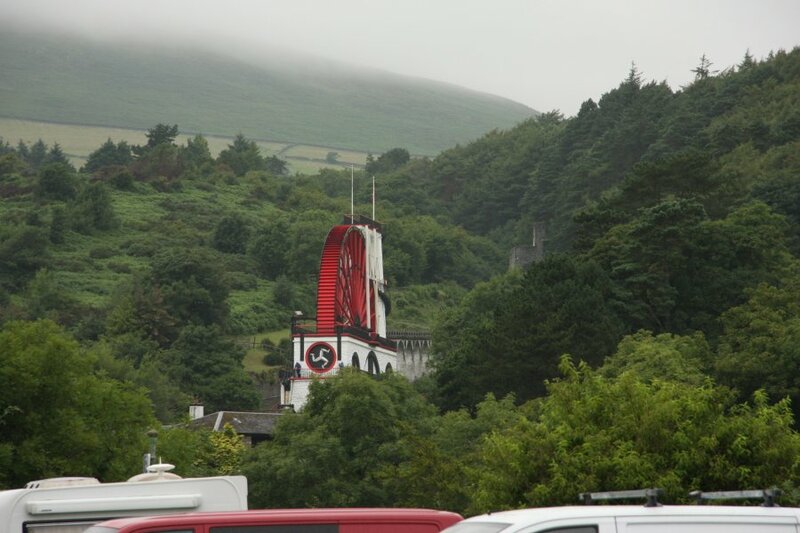 The man engine also only operated up to that adit. 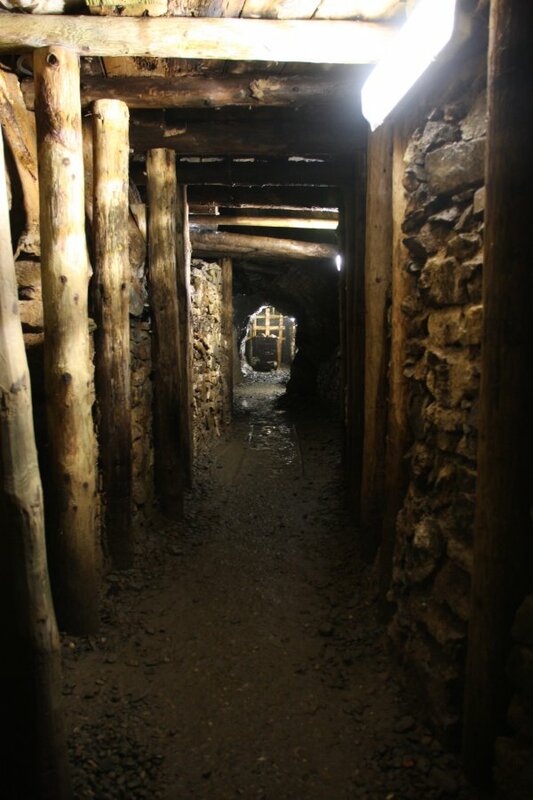 Inside the mine. Feels like it has been modified to make it safer for tourists. Stemples in an aven. There is stal on the ceiling, but this is mudrock not limestone. 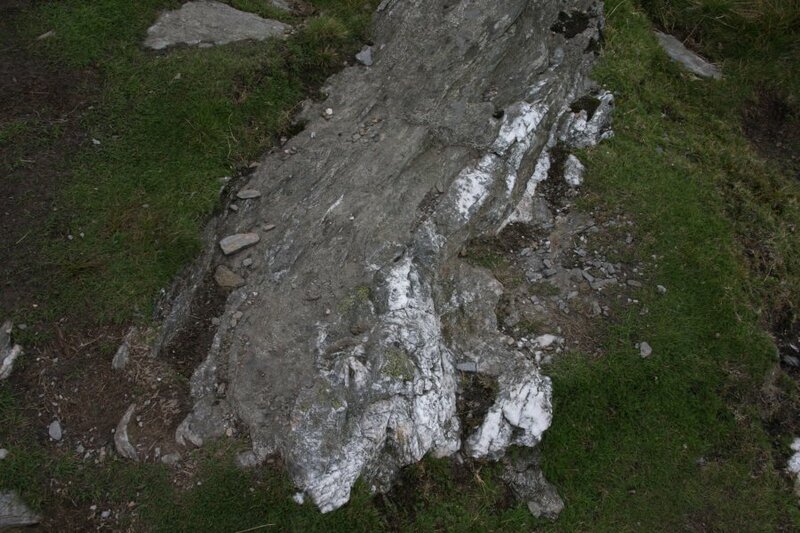 Perhaps it is from lime mortar used to seal it off from the surface. That's as far as tourists can go, since it intersects the Engine Shaft ahead. Map of the mine, showing the Welsh Shaft, Engine Shaft and Laxey Wheel in the top-right. 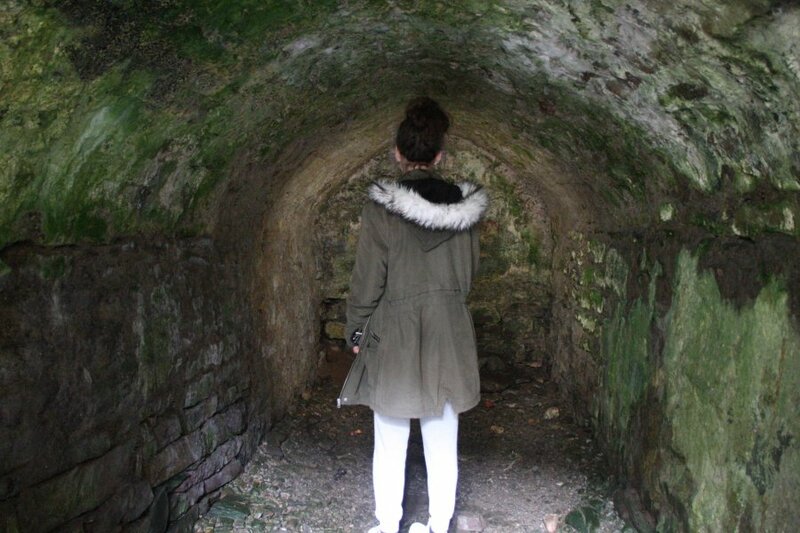 The right side of the Old Adit is the only place tourists can visit. The Old Toll House, at the top of Groudle Glen. Many of the roads here, like on the mainland, required travellers to pay tolls. This seems to be a normal design for the island, presumably one arch for each direction. 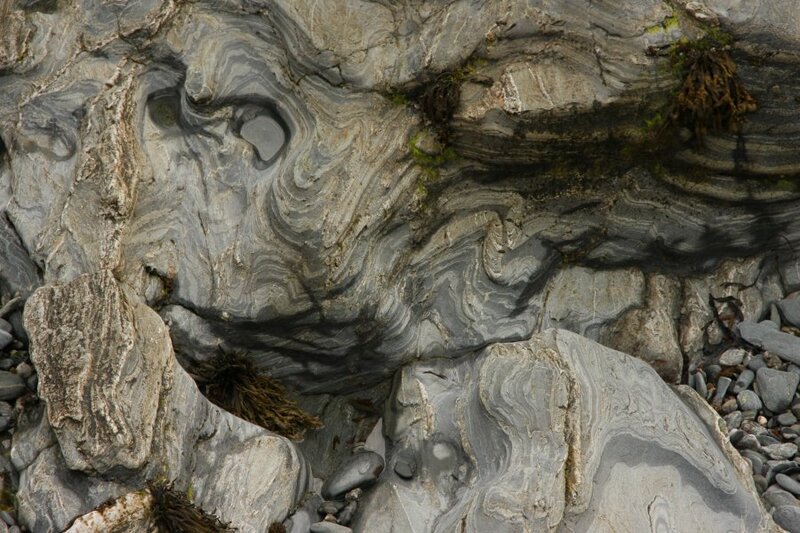 There are some much more dramatic ones elsewhere on the island, such as on Marine Drive, south of Douglas. 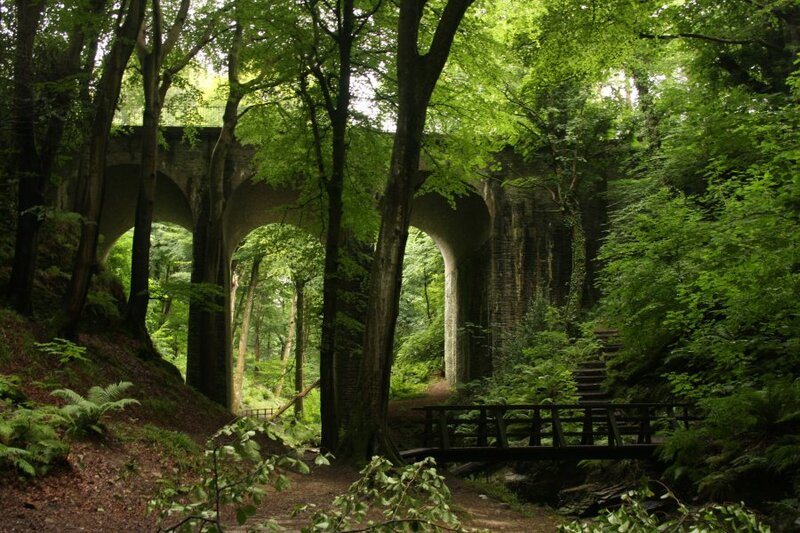 Groudle Glen viaduct. 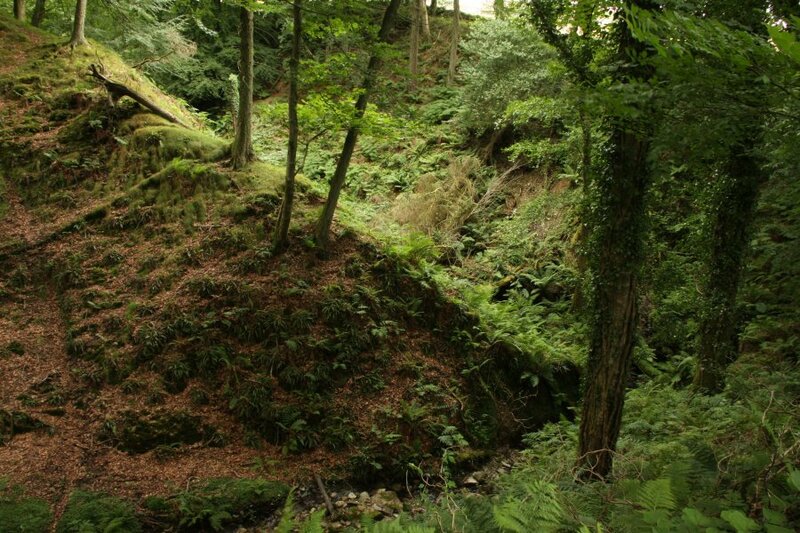 This is not a completely natural glen, with many of the trees being intentionally planted. The fallen branches were still falling during our visit, and we saw them hit the path below. 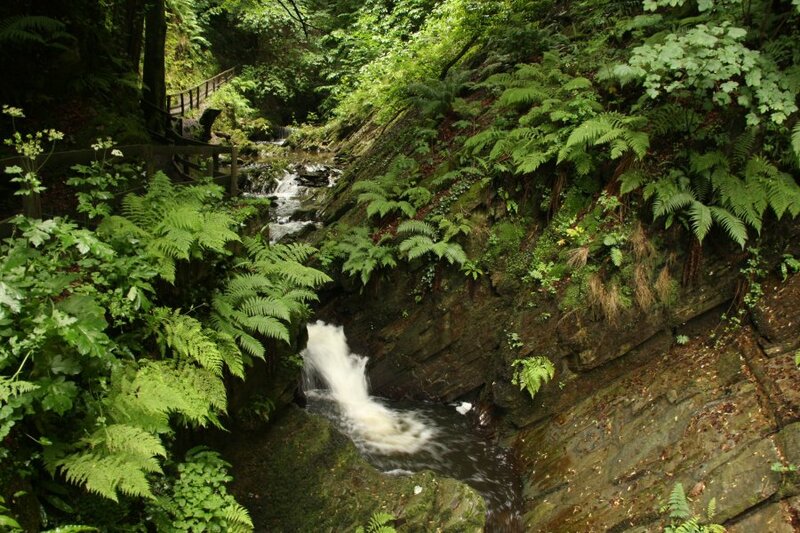 Groudle Glen is a former tourist attraction, with a narrow gauge railway, zoo, band stand, water wheel and gardens. 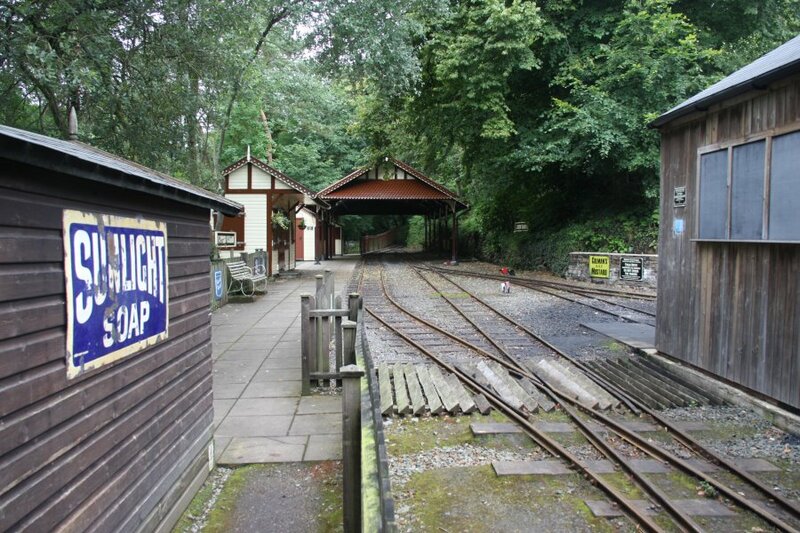 The railway is the only attraction still running, though not on the day we visited. Much of it was refurbished in the 1990s, but has since fallen back into disrepair. This leaves it with a slightly sad but very romantic feel. 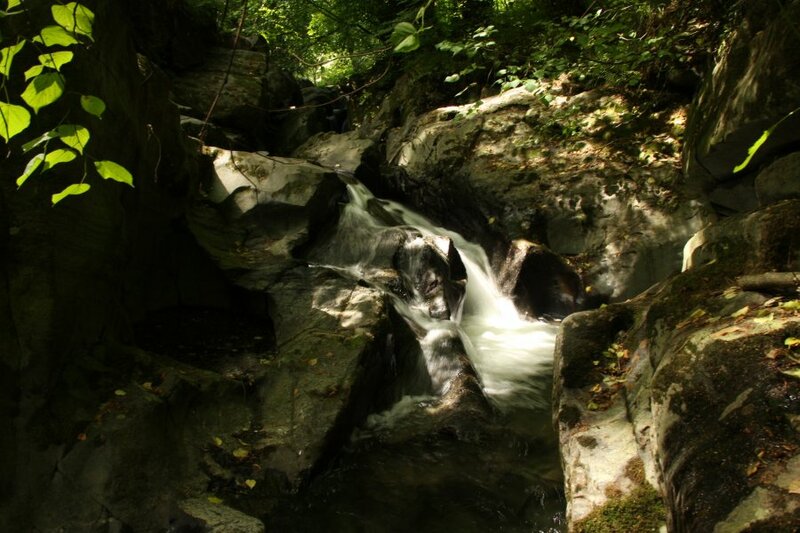 Little waterfall. 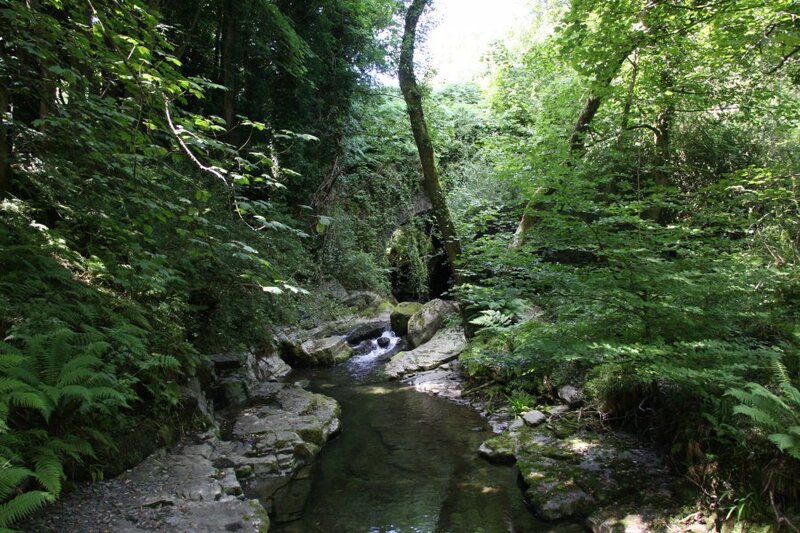 The "ou" in Groudle Glen's name is pronounced the same as in the word "cloud". 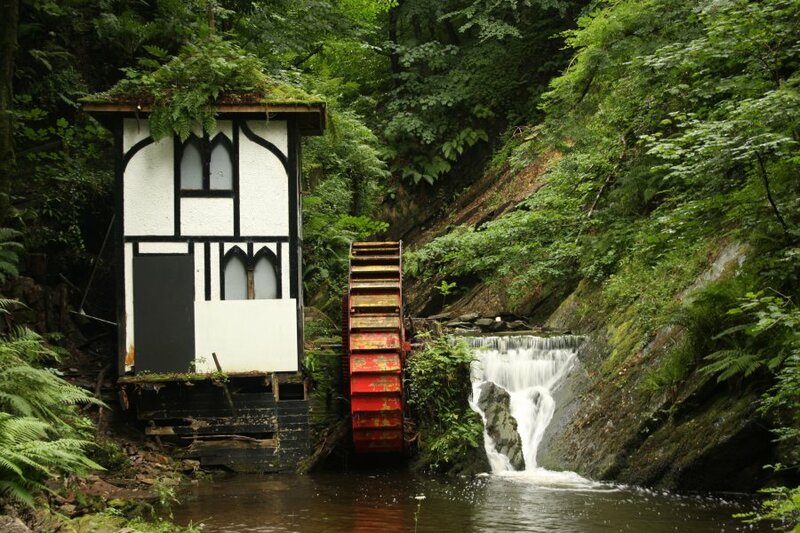 The decaying Little Isabella waterwheel and mill. 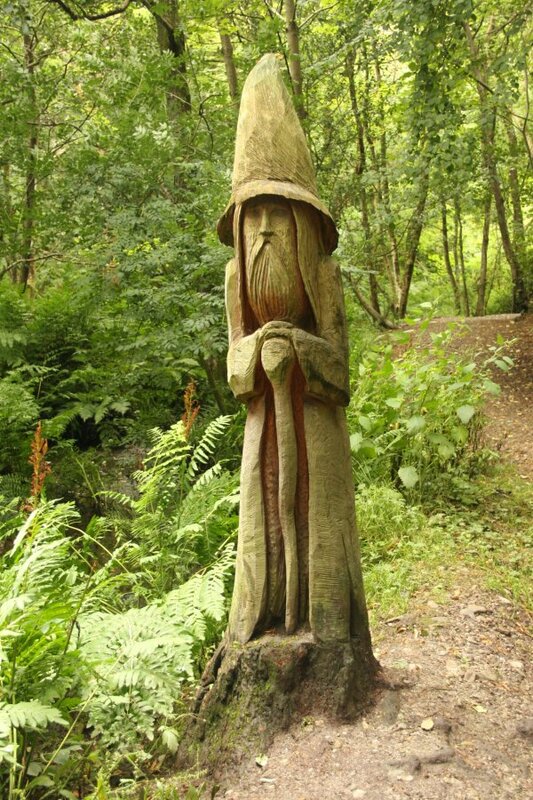 The wizard of the glen. 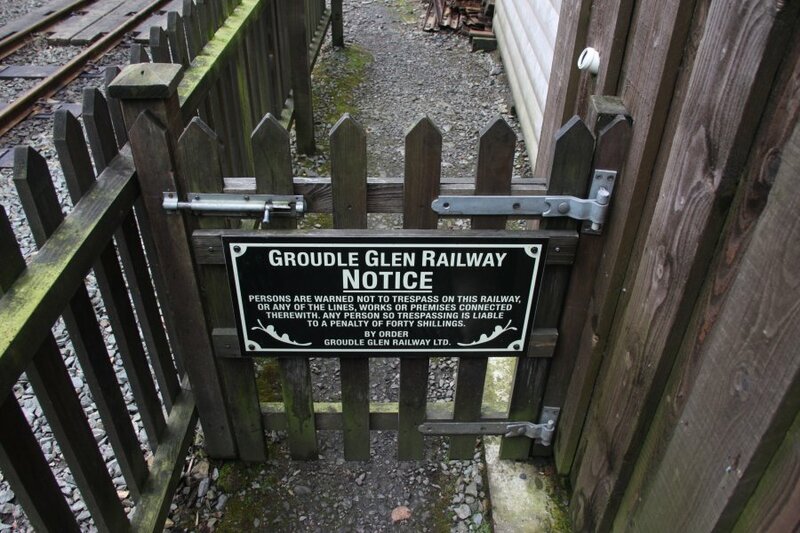 Lhen Coan station, the start of Groudle Glen's railway, constructed in 1896. At the end of the line is Sea Lion Rocks, the former zoo, built in 1893. Sea Lions were kept here in this lagoon. 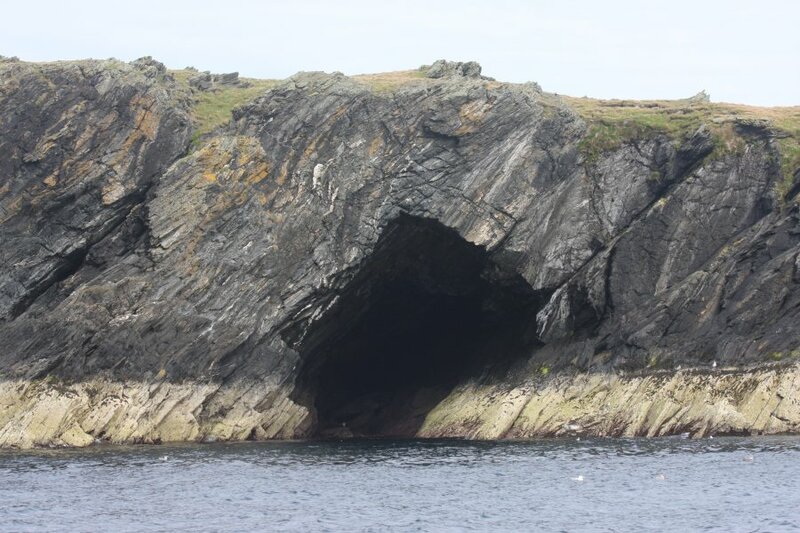 Their hiding cave can be seen on the right. 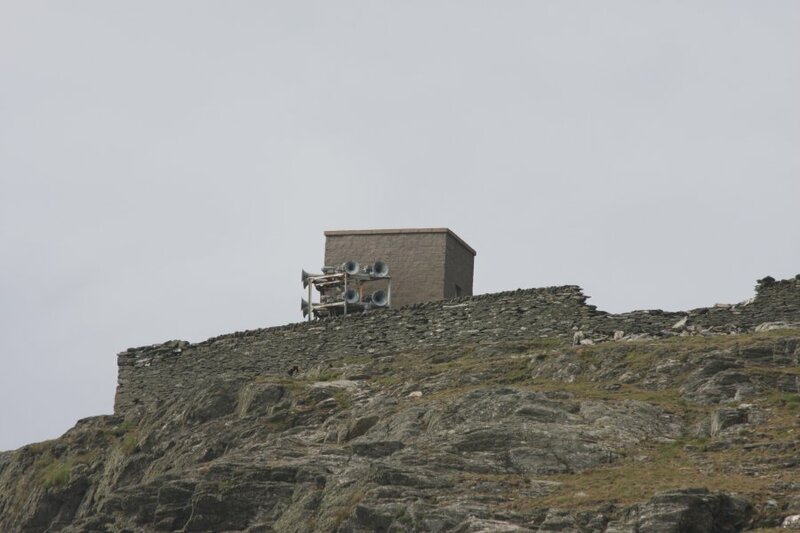 Polar bears were housed in an elevated enclosure concreted into the cliffs, battered by the sea. The acess tunnel appears to be in the crack at the back, with a concrete wall allowing keepers to view the bears from relative safety. 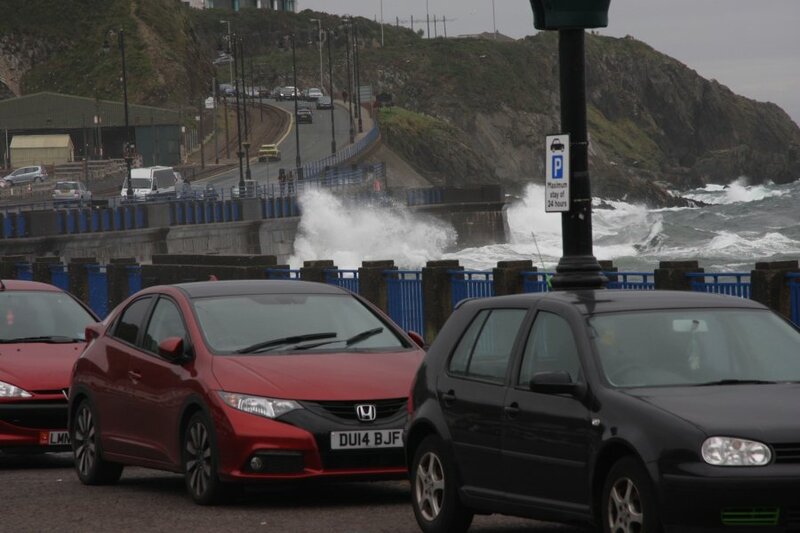 Big waves hitting the sea front in Douglas. 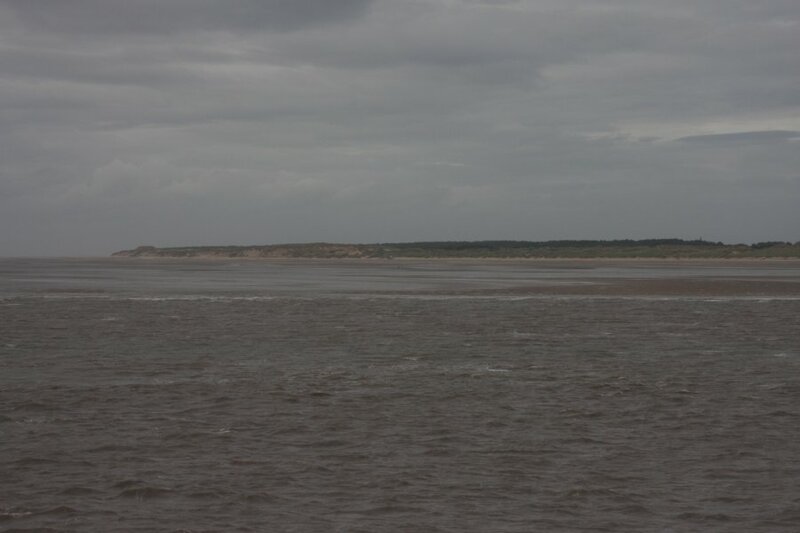 This picture was taken on the day we left, and shows the sea conditions we sailed home in. 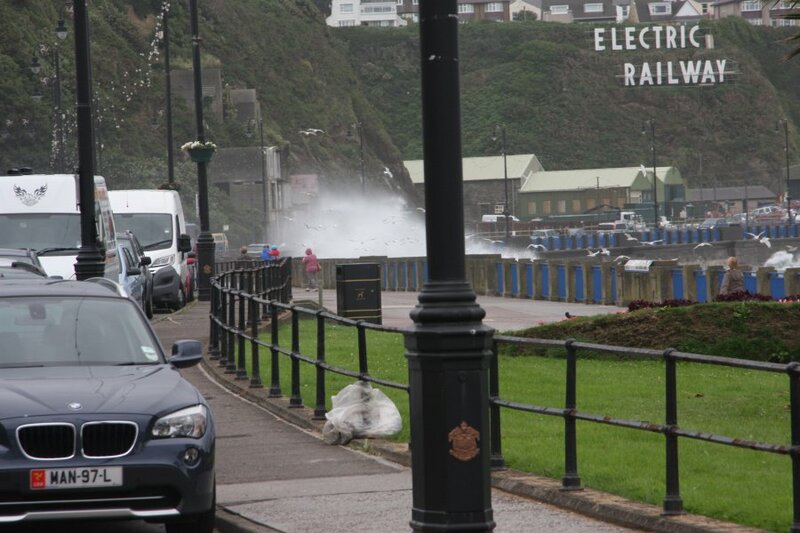 Dodging the splashes on the sea front. 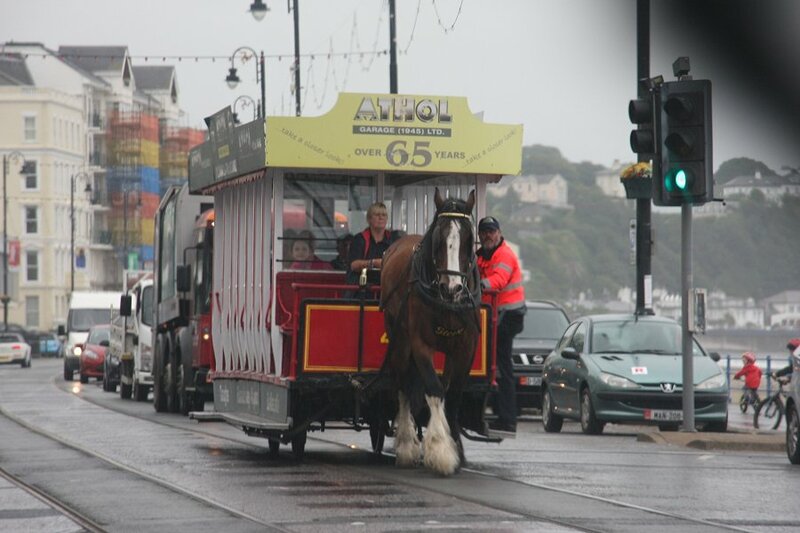 The electric railway ends in Douglas, and the Douglas Bay Horse Tramway takes over. They are, however, threatened with closure, as they cost more money to run than they make. This might be the last summer that they can be seen. 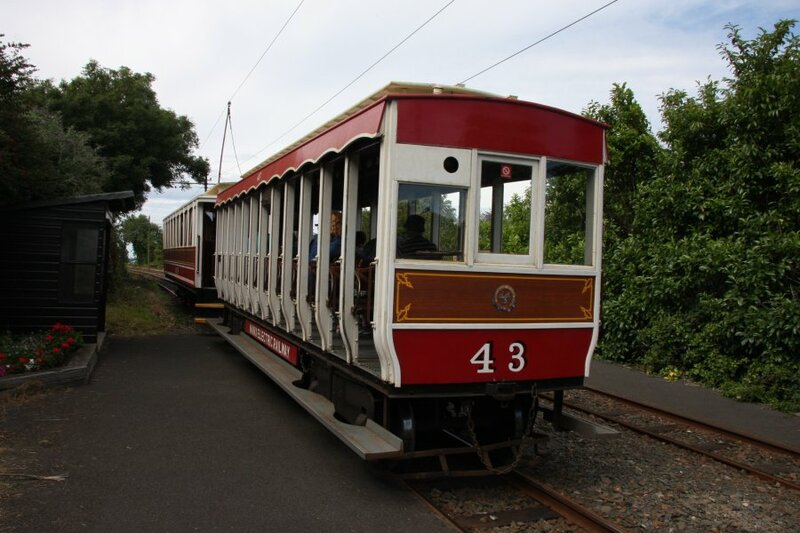 Dating from 1876, these trams use the same approach as the open cars on the electric railway. The conductor walks on the footplate, dodging the wing mirrors of passing cars, and car doors that get opened in their path. 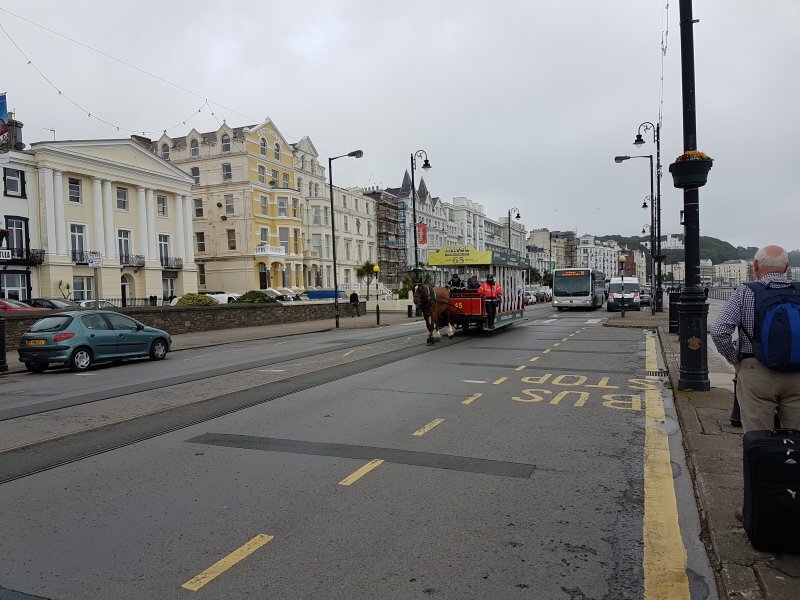 Being only 1 horsepower (or 0.864 horsepower for the actual daily output from a draught horse, depending on what source you read), they are not the fastest of vehicles, and you could move faster on foot. The traffic often queues up behind. Then someone asks the tram to stop, the driver applies the brake and blocks the road, the passengers are collected or dropped off, before it slowly picks up speed again. If you think it is annoying being behind a bus, imagine one of these instead. St. Mary's Isle (aka. 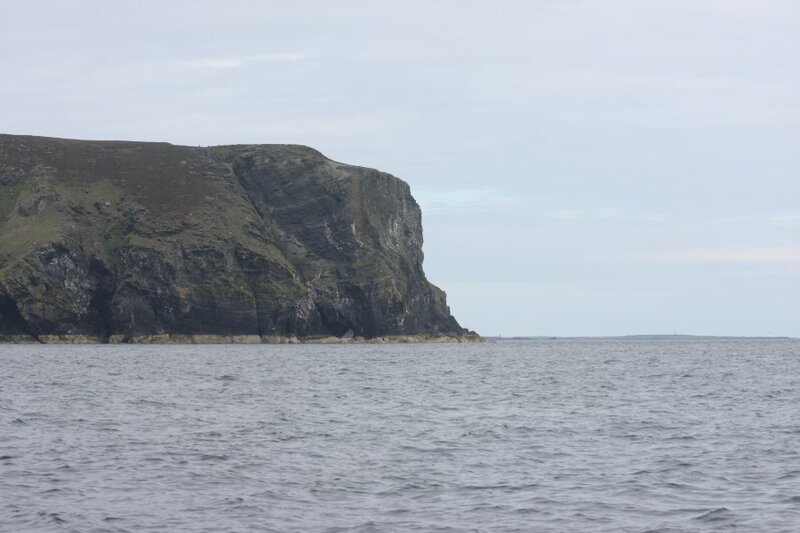 Conister Rock) sits in the bay at Douglas, and caused several shipwrecks due to being submerged at high tide. 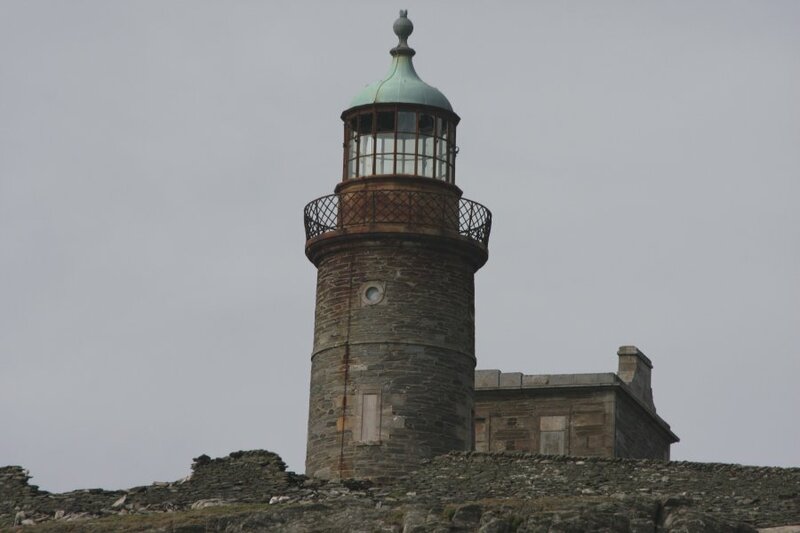 In 1832, the Tower of Refuge was built so that shipwrecked sailors could have somewhere to wait to be rescued. It was kept stocked with food, water, and a bell to call for help. Rather than a lighthouse. Or a bridge. The tower flies the national lifeboat flag, not any national flag. 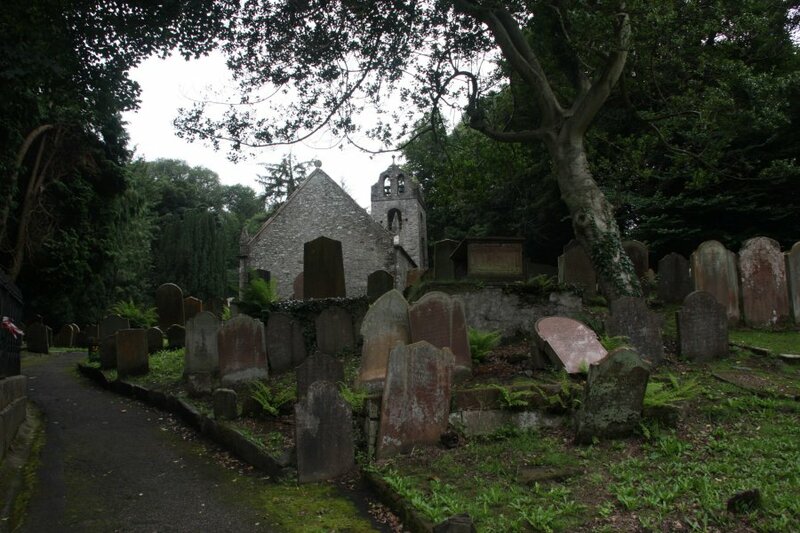 Old Kirk Braddan in Douglas. 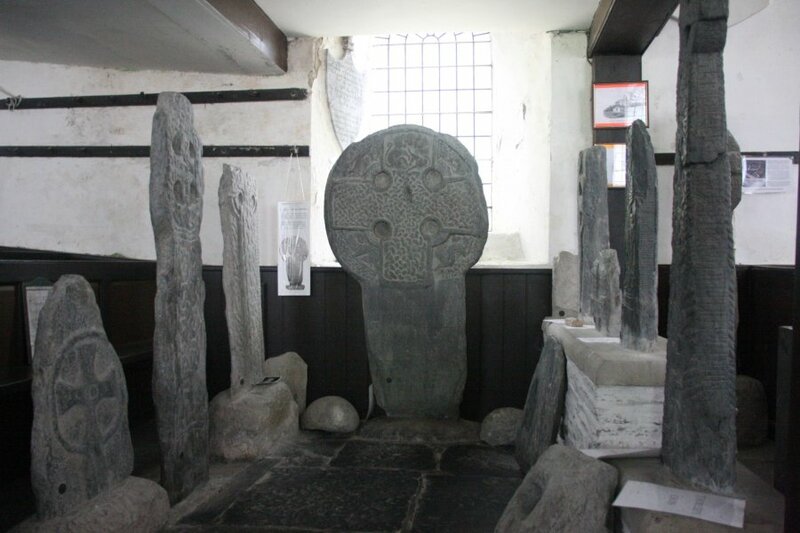 Celtic crosses in the church, known as the Braddan Crosses. 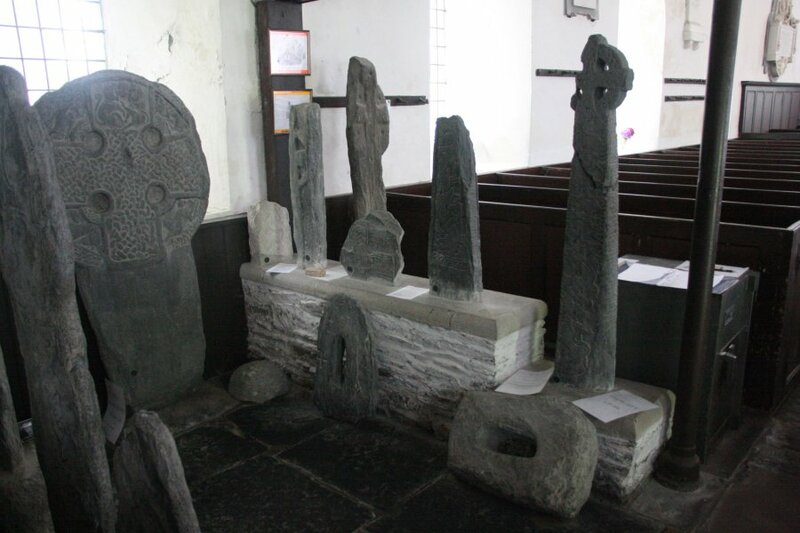 These are 1100 to 1200 years old, and many have the classic celtic knot carvings. The two on the right are Viking. 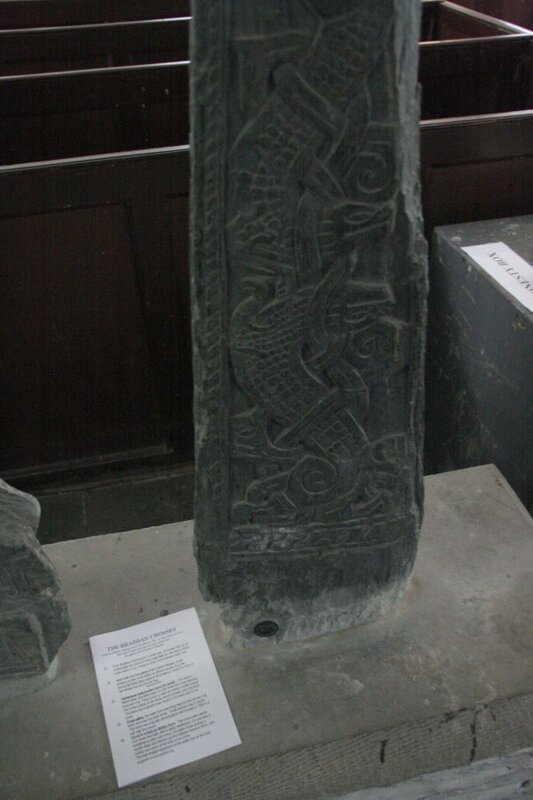 Viking carvings on Odd's Cross. 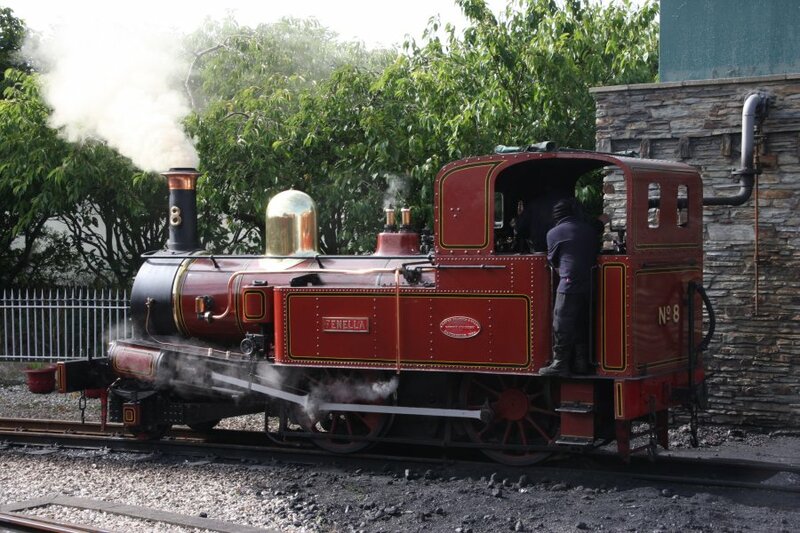 The Isle of Man steam railway begins or ends in Douglas. The other line running back up to Ramsey via the far side of the island no longer exists, but also used to begin here. Fenella would take us further down the coast (we actually did this as a return journey starting at the other end of the line). 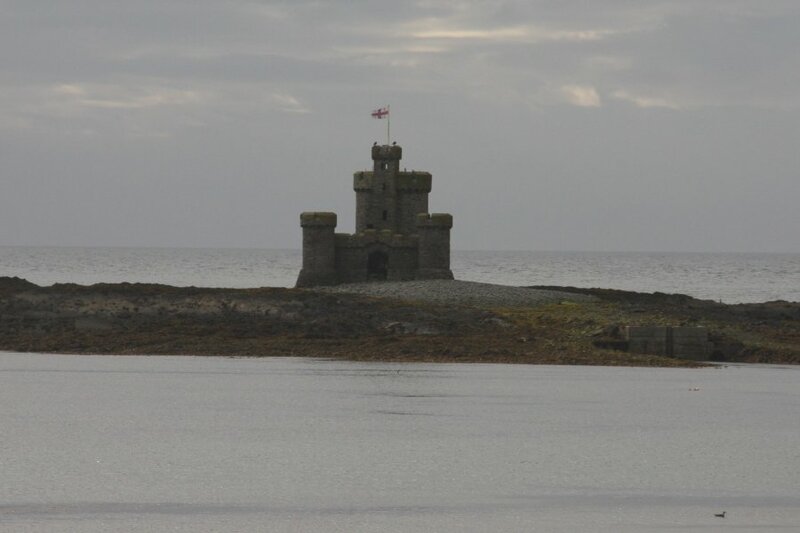 The Langness peninsula at Castletown. 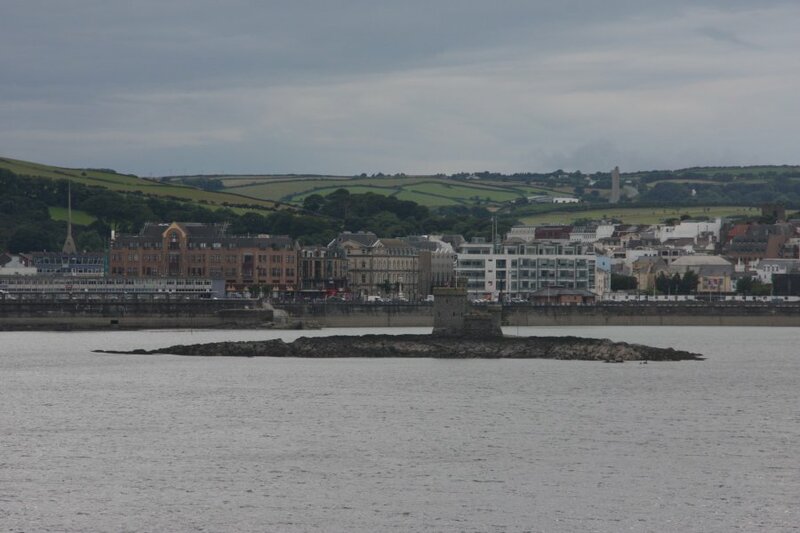 The short stone tower of the Derby Fort and Battery can be seen on St. Michael's Island at the near side, and the taller stone tower at the far side. G. H. Wood passing at Castletown. South Barrule seen from Ballabeg. Bradda Hill and Lhiattee ny Beinnee from Port St. Mary. Mull Hill from back down the line at Castletown. 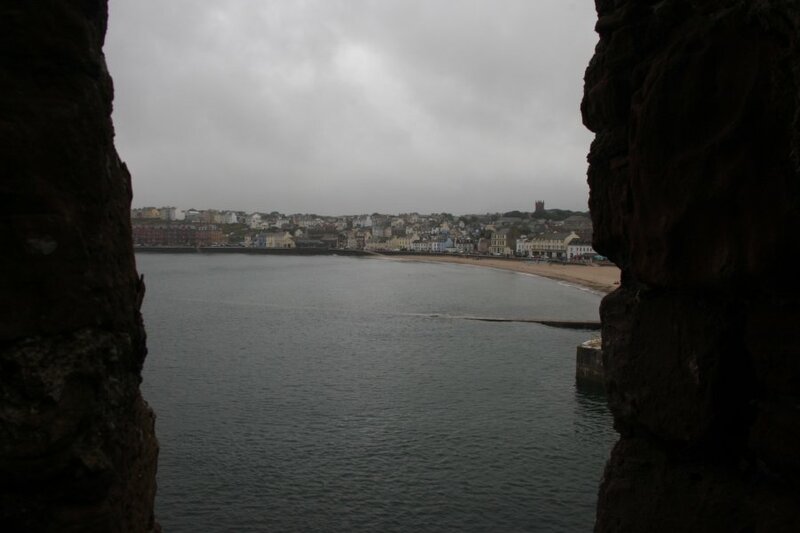 Port Erin from its harbour wall. 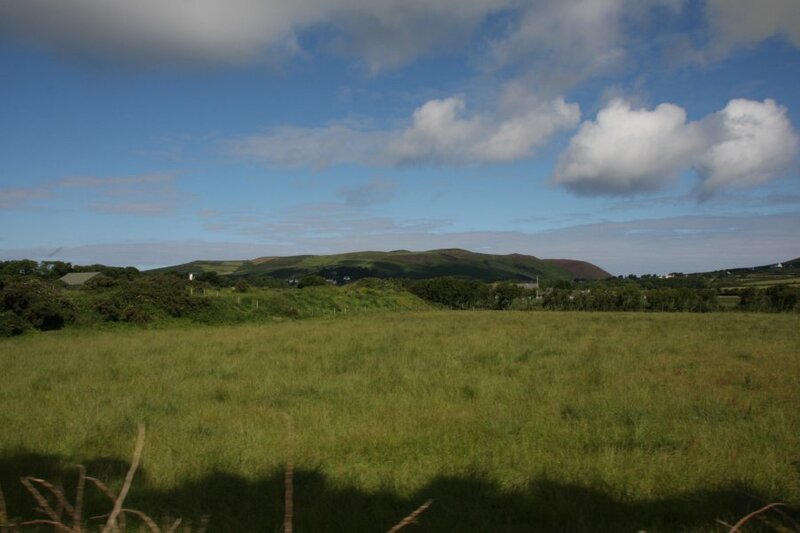 The hills are Bradda Hill, Lhiattee ny Beinnee and Mull Hill on the right. The beautiful blue waters are crystal clear, due to the lack of major rivers on the island, and subsequent lack of silt in the water. 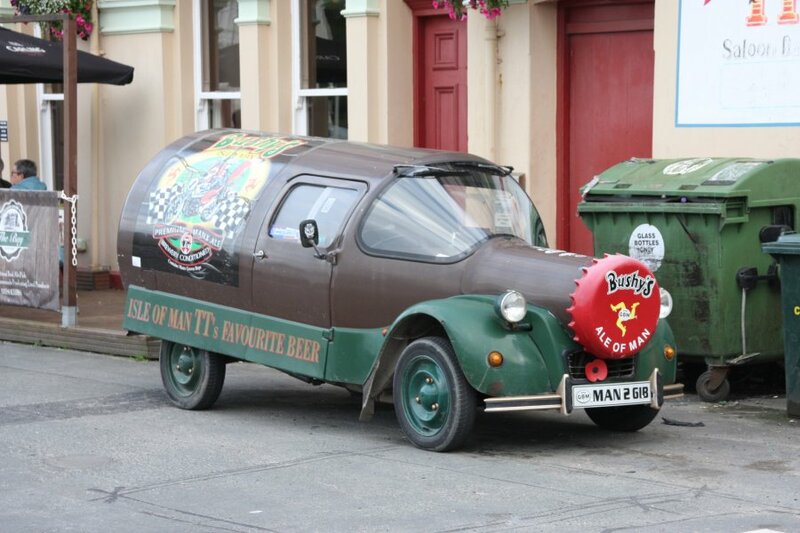 Bushys Ale of Man, in Port Erin. 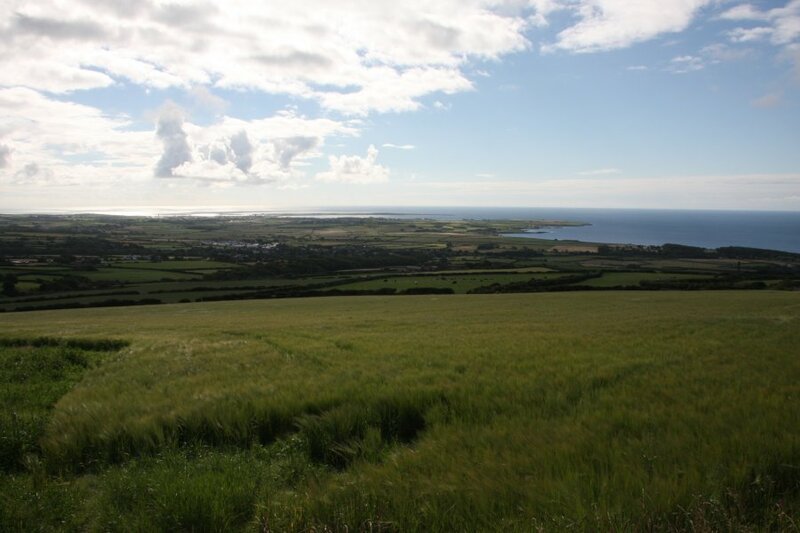 Superb view over Port Erin from Ballnahowe on Mull Hill. 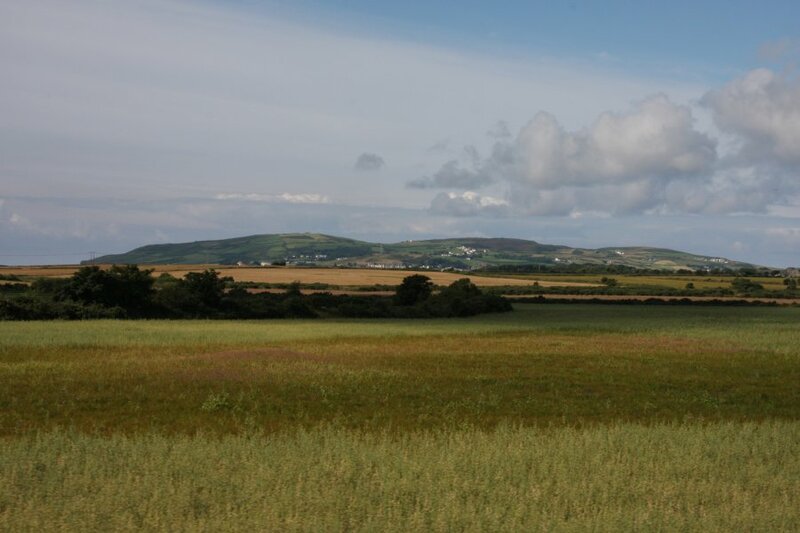 The hills are Bradda Hill, Lhiattee ny Beinnee, Cronk ny Arrey Laa, South Barrule, the top of Carn Gerjoil and The Mount. The Scarlett peninsula at Castletown is on the right with the Langness peninsula behind it. 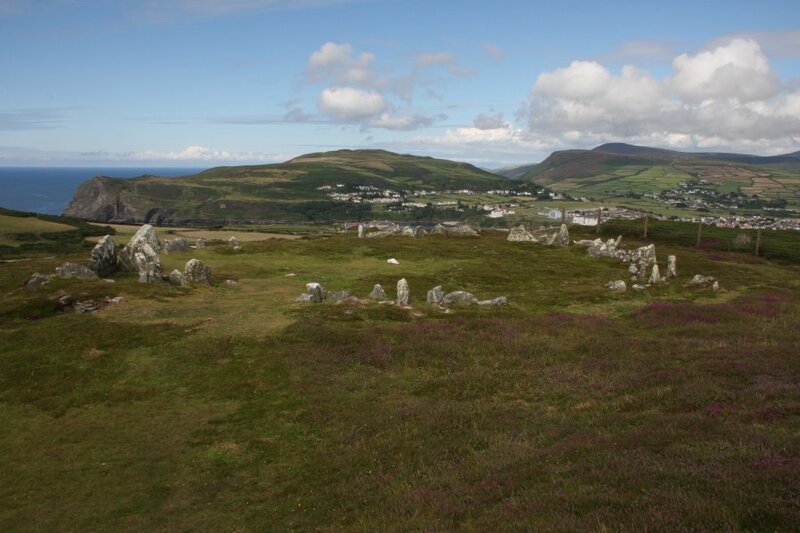 The Mull (or Meayll) Stone Circle on Mull Hill, around 5500 years old. 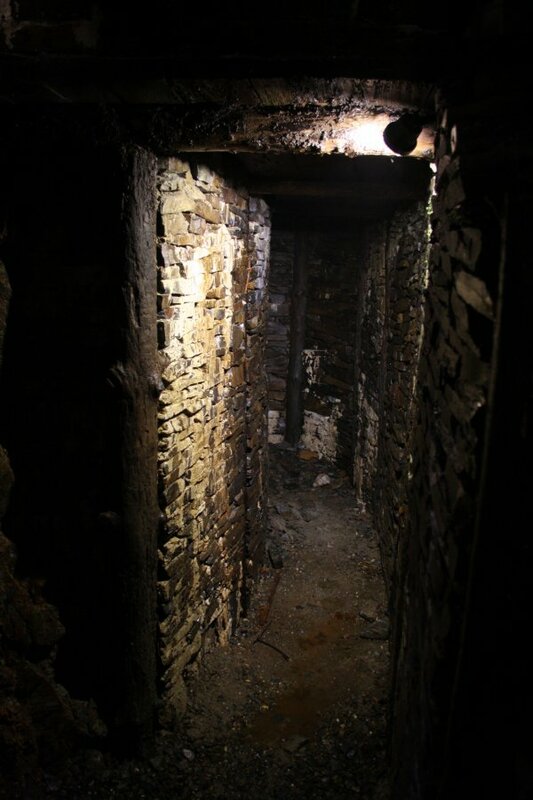 The stones that stick out to the sides are 6 pairs of burial chambers, each with a combined entrance between them. 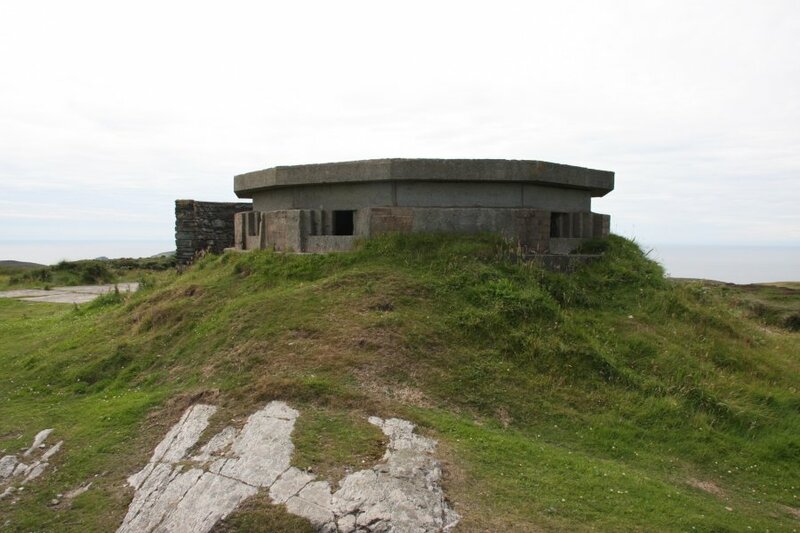 On top of Mull Hill are the remains of the Cregneash World War II Chain Home Low radar station, which could detect low flying aircraft approaching Great Britain. This is one of the surviving pillboxes. Second pillbox, with a modern structure behind it. View north from the radar site - the tracks are part of the site. Bradda Hill, Corrins Hill, Dalby Mountain, Lhiattee ny Beinnee, Cronk ny Arrey Laa, South Barrule, Snaefell, North Barrule, Carn Gerjoil and The Mount. The Scarlett peninsula and Langness peninsula are on the right again, with The Carrick island barely above water in Bay ny Carrickey, in front of the Scarlett peninsula. 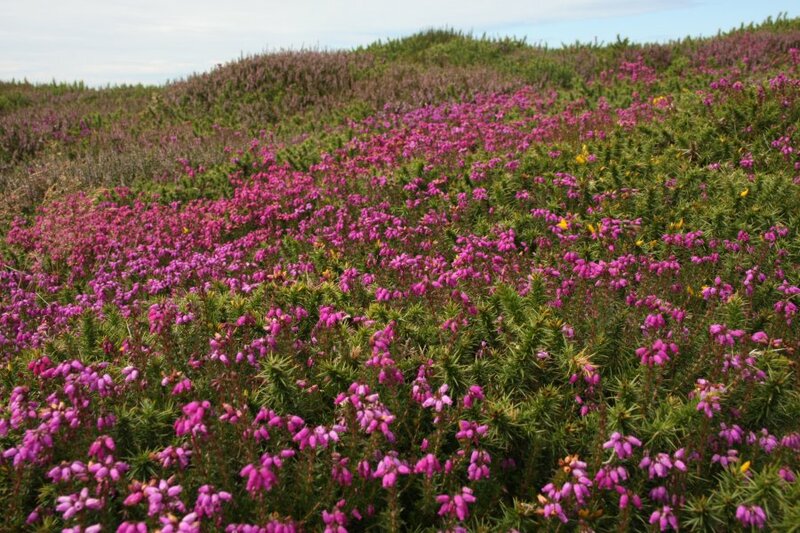 Heather and gorse on Mull Hill. 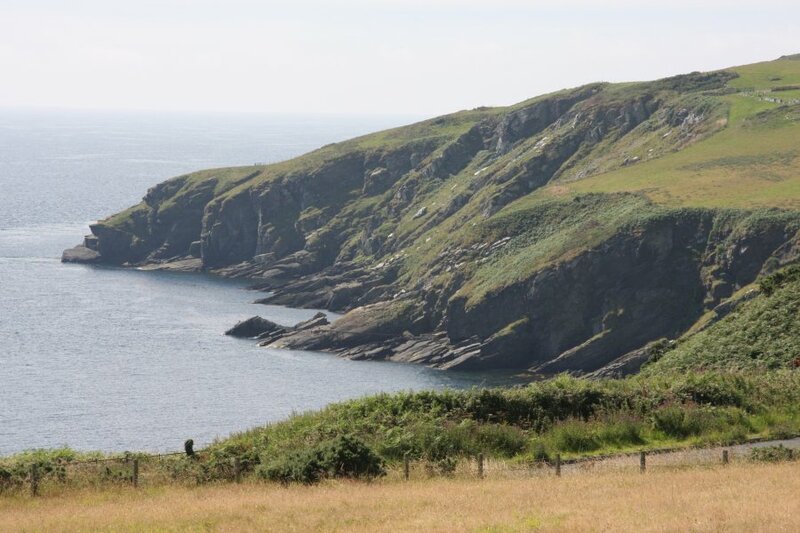 Calf of Man, the largest satellite island of the Isle of Man. 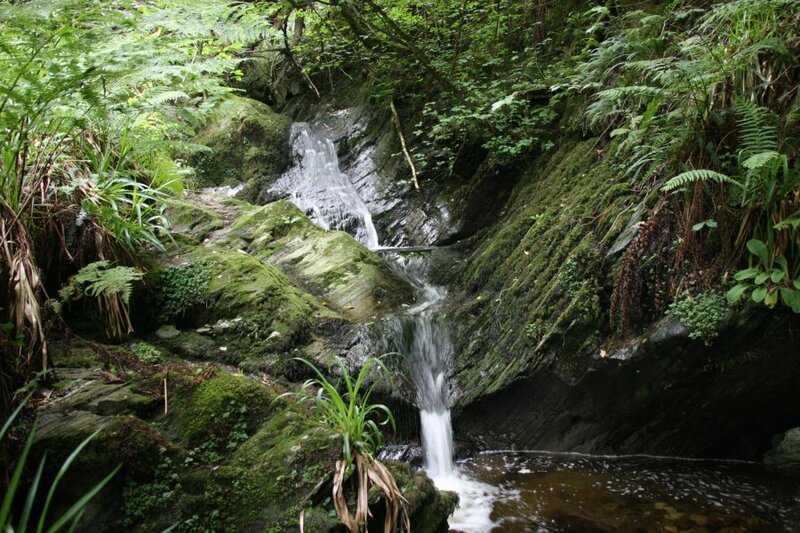 It is a bird sanctuary, dedicated to the Manx sheerwaters that breed here. 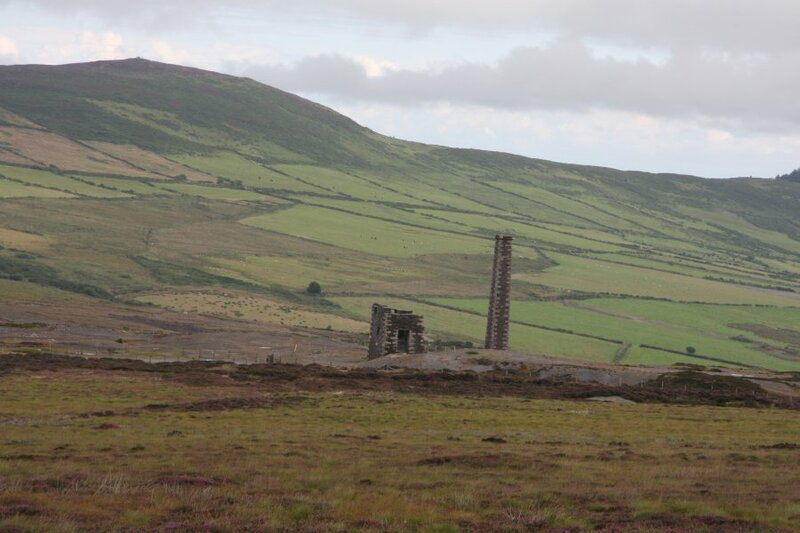 Milner's Tower and the South Bradda Mine on Bradda Head. 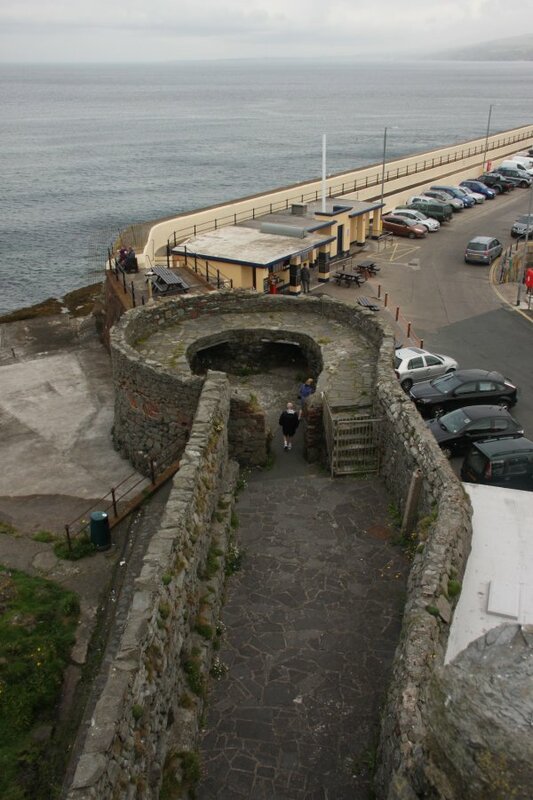 The tower dates from 1871, designed to look like a keyhole from above. 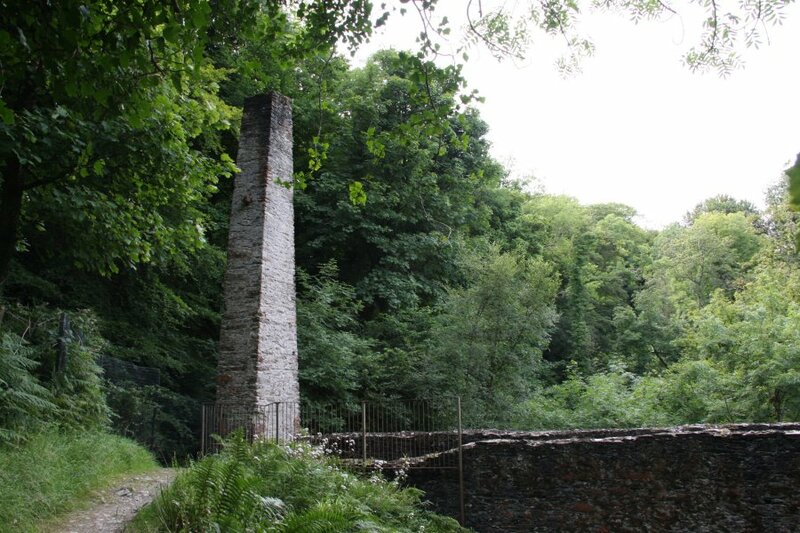 The mine engine house dates from somewhere between 1740 and 1883, and the mine itself was high above water level. 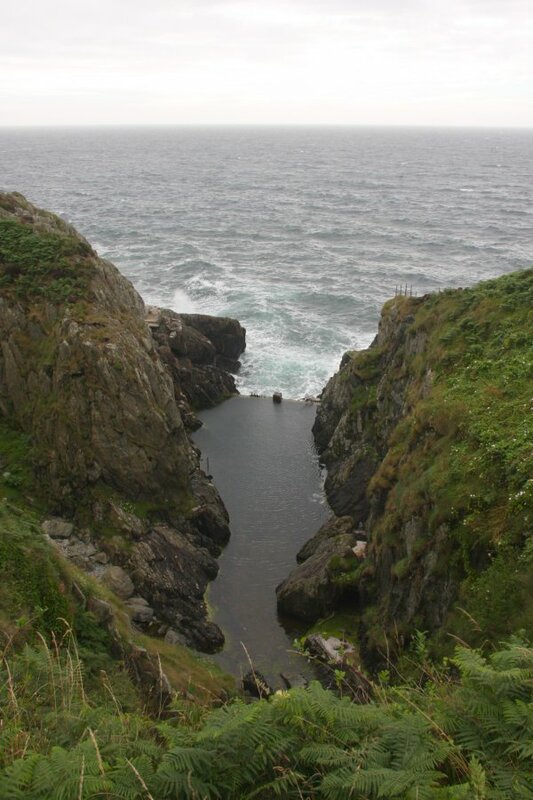 70 metre cliffs below Ballnahowe. 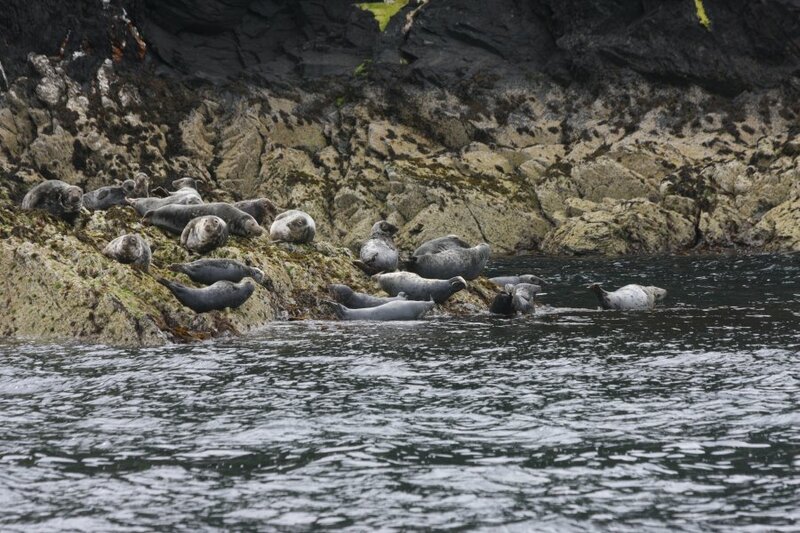 Seals in Calf Sound, the channel between the islands. 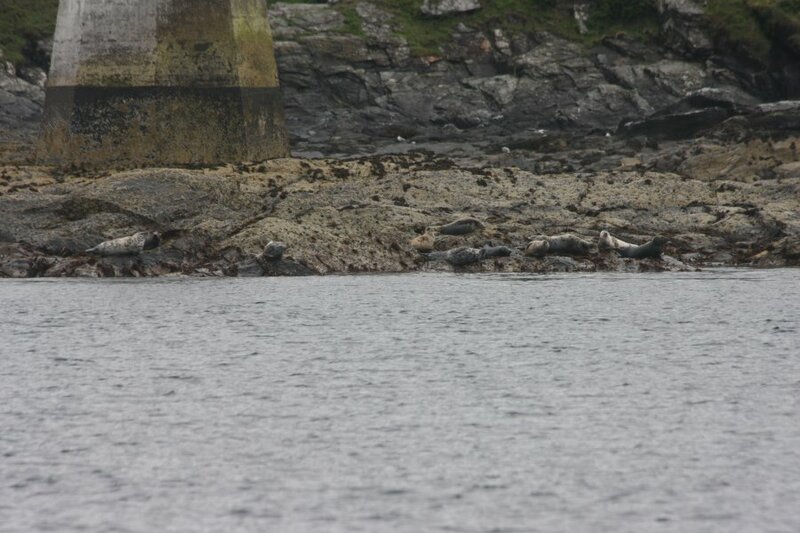 We also saw a harbour porpose for a few seconds here, but it disappeared too fast for the cameras. 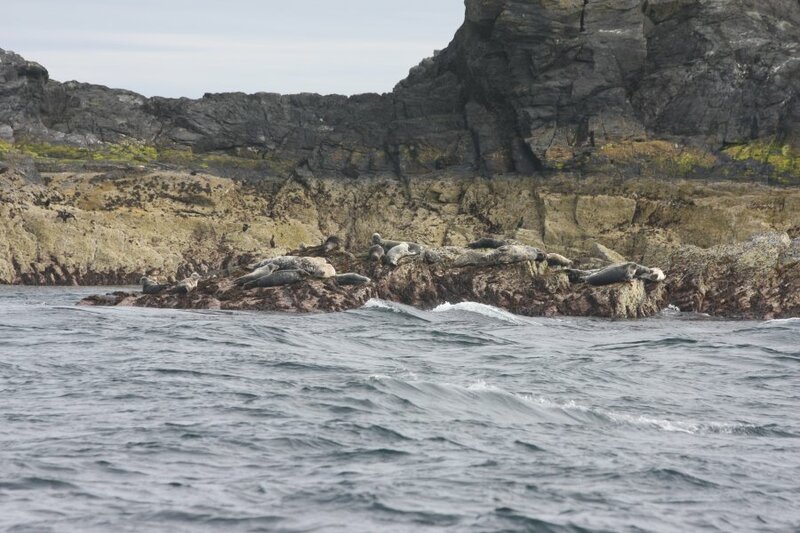 Seals by the Thousla Rock Beacon. 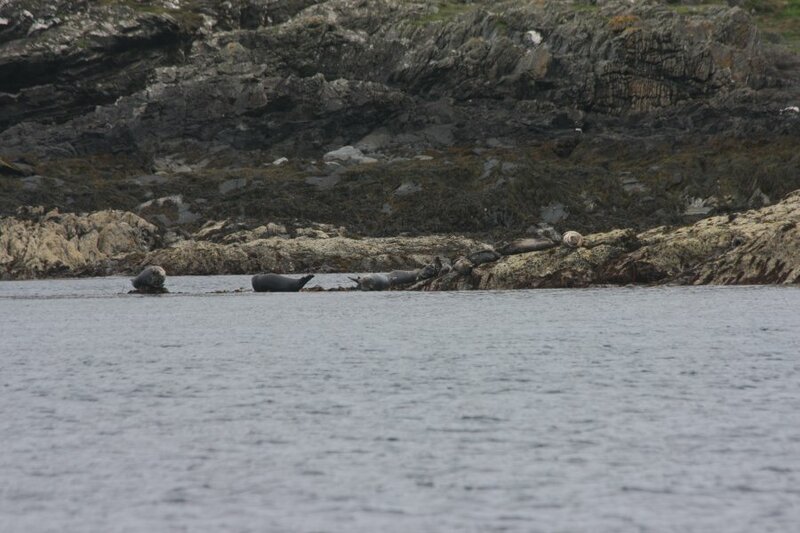 Seals watching the seal watchers. 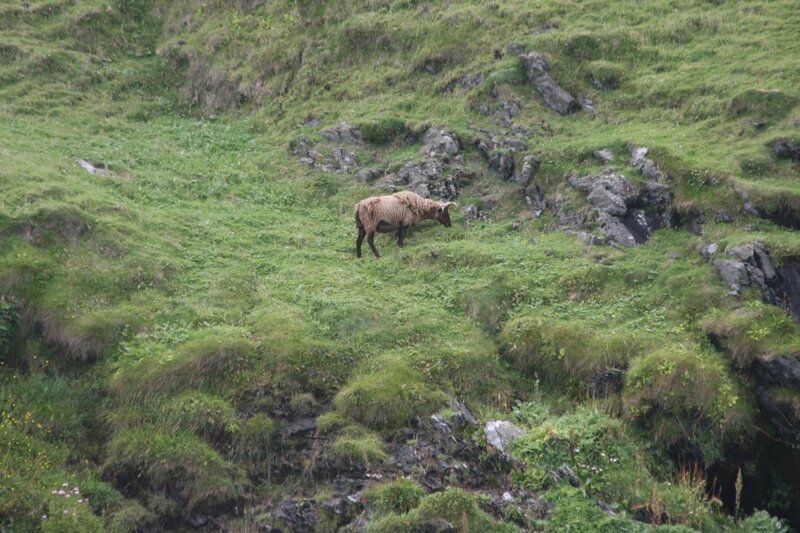 Manx sheep keeping the grass short on the island. Spanish Head on the main island. 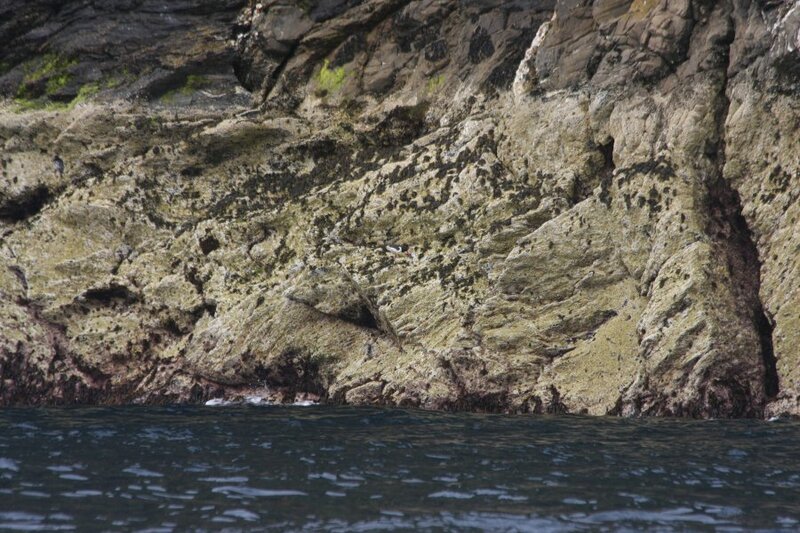 The cliffs are around 100 metres high. 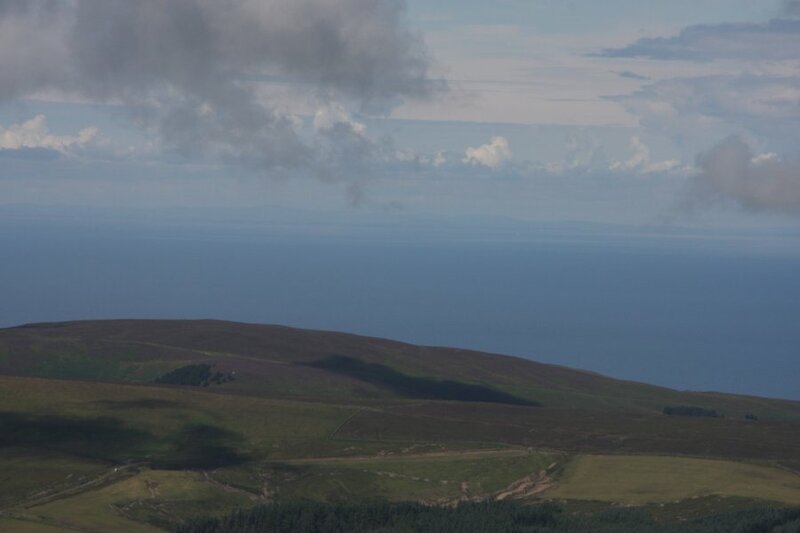 On the right is the Langness peninsula. In the middle of the rise (if you can see it) is the stone tower, while the white glint near the right edge of the picture is Langness Lighthouse. Burroo, the Dragon Rock. 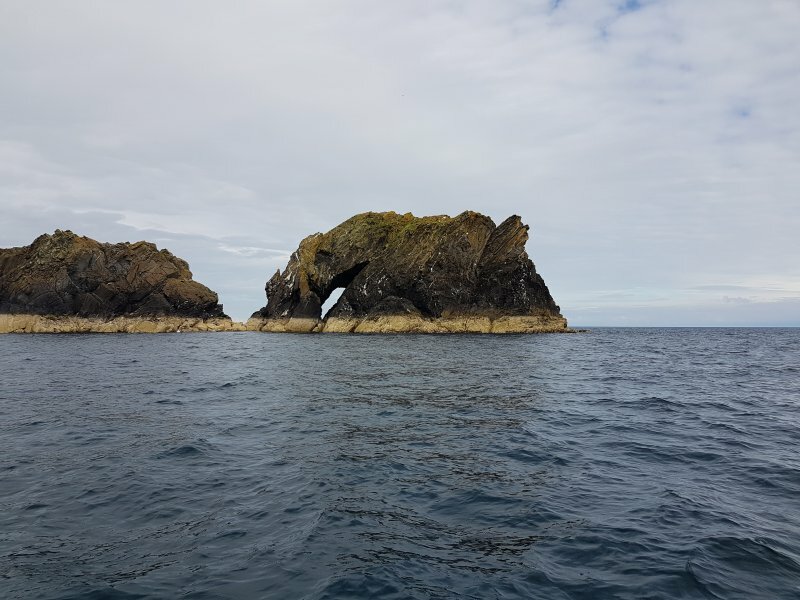 The natural shape and cave look like a dragon sitting in the water and leaning down for a drink - the effect works from both sides. 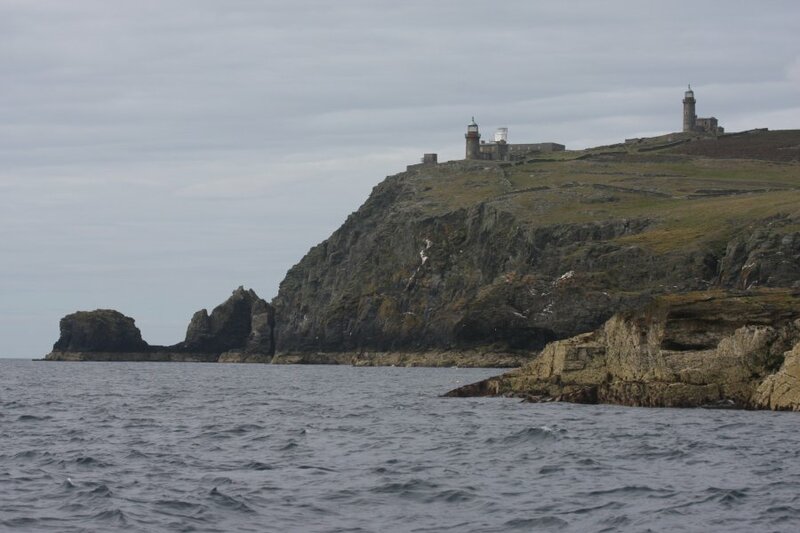 Chicken Rock Lighthouse on Chicken Rock, the most southerly point of the Isle of Man. 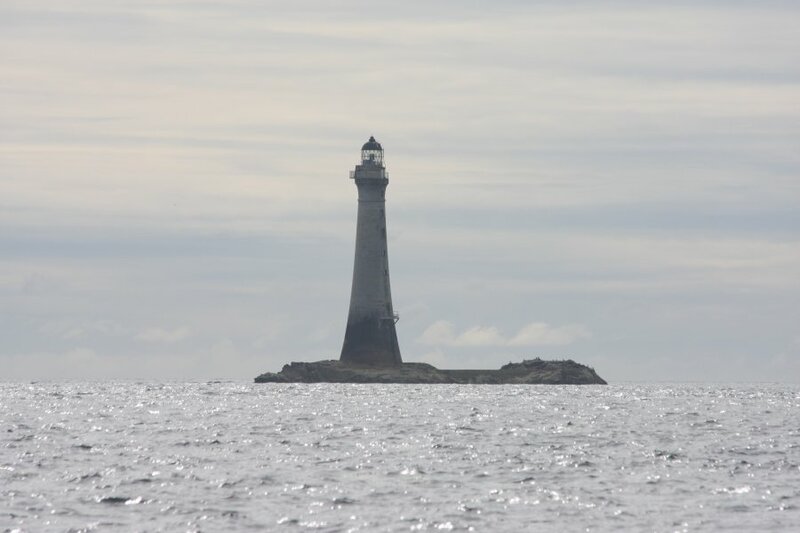 The 44 metre lighthouse was completed in 1875. 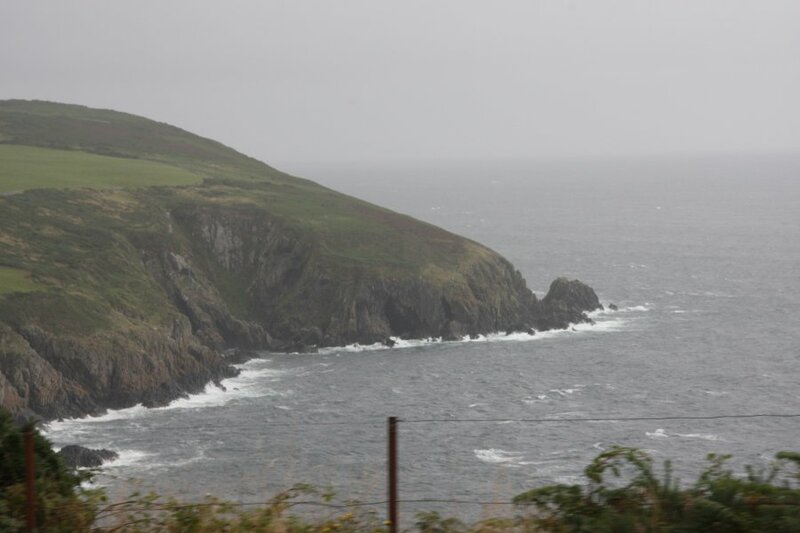 There are three large lighthouses on the Calf of Man. 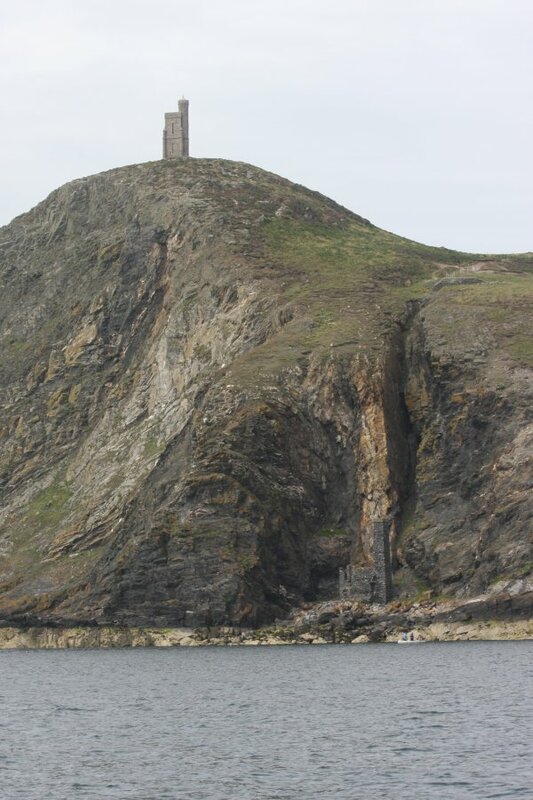 Before the Chicken Rock Lighthouse was built, the Chicken Rock was a serious danger to ships, so the two Calf of Man lighthouses (Low on the left, High on the right) were built in 1818. If a ship saw the two lights directly beneath each other, they were heading towards the Chicken Rock. 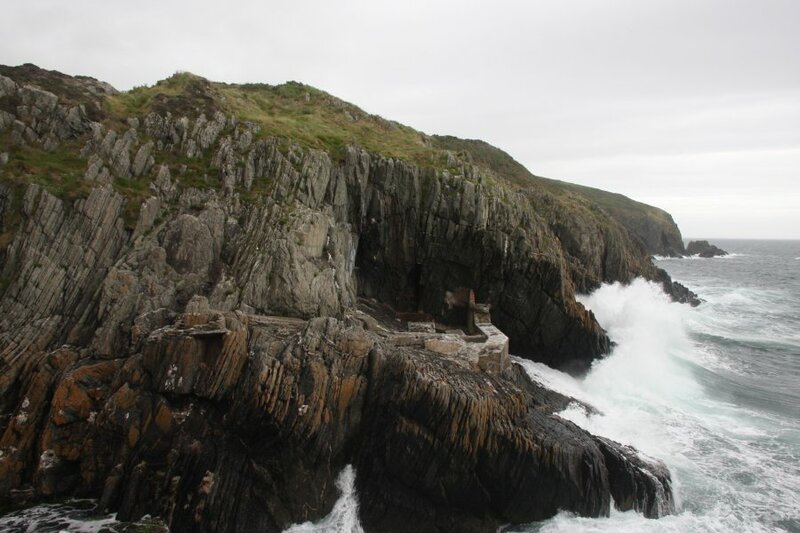 The centre lighthouse was built in 1968 after the Chicken Rock lighthouse was temporarily shut down by a fire (why not just reuse the two existing ones?). Calf of Man Low Lighthouse. 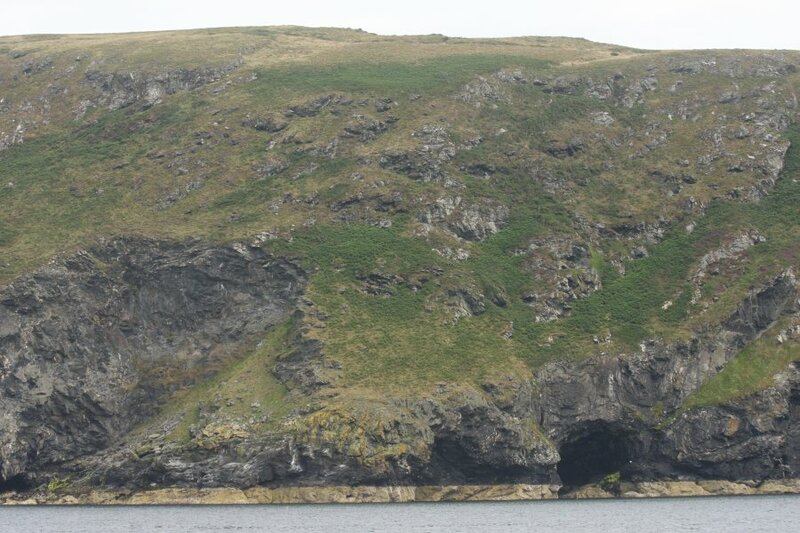 Blowhole (note the fenced opening above the cave) and sea cave on the Calf of Man. The cliffs are about 40 metres high. Oystercatcher. Can you see it? 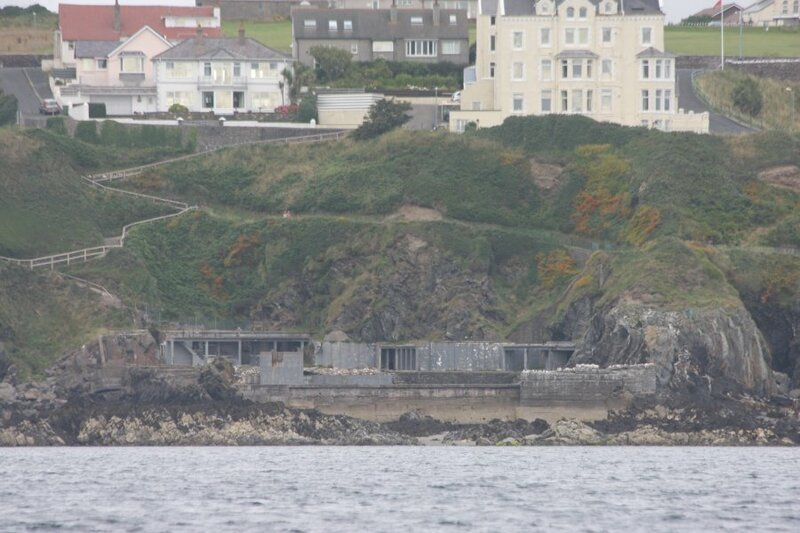 Remains of the Traie Menagh Baths, a lido (outdoor swimming pool and resort) in Port Erin, built in 1899 and closed in 1981. 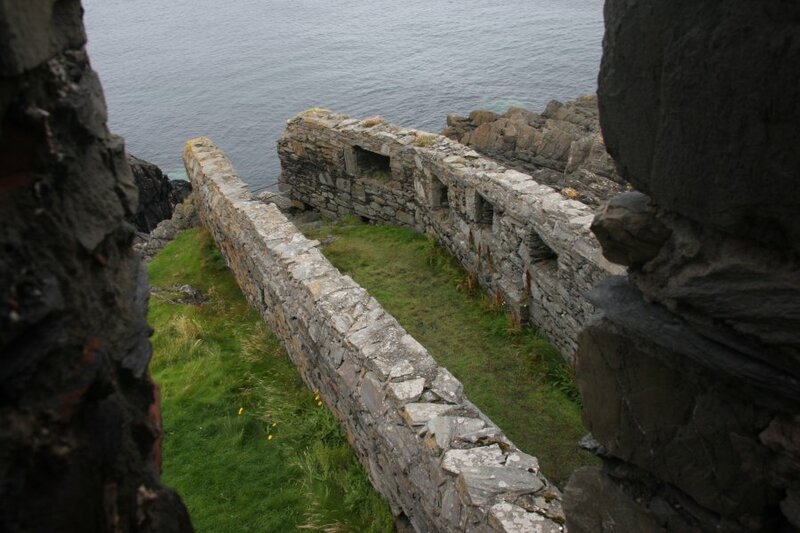 Since then, it was temporarily used as a fishery, but is now derelict. Sunset in Port Erin, behind the mountains of Ireland. The hill on the left (above the lighthouse) is the Carlingford Mountain range in the Republic of Ireland, 95 km away. 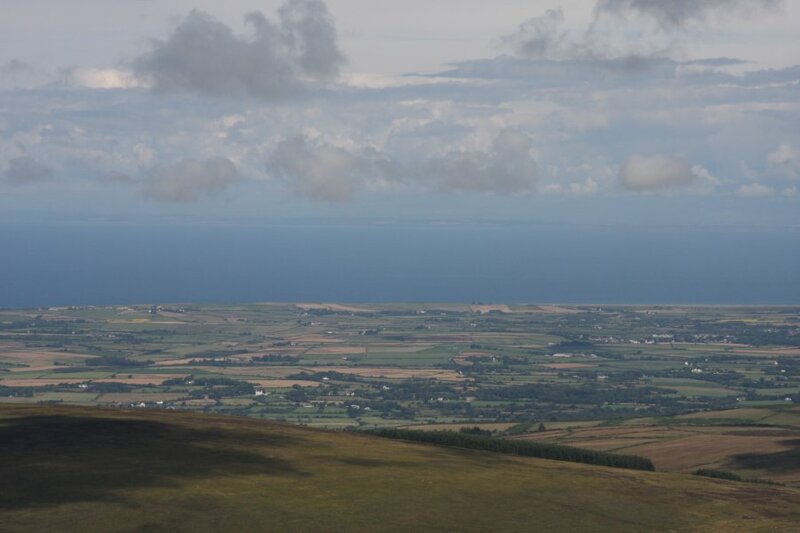 The main mountains in the middle are the Mourne Mountains between 75 km and 90 km away in Northern Ireland, with Slieve Donard (850 metres) at the right end being the tallest mountain in Northern Ireland. The mountain on the right is Slieve Croob, 85 km away in Northern Ireland. 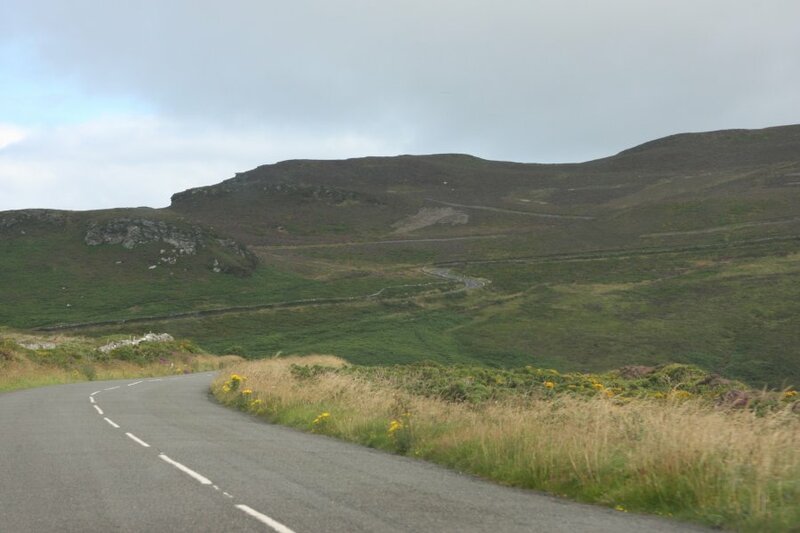 On the slopes of Cronk ny Arrey Laa is a magnetic hill - an optical illusion where after driving downhill for a while, you mistake a gentler downhill slope for an uphill slope, so you can roll downhill without power, while thinking you are going uphill. We tried it, and the hill ended exactly where we thought it ended. The effect did not work. Perhaps someone turned off the magnet. 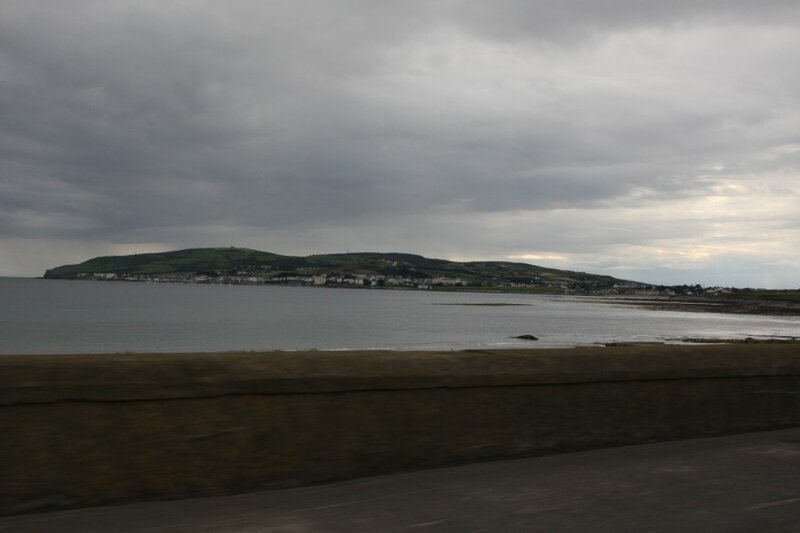 The Mourne Mountains in Northern Ireland, seen from South Barrule. 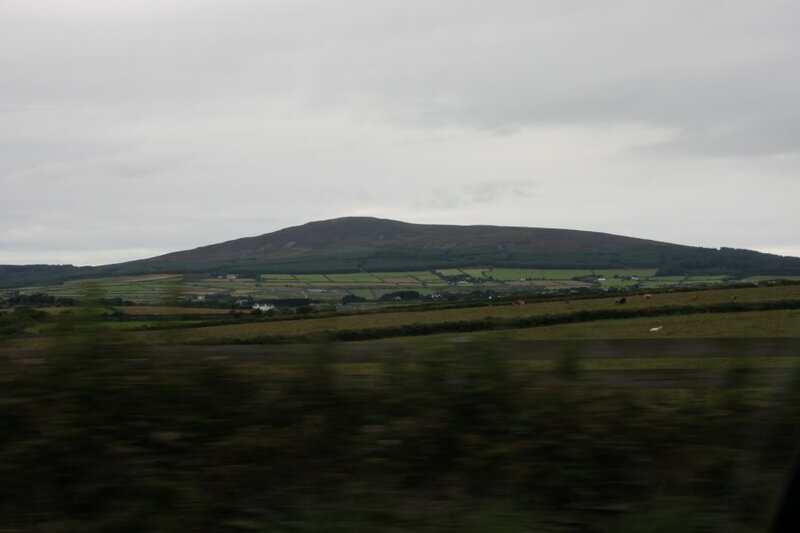 Slieve Croob in Northern Ireland, seen from South Barrule. Slieau Ruy from St. John's. 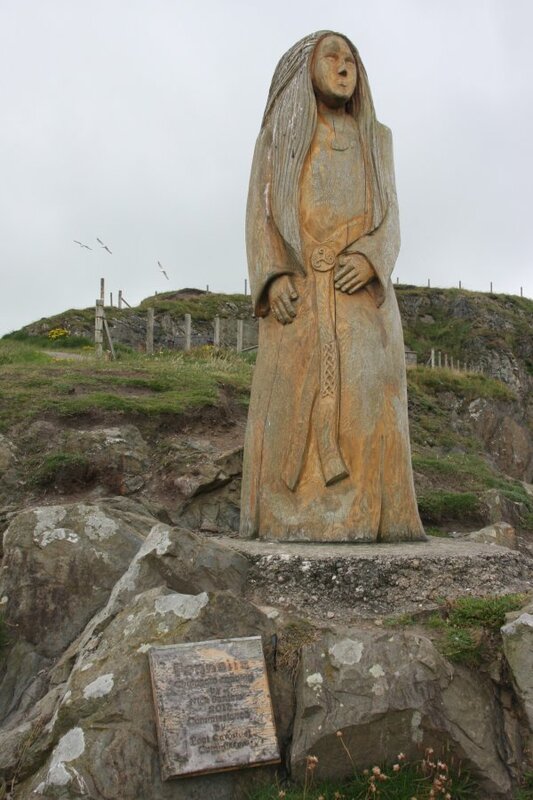 Carving of Fenella at Peel - a character from Sir Walter Scott's Peveril of the Peak (referred to as a deaf and dumb dwarf), and the namesake of the steam engine. Corrins Hill from the Peel Castle. 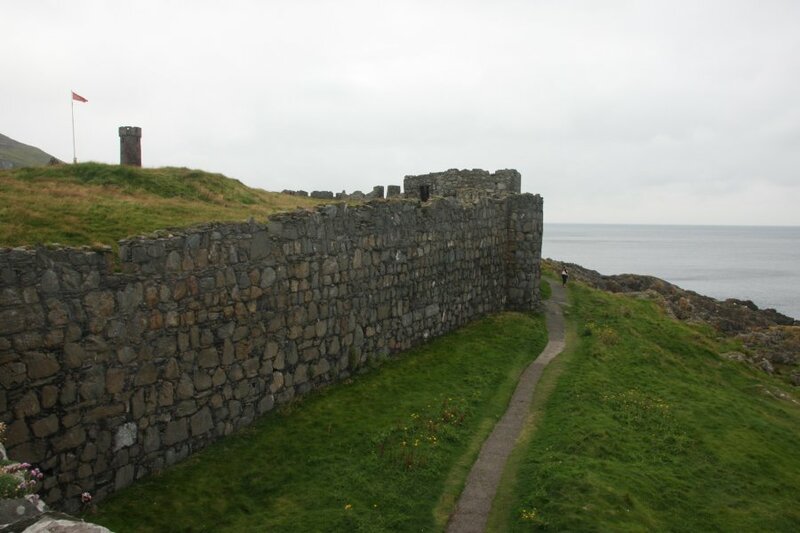 Peel Castle on St. Patrick's Isle in Peel. 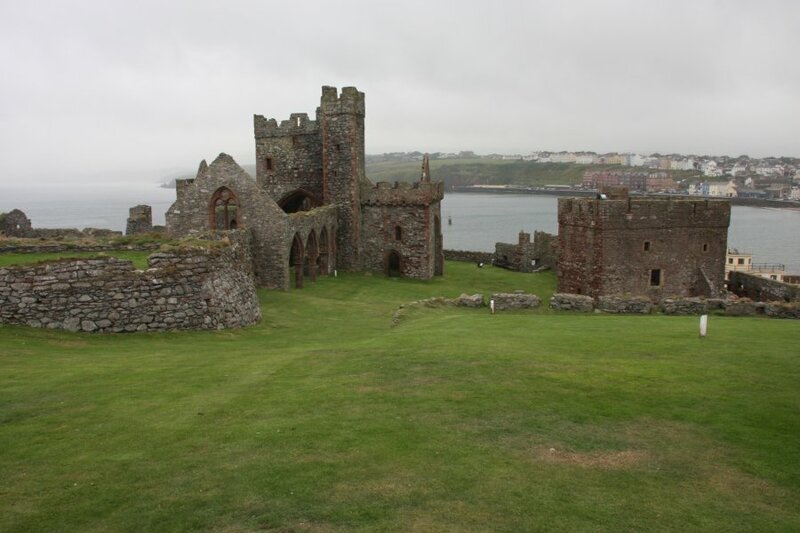 This is a defensive castle with the defenses on what might appear to be the wrong side; pointing towards the island, instead of protecting it from invaders. 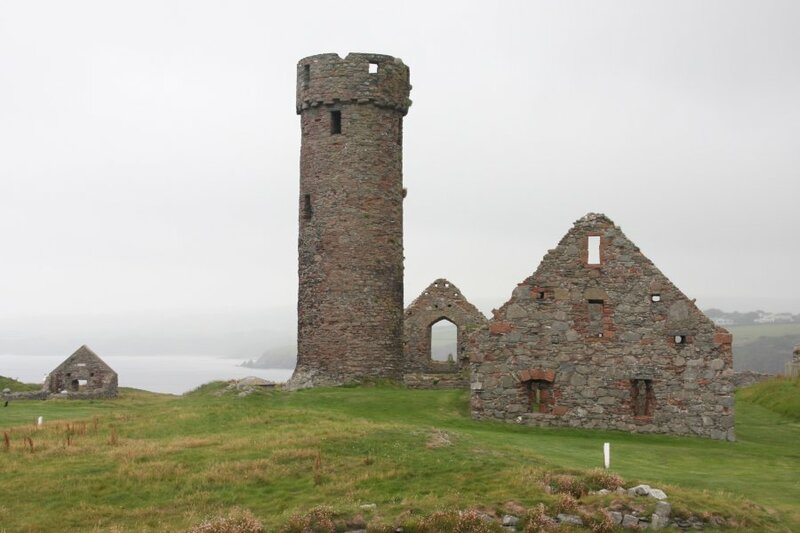 The castle belonged alternately to the English and Scottish, and was - until the causeway was built in about 1750 - separated from the main island by the sea. 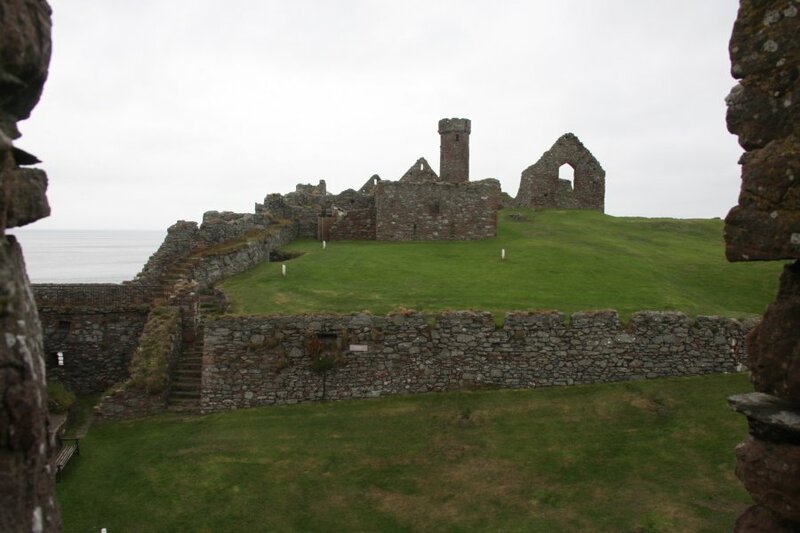 It was used as a stronghold for when the islanders rebelled against their English or Scottish overlords. 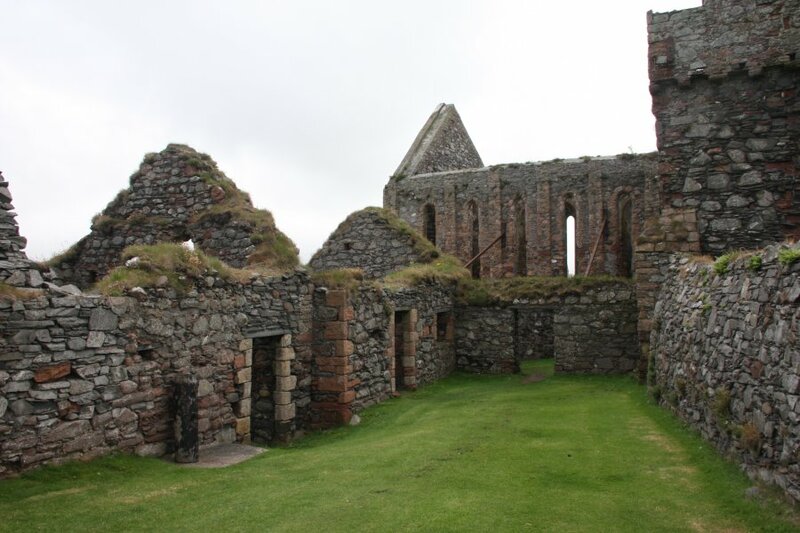 Before that, it was a Viking stronghold (they owned the Isle of Man before the English or Scotish), and before that, it was a monastery. 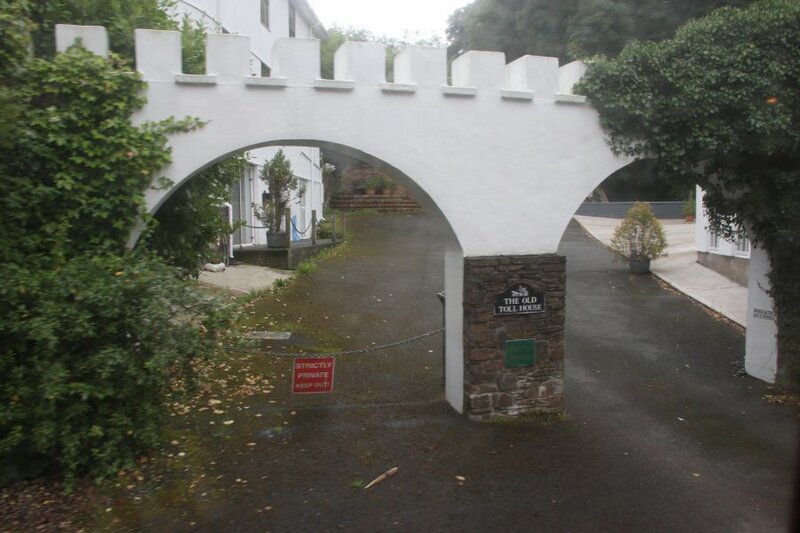 360° panorama of the castle buildings. Gatehouse on the left, cannon pointing towards the island, armory and older towers, newer gun battery, and cathedral. 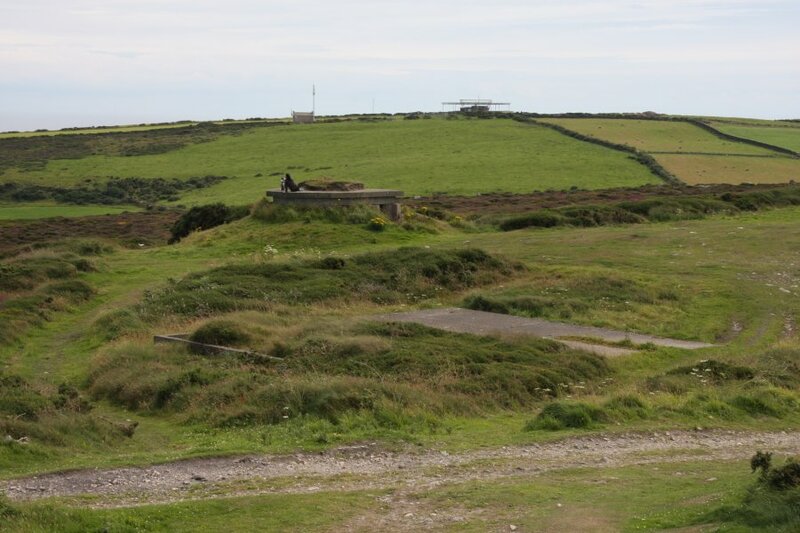 Circular gun battery, St. German's Cathedral, and the gatehouse. 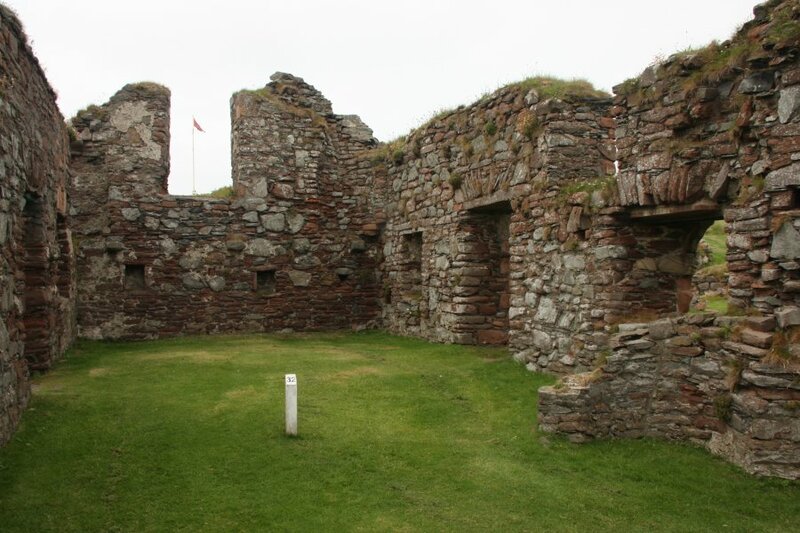 The oldest parts of Peel Castle. 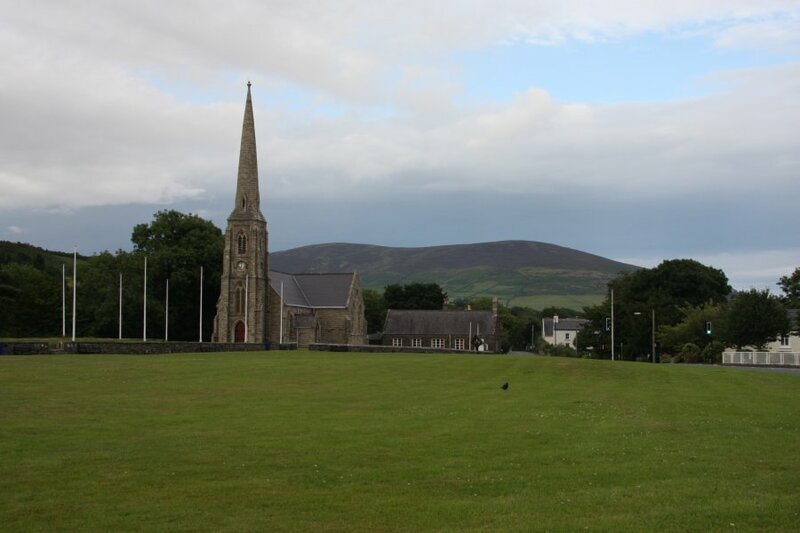 On the left is St. Patrick's Chapel, followed by the round tower, and another building. 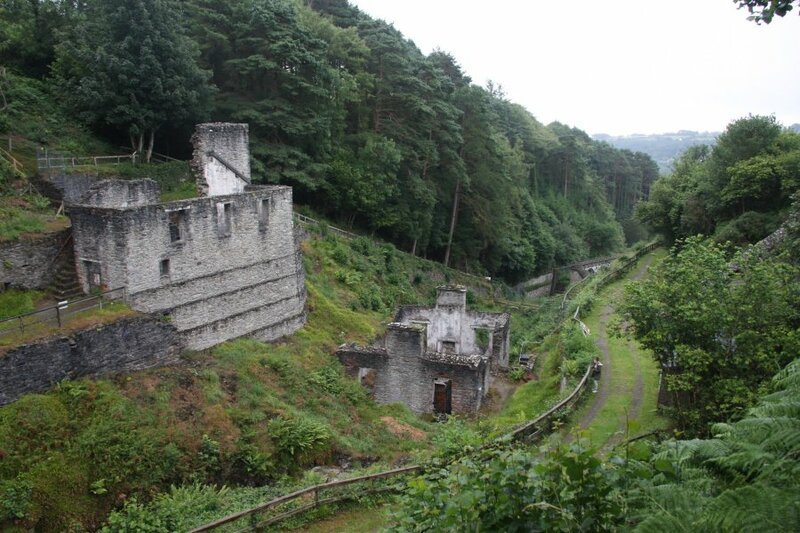 These are all 10th to 11th century, dating from the monastery, and therefore predating all fortifications. The building on the right is 500 years younger. 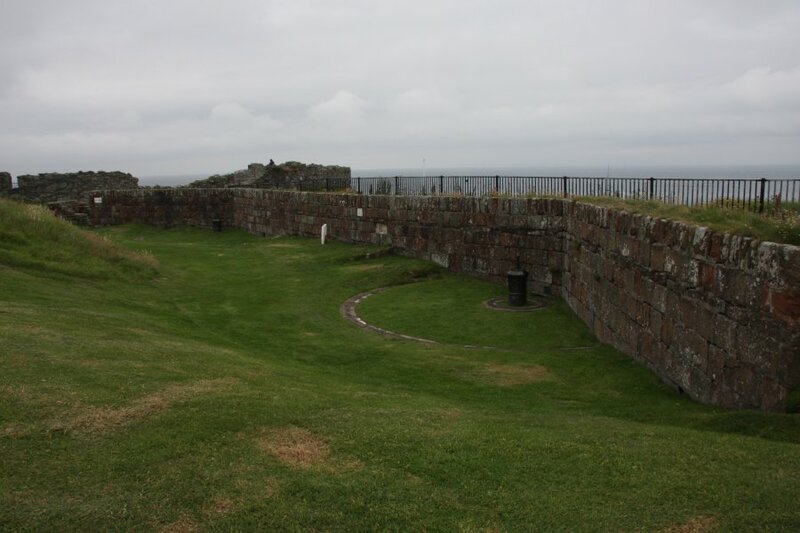 A late part of the castle; a wall with holes for shooting muskets through. 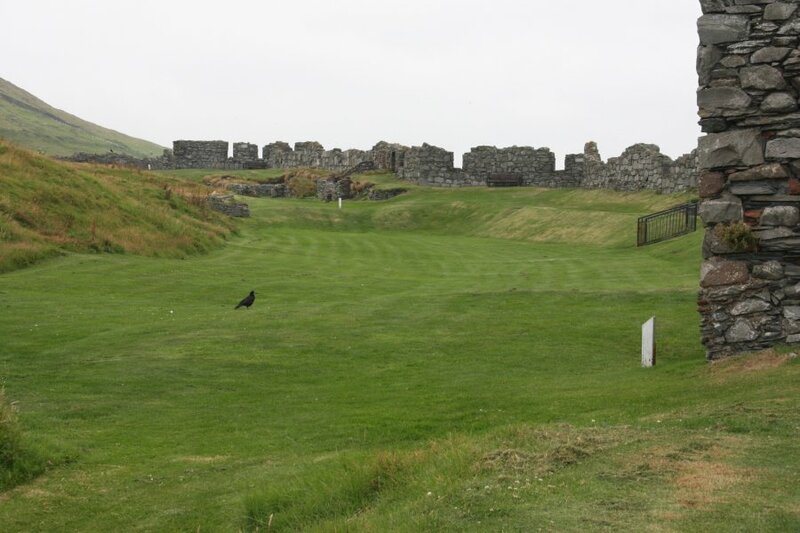 Training area surrounded by the 15th century curtain wall. 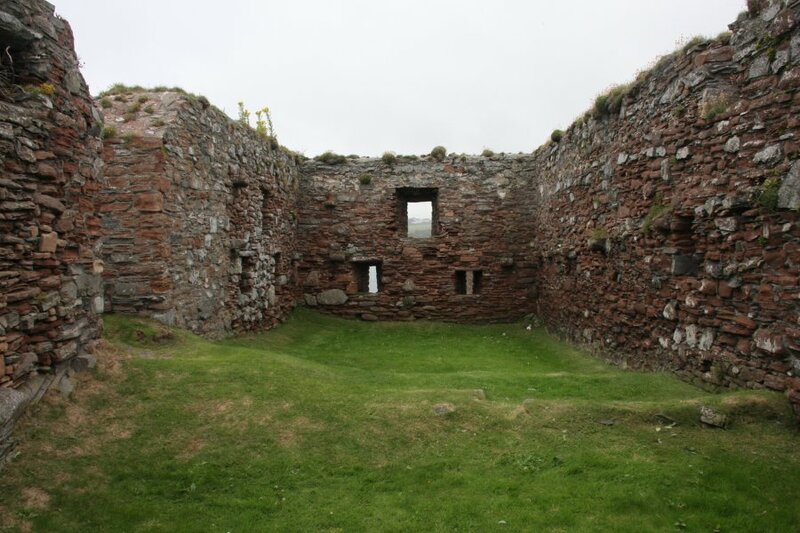 Beneath the second gateway tower was the well room - the well was in the floor here, but has been filled in. Recent battery, dating from the American war of independence (presumably for fending off American allies in Europe). Apartments from the Napoleonic Wars era. Apartments next to the cathedral. Glen Mooar - the one near Kirk Michael. 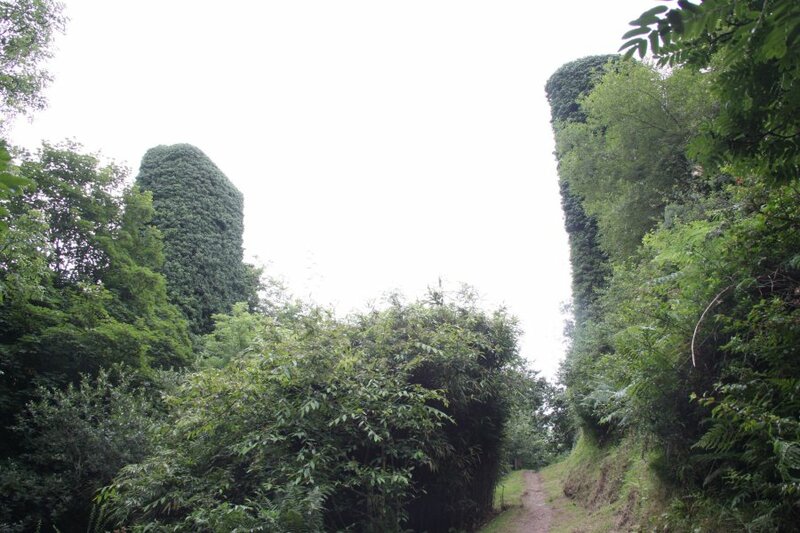 The ivy-covered stone pillars once held an iron viaduct over the valley. 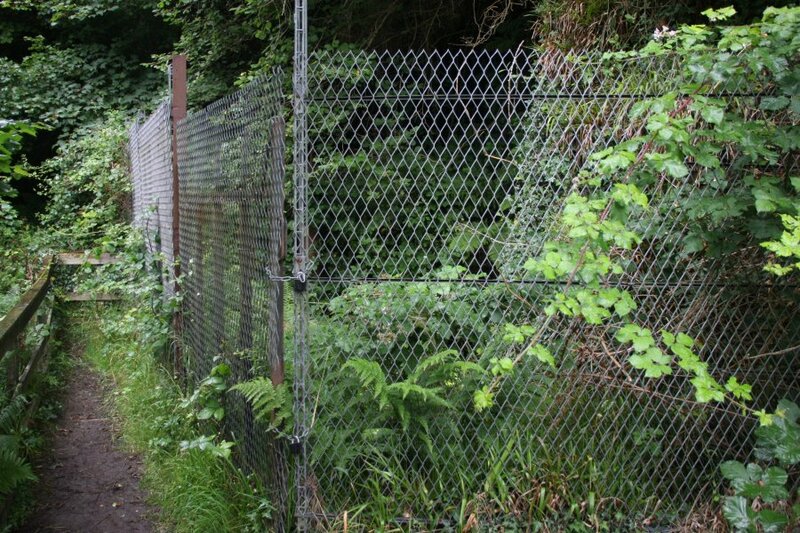 This is part of the dismantled railway that used to run from Douglas to Ramsey. 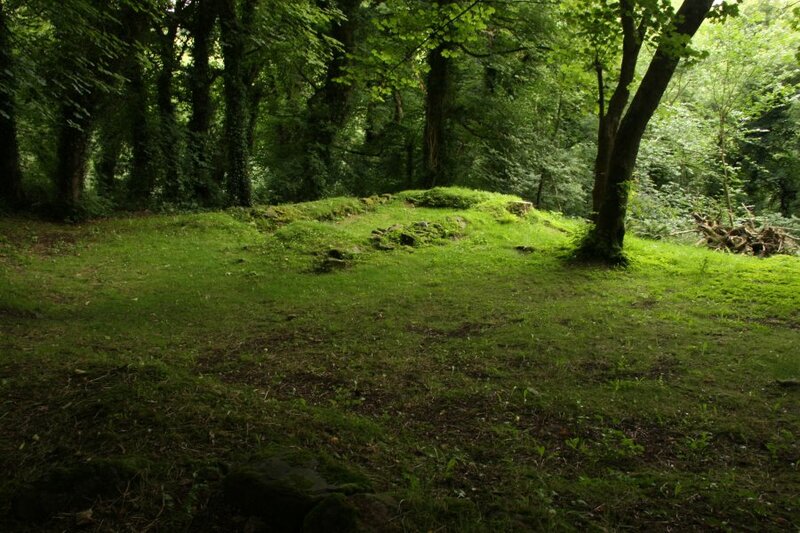 The remains of Patrick's Chapel and its graveyard, as much as 1200 years old. 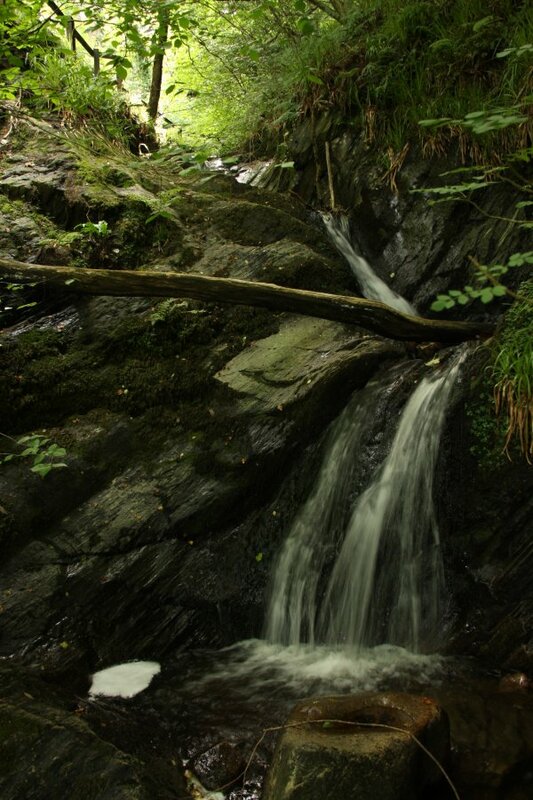 Spooyt Vane waterfall in Glen Mooar, regarded as one of the most beautiful on the island. 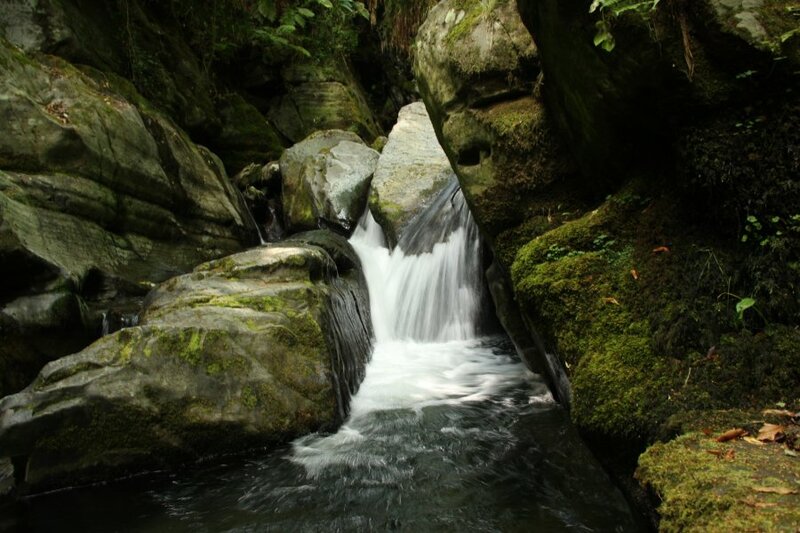 The lower drop is about 7 metres, and the upper drop is about 5 metres. 3 metre waterfall immediately above them - very difficult to get a view of, hidden through foliage and guarded by a fence. There is a 20 metre metre drop below my vantage point. Time to head back to the mainland. The seas were quite rough (this picture does it no justice at all - it really needs a video - maybe you can get an idea from the spray being blown sideways), and the catamaran's high position in the water caused it to roll with each swell. 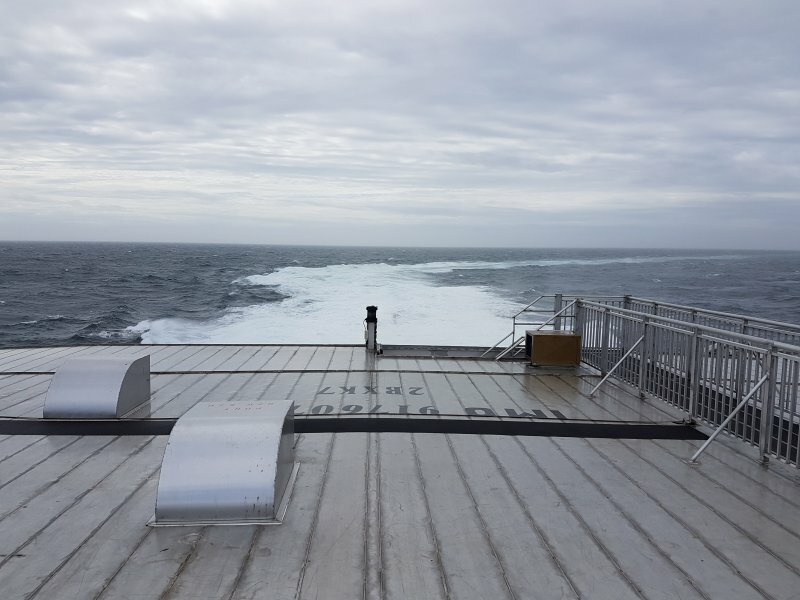 With many of the passengers getting sea sick, I preferred to ride outside in the strong winds, seeing if I could surf on the deck. Dodging the splashes that occasionally got thrown all the way back over the ship when a big swell hit. Great fun. 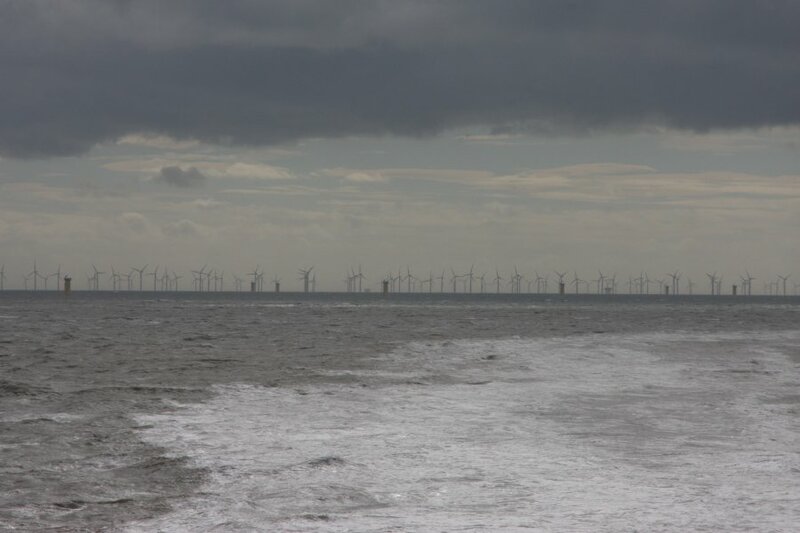 Gwynt y Môr, one of the largest offshore wind farms in the World, off the North Wales coast. 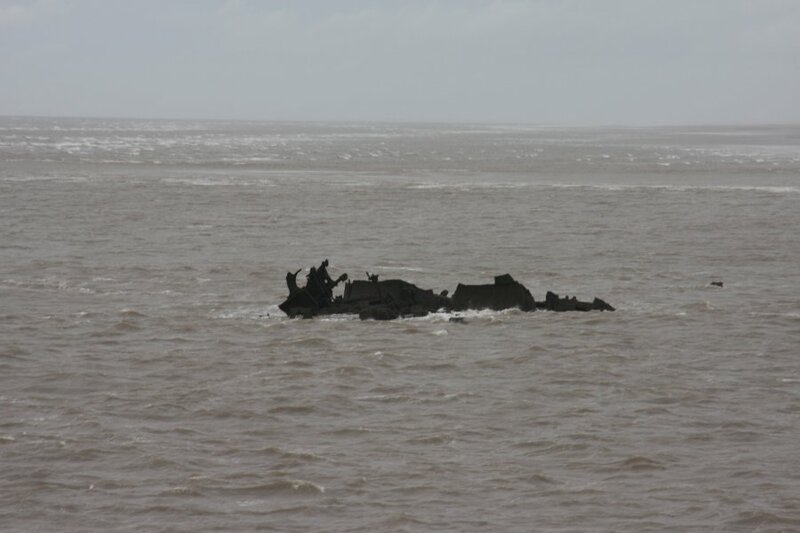 Remains of a shipwreck in Liverpool Bay. 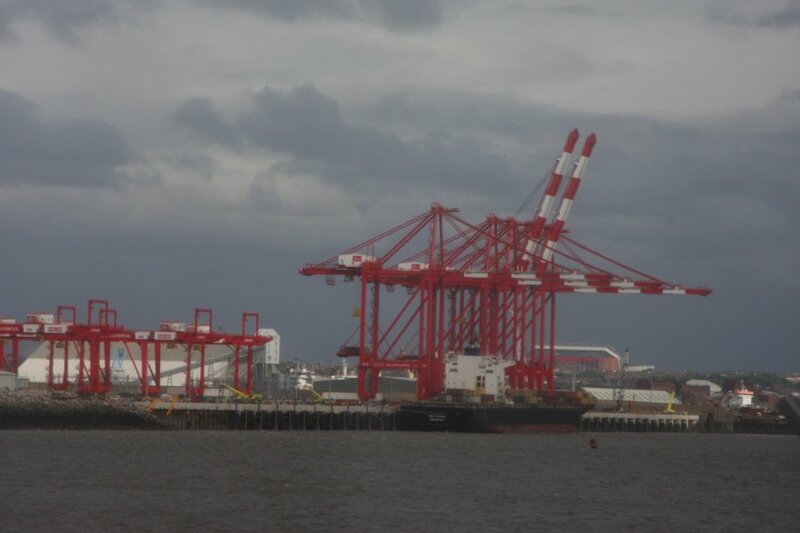 Simply enormous cranes at the Liverpool docks. To give a sense of scale, that is a container ship, with 7 floors in the control tower above the deck, and a couple more in the small tower. Each of those containers is the back of an articulated lorry. 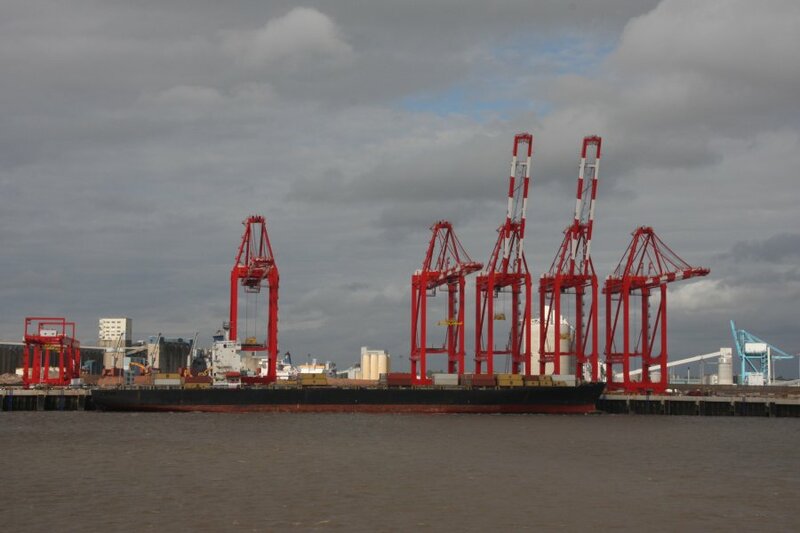 And they are absolutely dwarfed by the cranes. 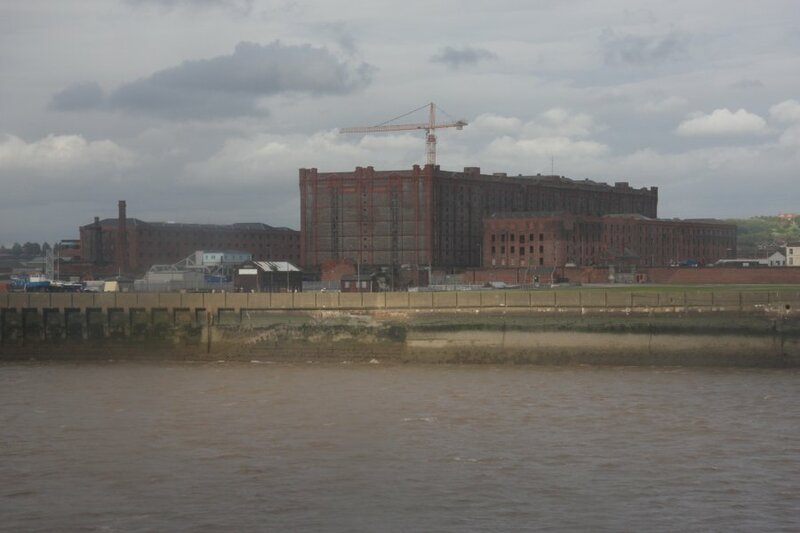 Giant warehouses at Stanley Dock, dating from around 1850. Liverpool centre. 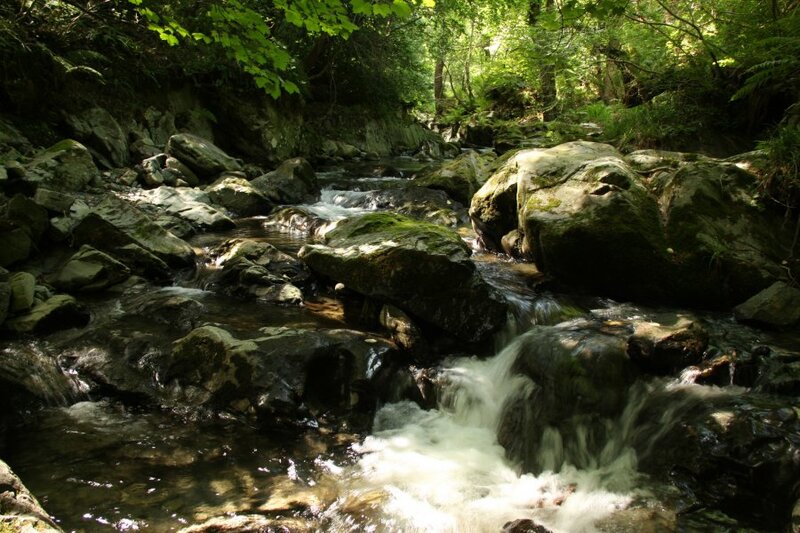 The name is originally Welsh; a variant of laver pwll or llif pwll, meaning seaweed pool or Atlantic/flood pool/port. Canada Boulevard, the Liverpool Pier Head road, with the Royal Liver Building (1911), Cunard Building (1916) and Port of Liverpool Building (1907). 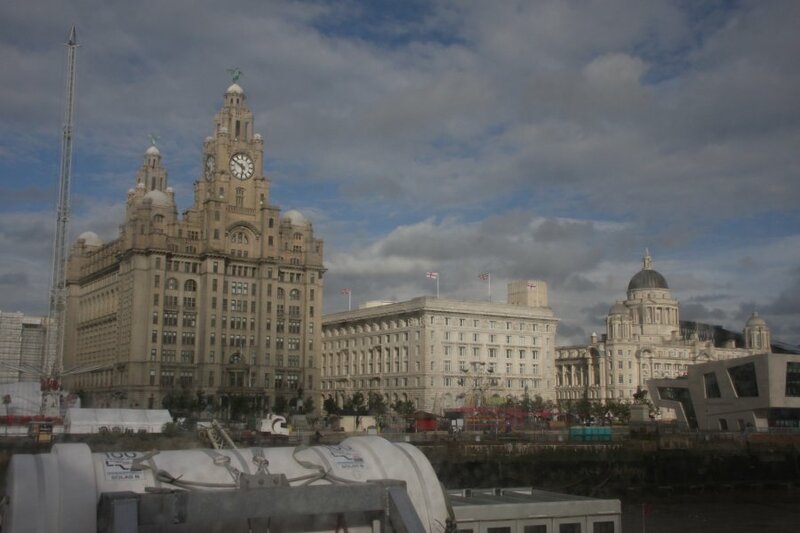 The birds on the top of the first building are the Liver Birds that watch over the city. 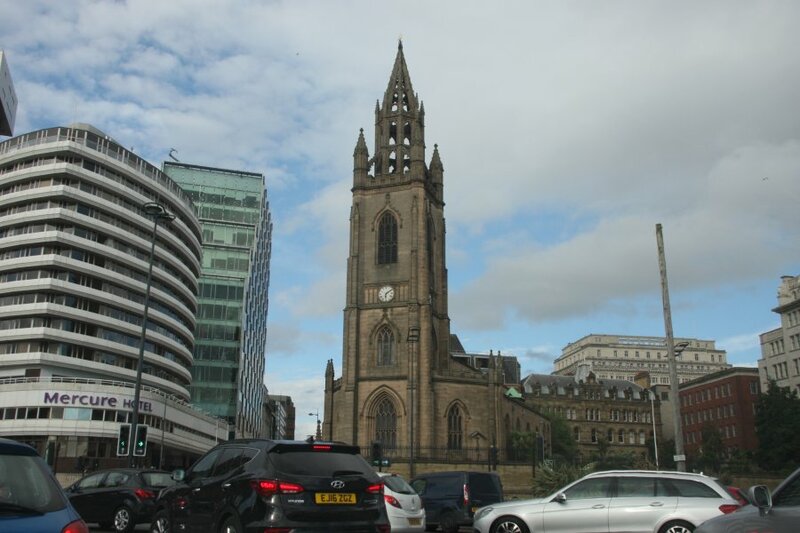 Heavy traffic at the Church of Our Lady and Saint Nicholas (1815) in Liverpool. 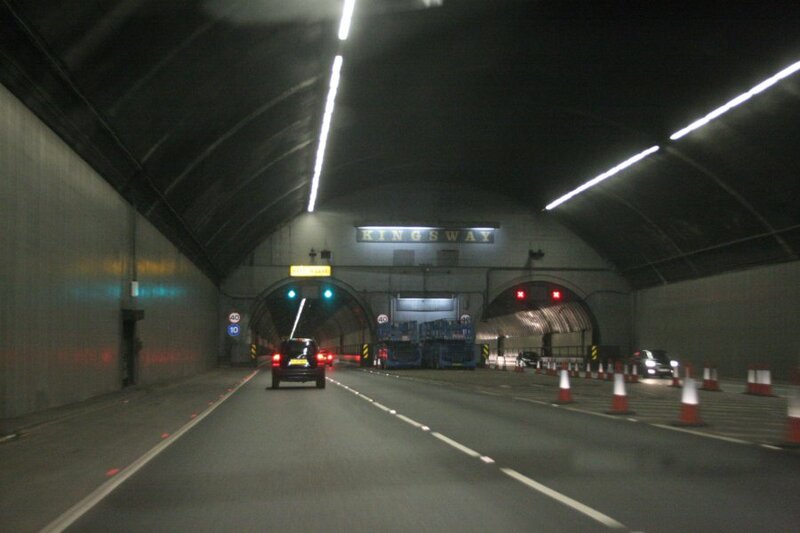 Heading into the darkness of Kingsway Tunnel and the end of the gallery. There are tolls on the other side of this, by the way, but they don't tell you that until you get there. 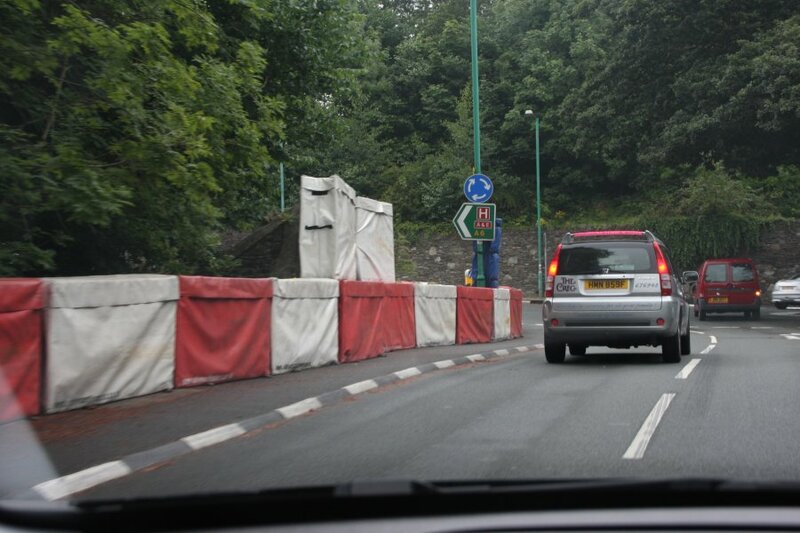 The UK does not accept Isle of Man bank notes, and although the toll booths take cards, they make you park on the naughty step and wait for someone to collect payment. Welcome to Birkenhead.